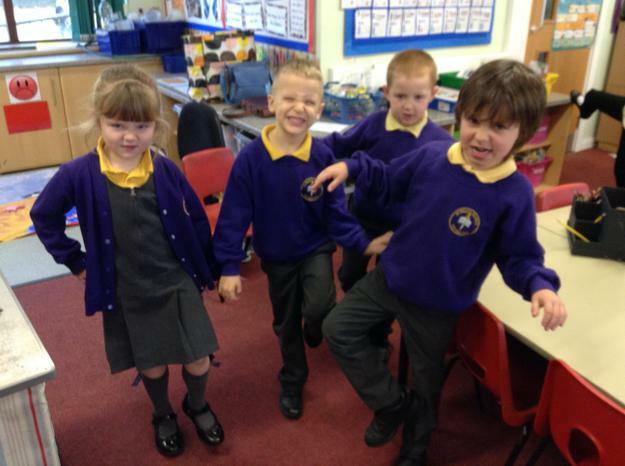 Welcome back to school after the Easter holiday. 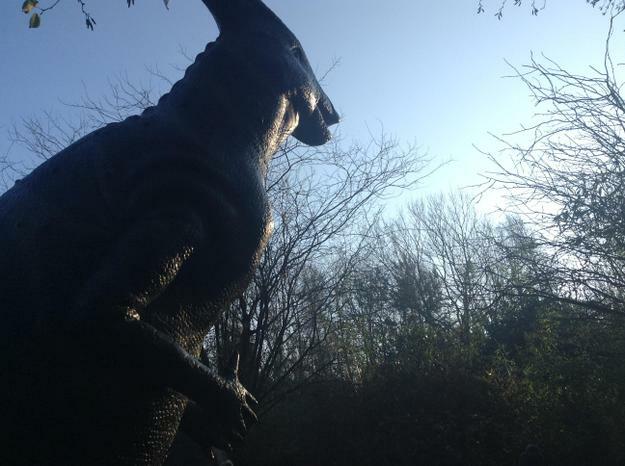 I hope you all had a very happy Easter time. 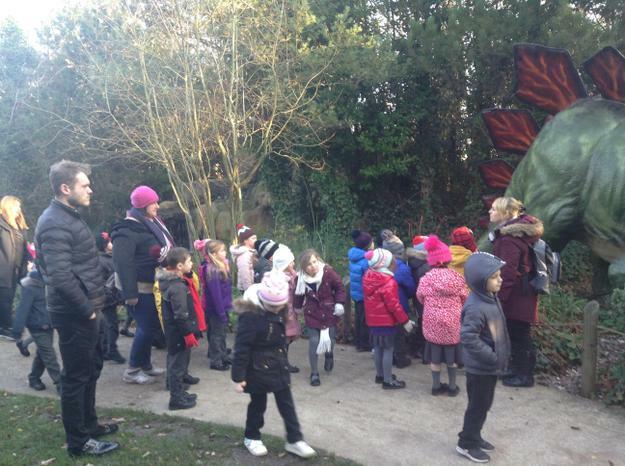 Our topic in Year 1 this half term is going to be The Enchanted Woodland. 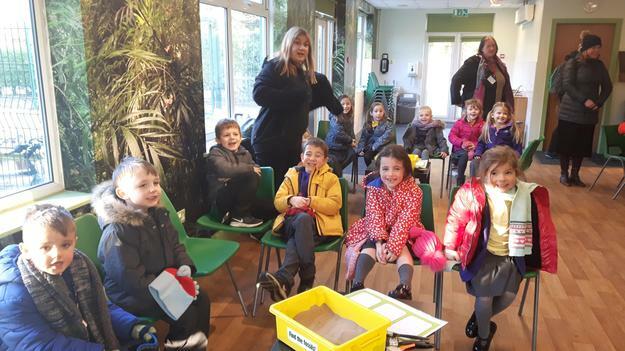 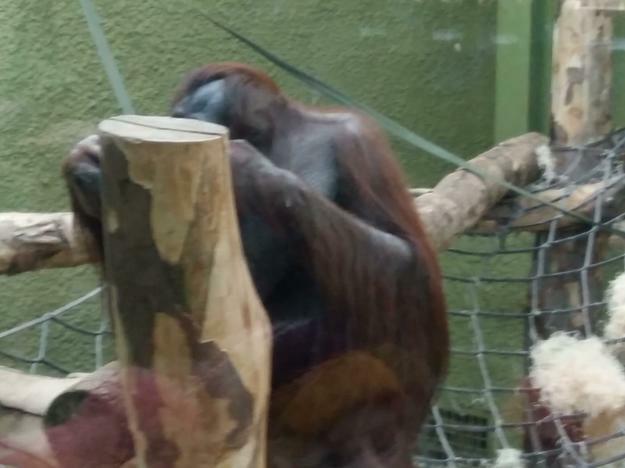 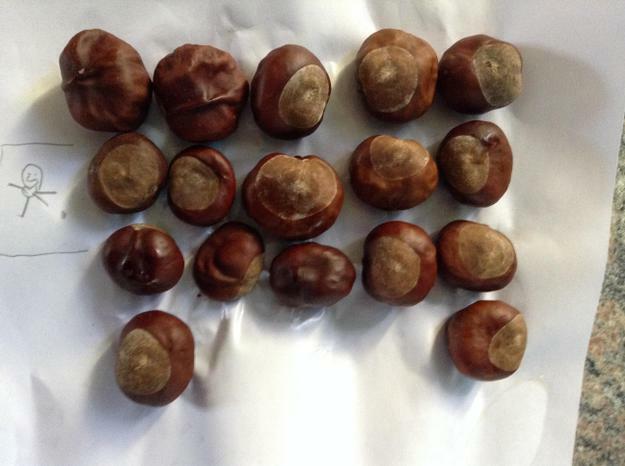 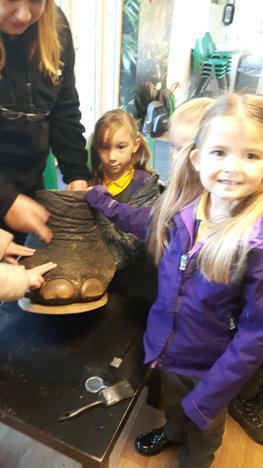 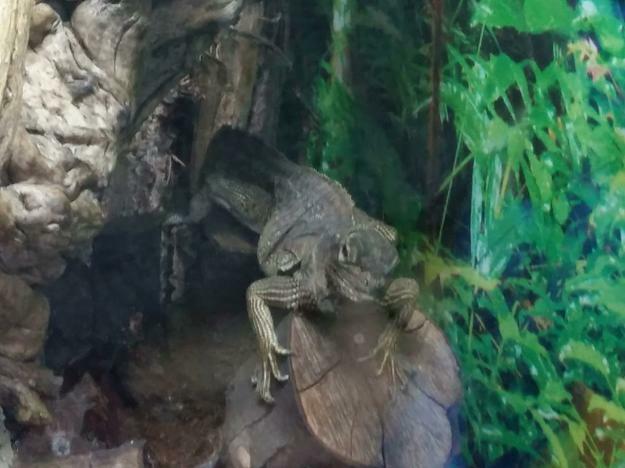 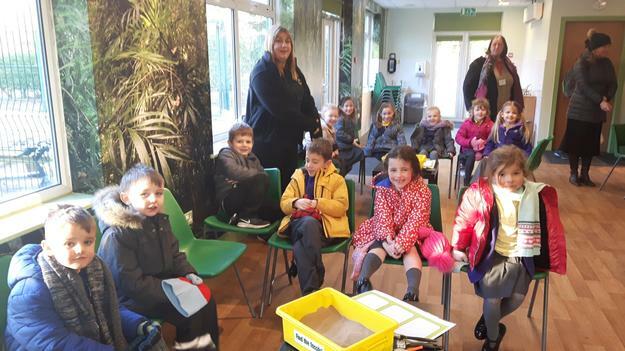 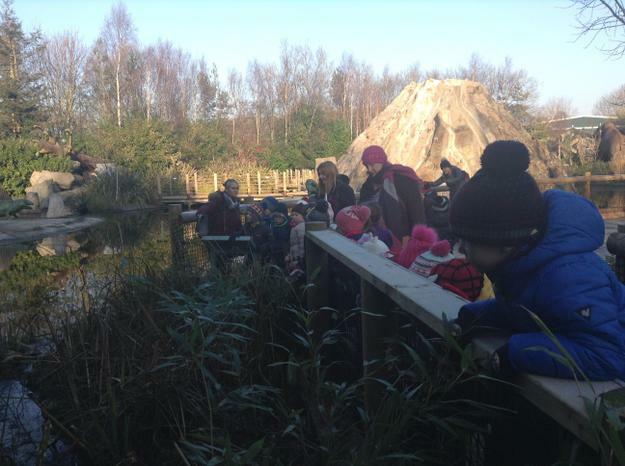 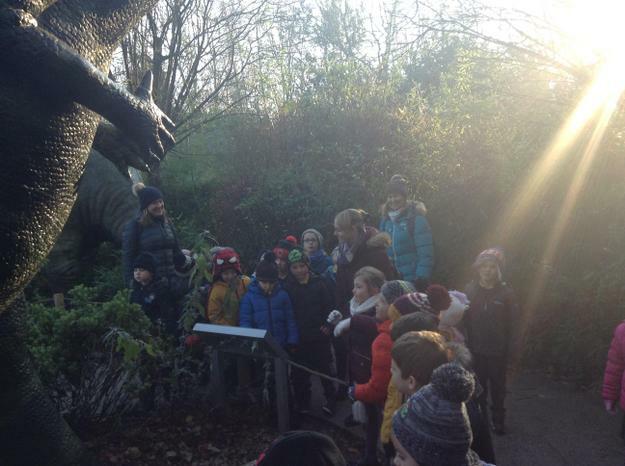 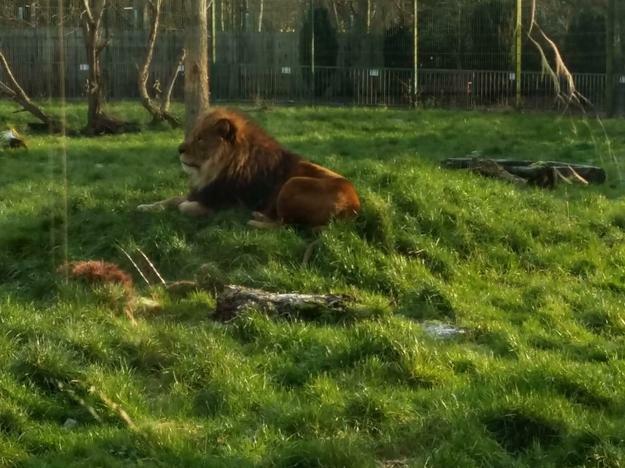 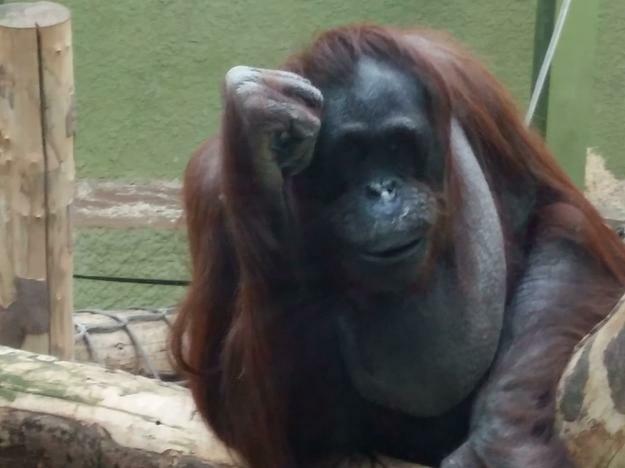 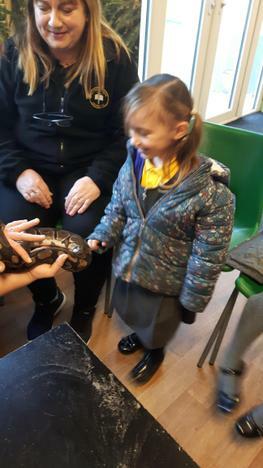 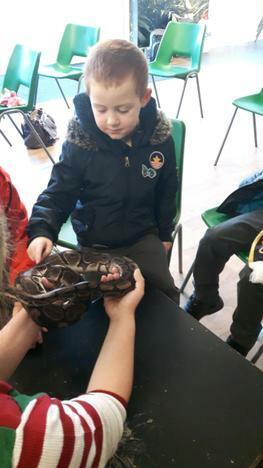 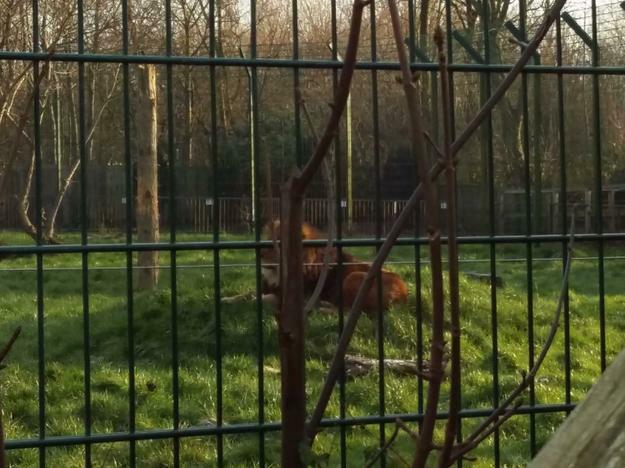 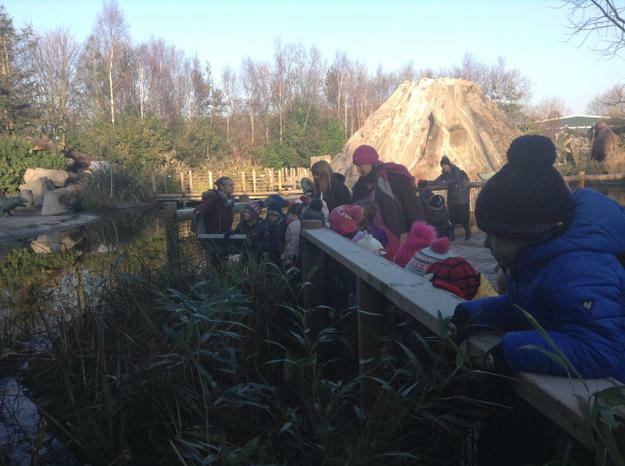 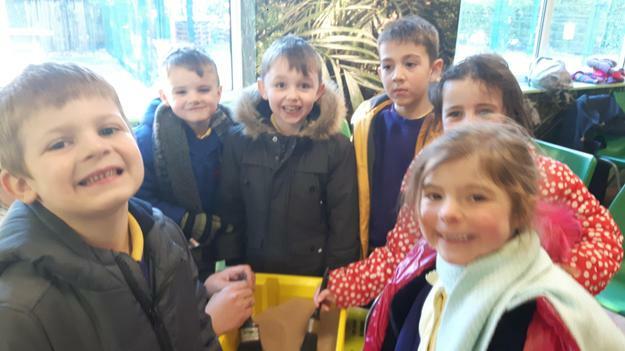 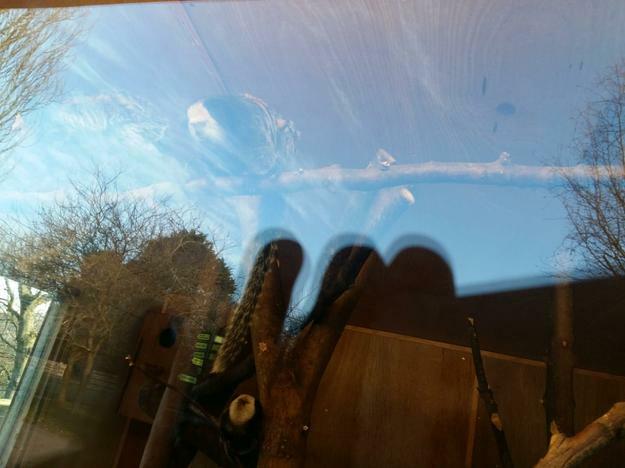 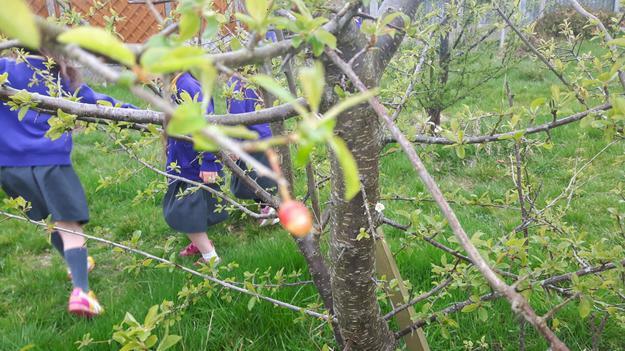 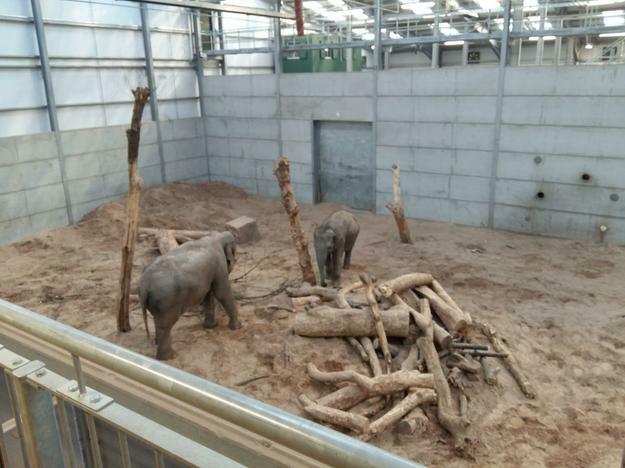 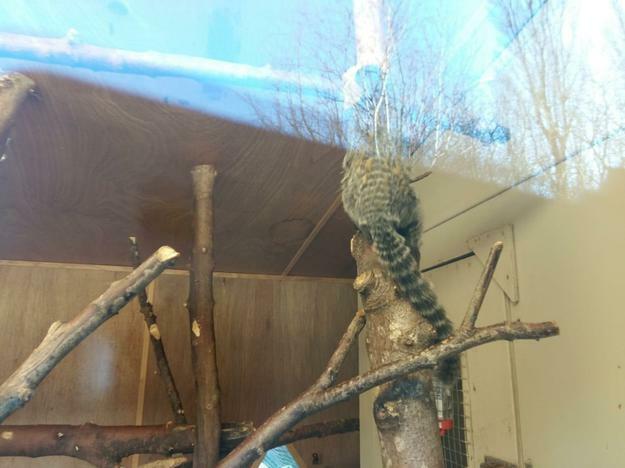 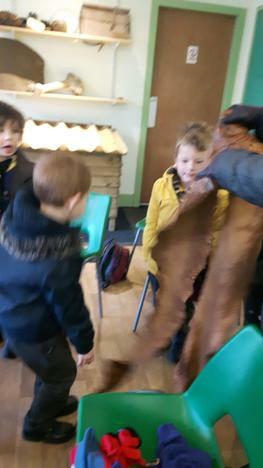 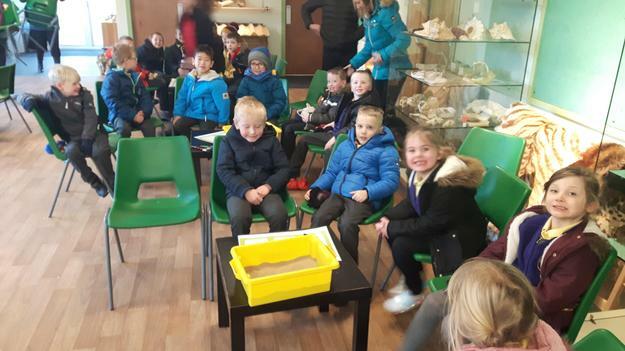 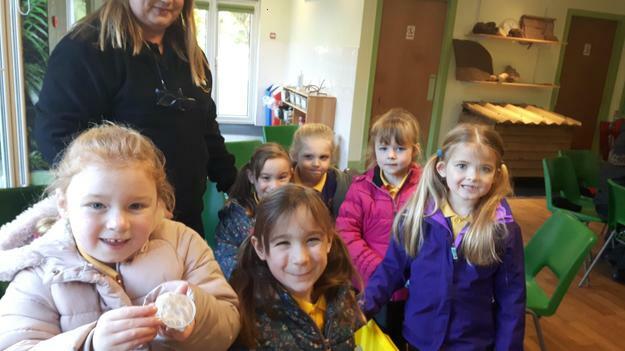 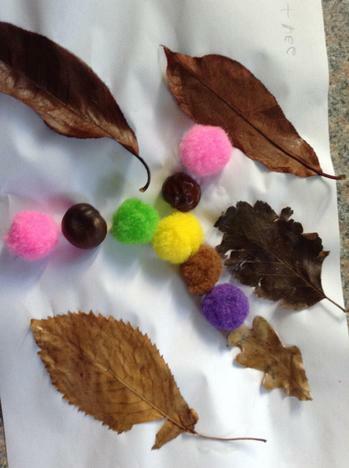 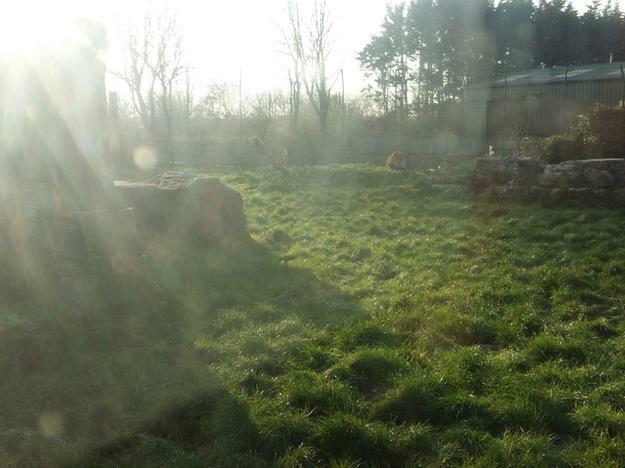 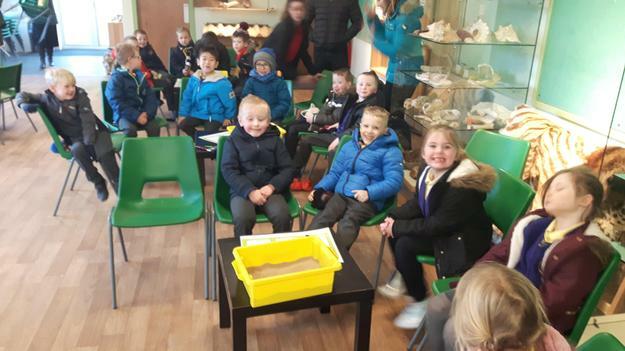 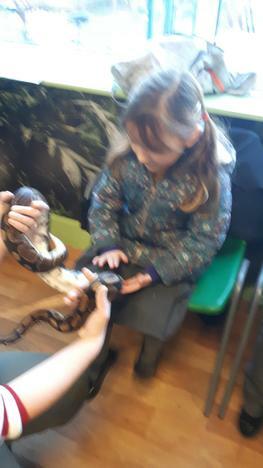 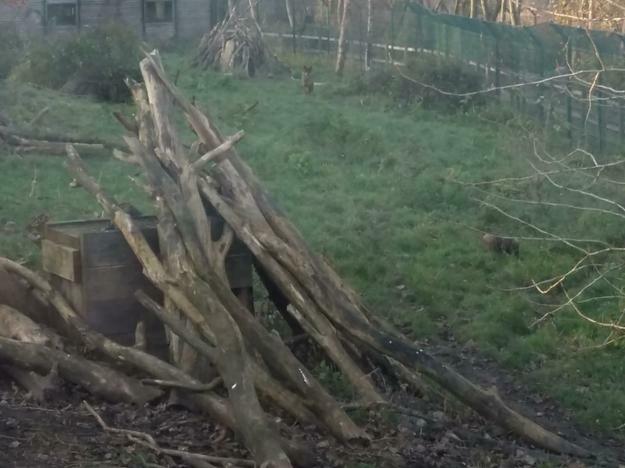 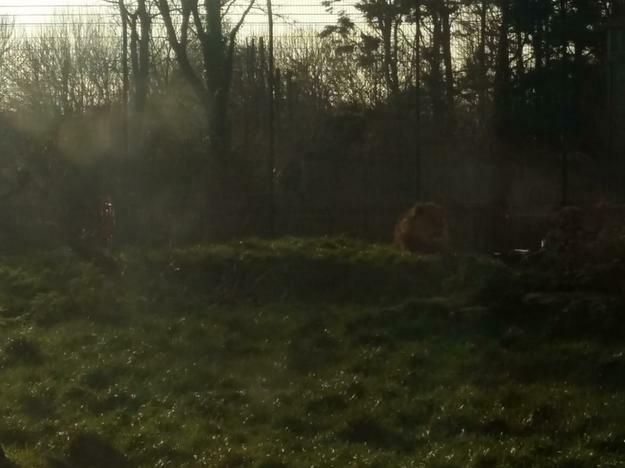 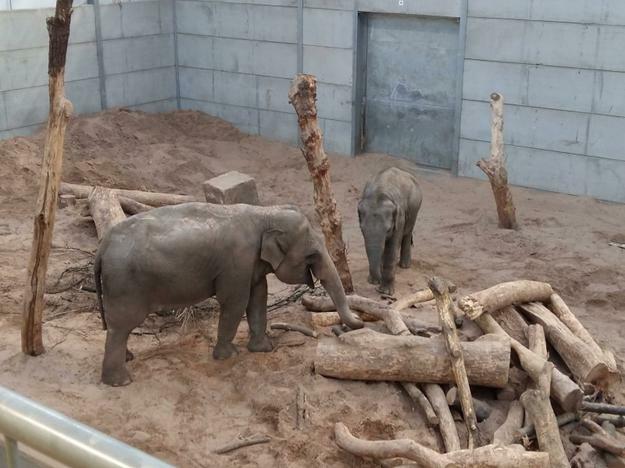 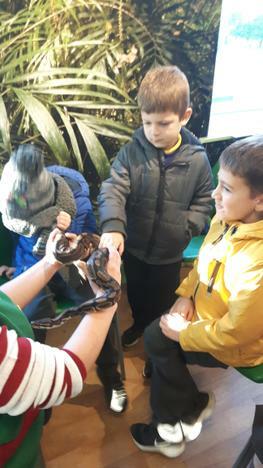 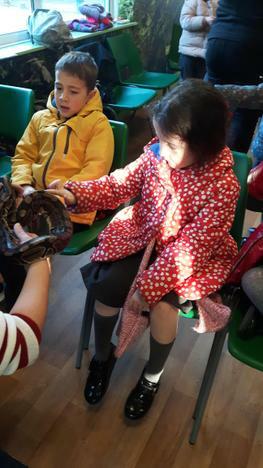 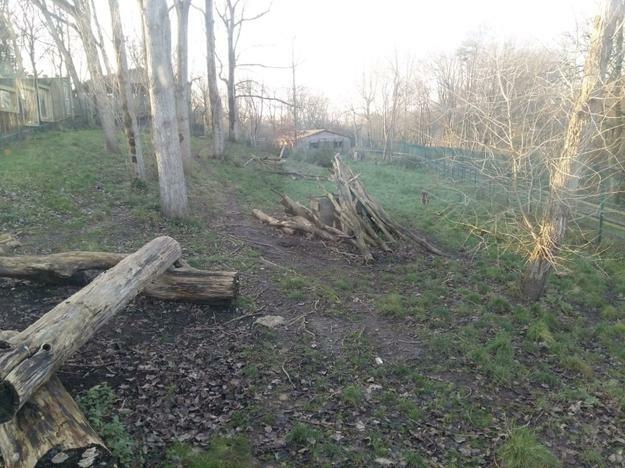 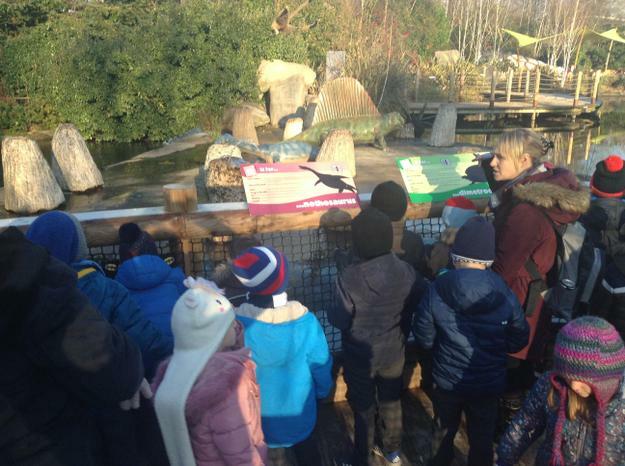 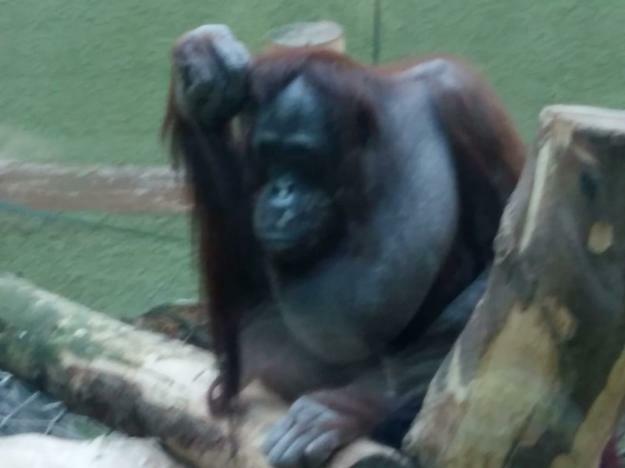 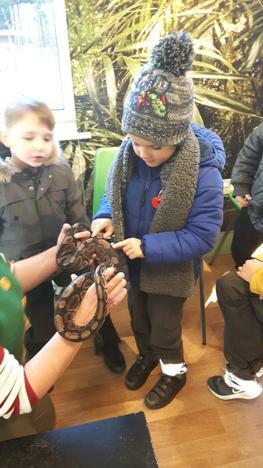 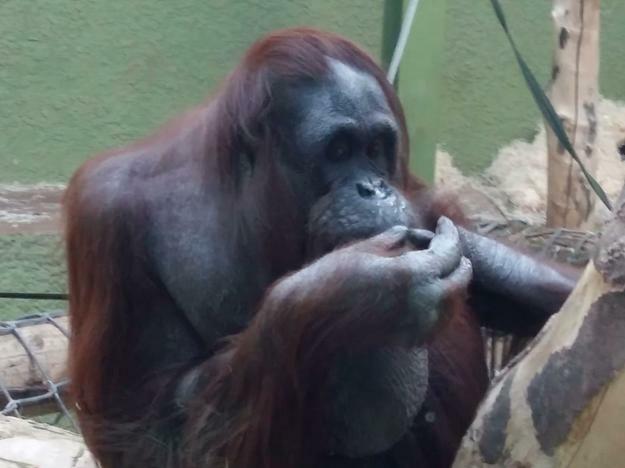 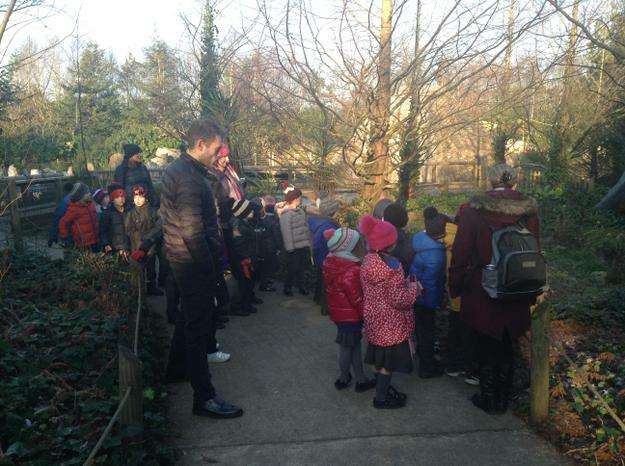 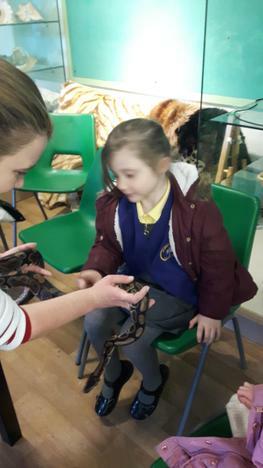 During this topic the children will be learning a lot about the types of trees and plants that grow in woodlands and about the types of animals that like to live in areas of woodland. 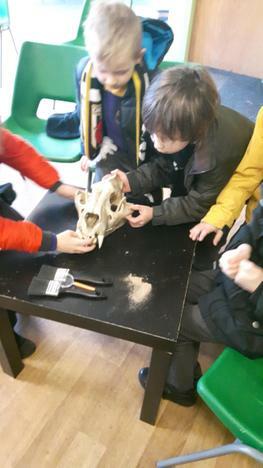 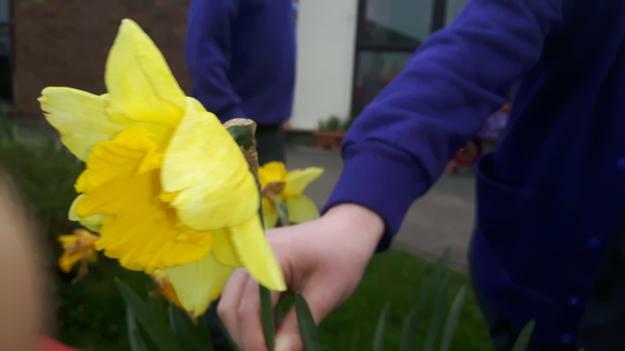 There will be a lot of science and art work taking place throughout this topic and opportunities for the children to take their learning outside. 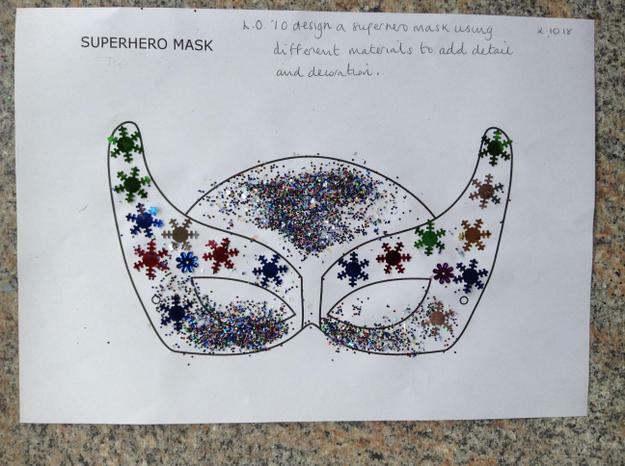 I have attached the parent information sheet for this topic so you have a little overview of what we will be covering and the home learning sheet that will become the children's 'Pick and Mix' homework tasks. 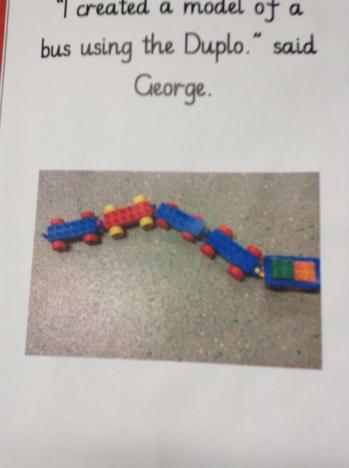 Just a little reminder that our PE days will be Monday and Friday and our library day will be on Mondays too. 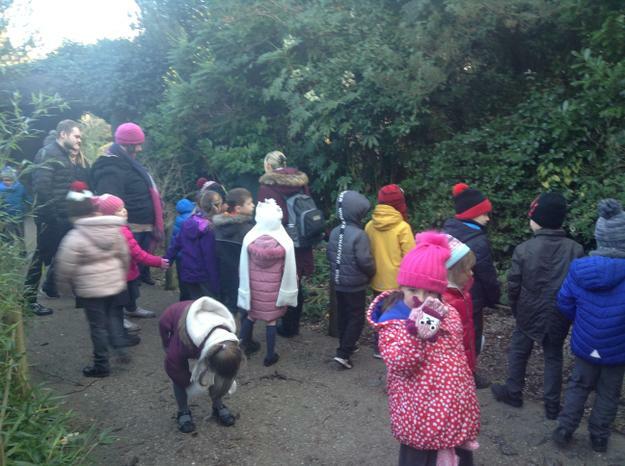 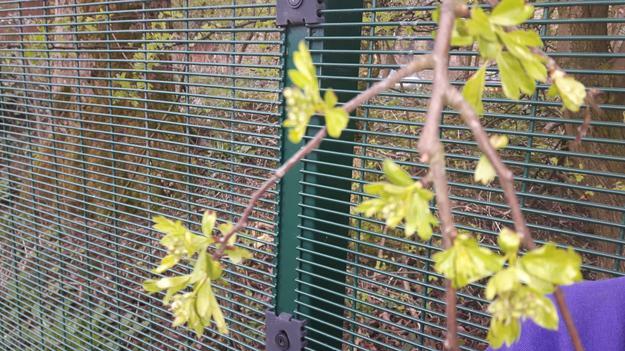 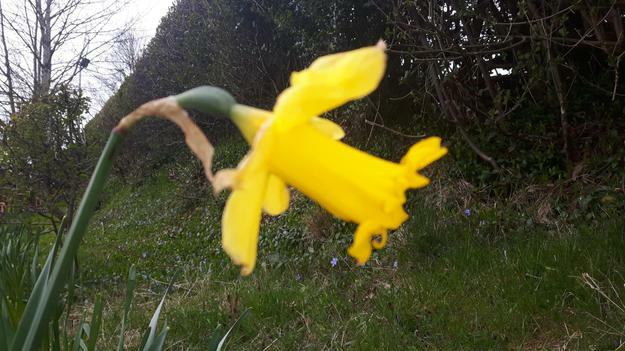 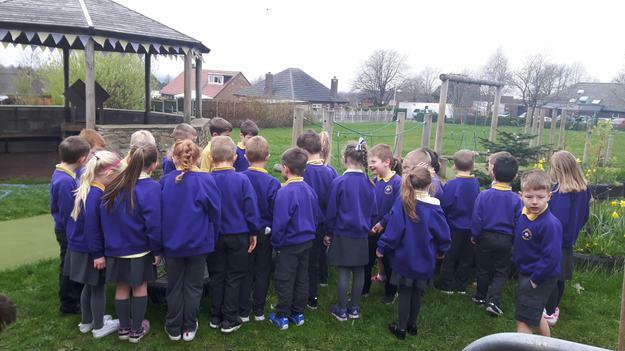 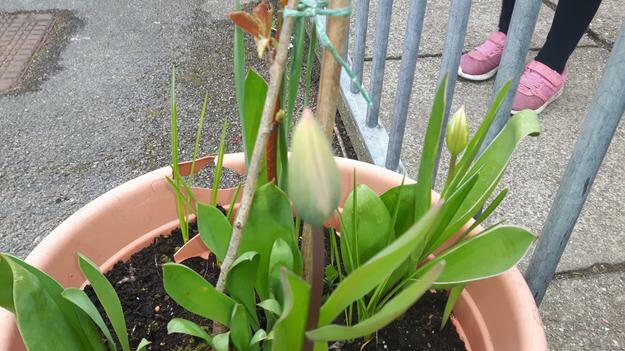 We went on a Spring Walk to look for signs of new life growing in our school grounds. 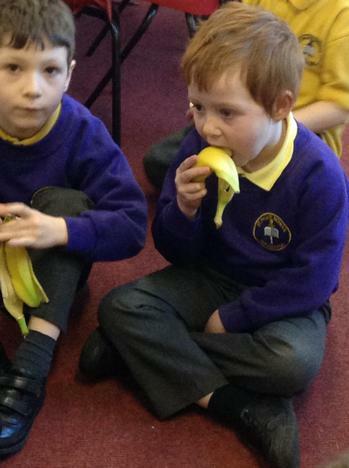 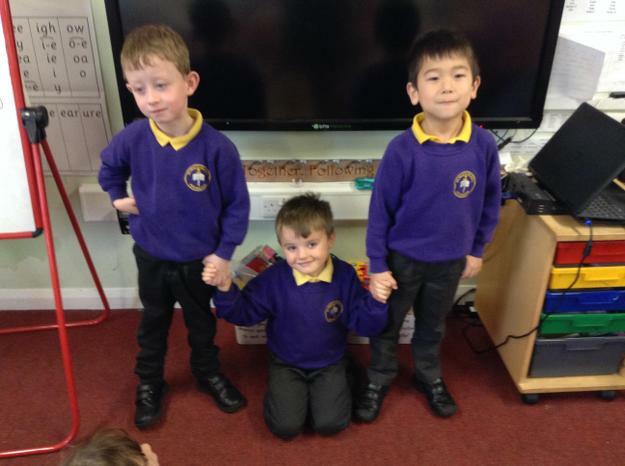 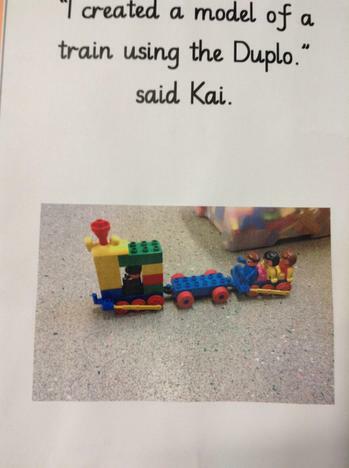 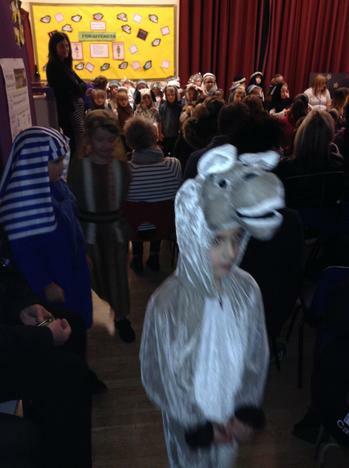 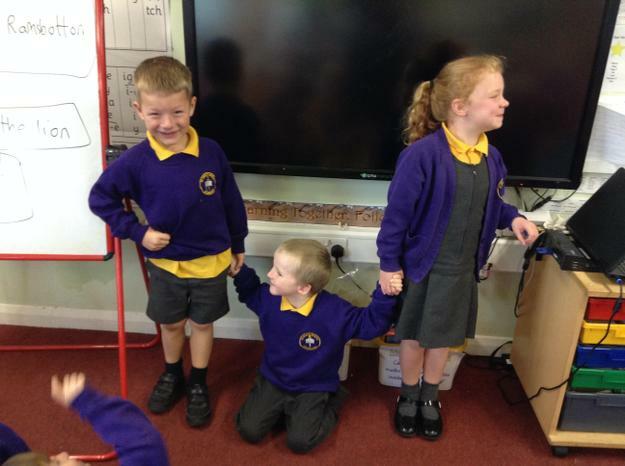 In RE we have been learning about the story of Joseph and his brothers. 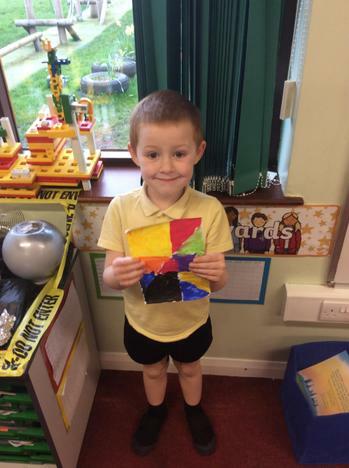 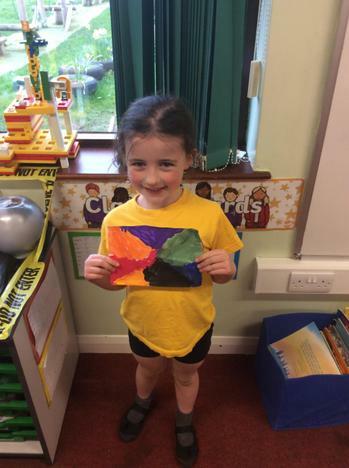 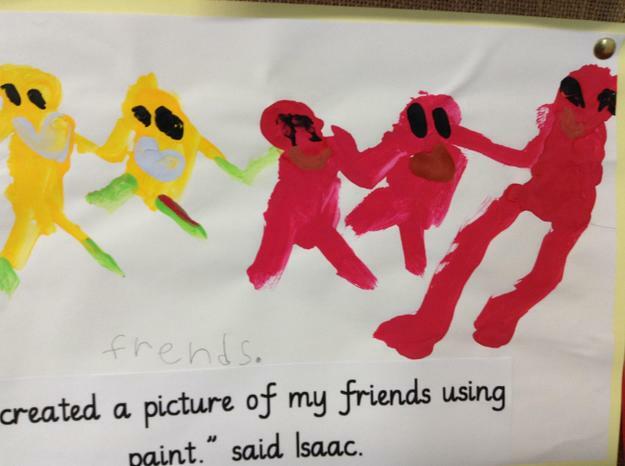 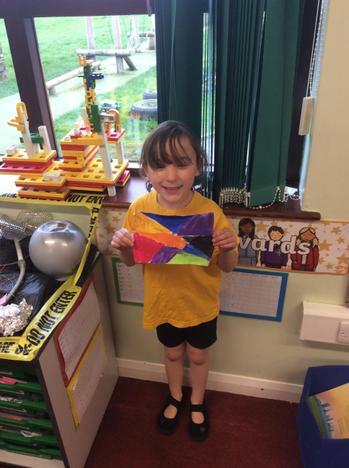 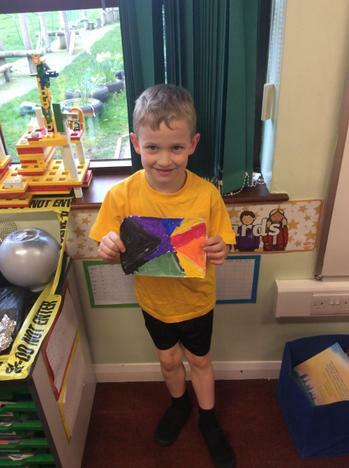 After we had the second part of the story about Joseph being a prisoner, the children created an abstract painting to show how his feelings changed during this time. 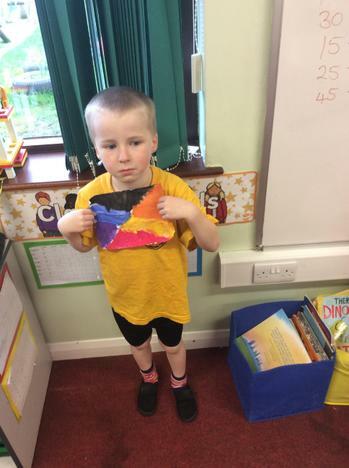 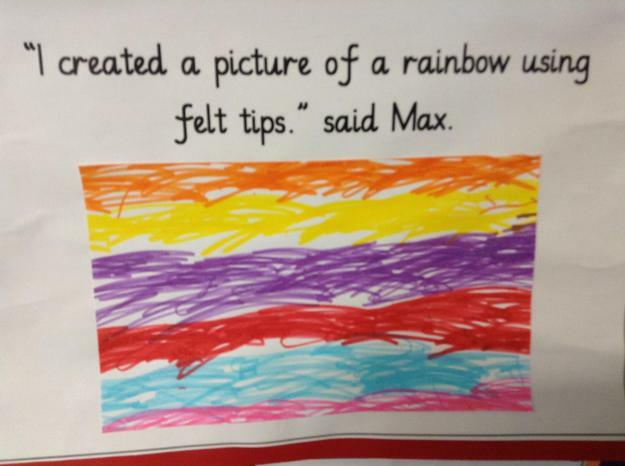 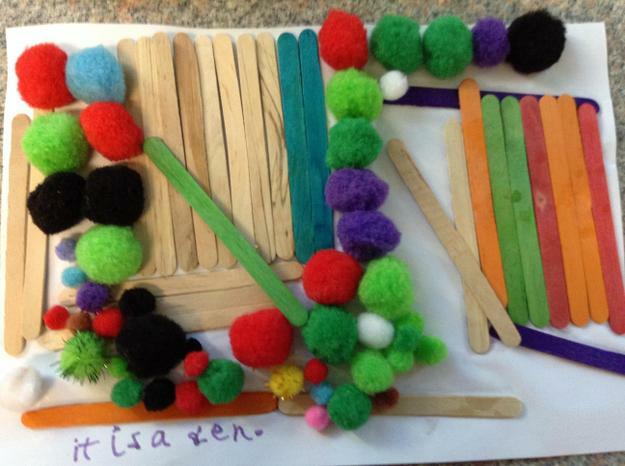 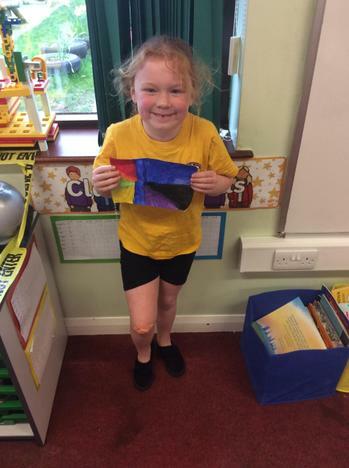 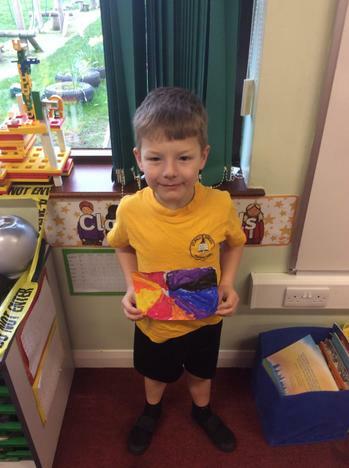 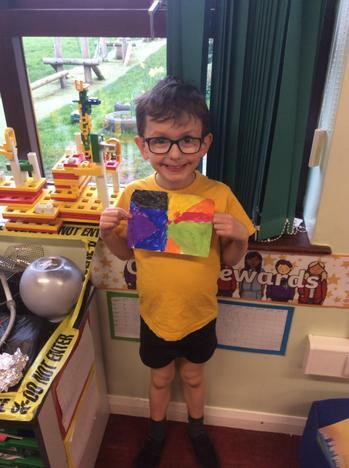 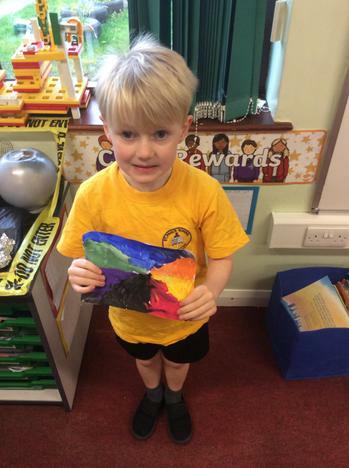 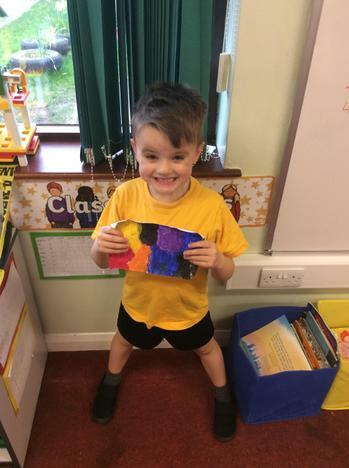 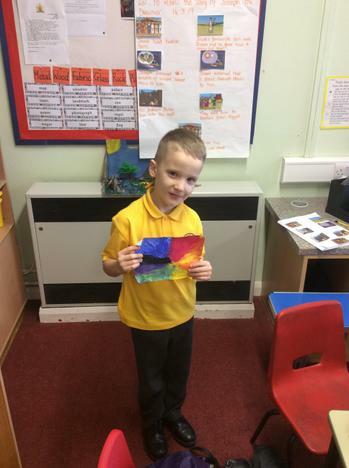 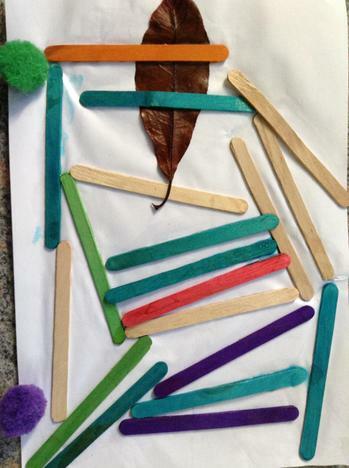 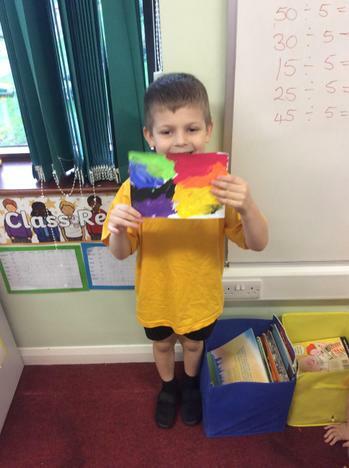 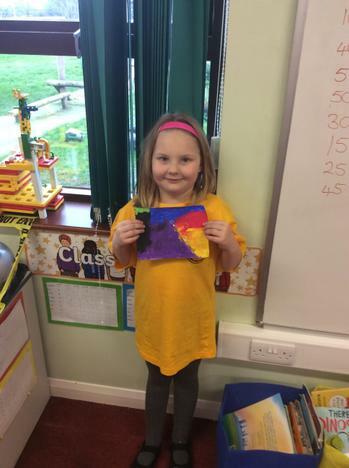 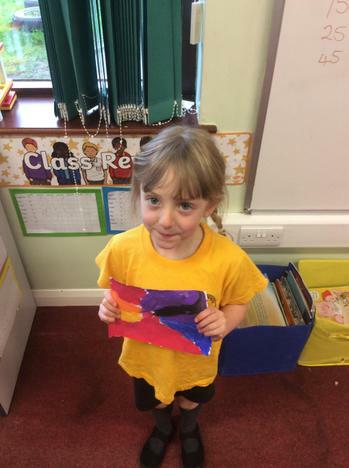 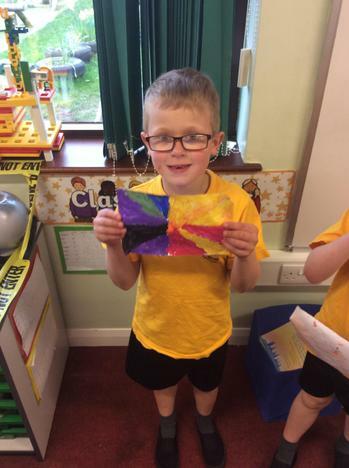 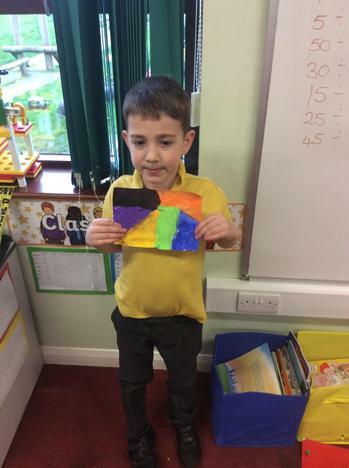 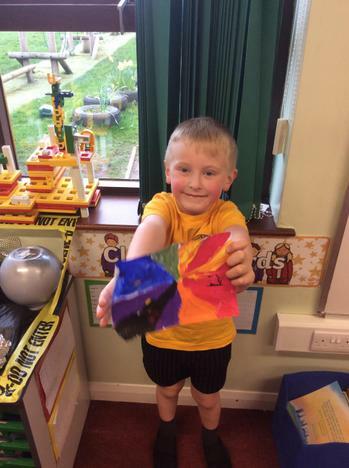 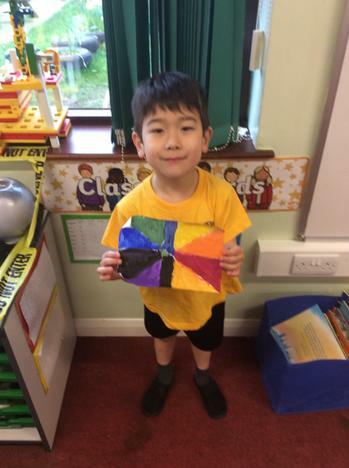 The children used cold colours to represent his feelings of despair and misery and warm colours to represent his feelings of happiness and contentment. 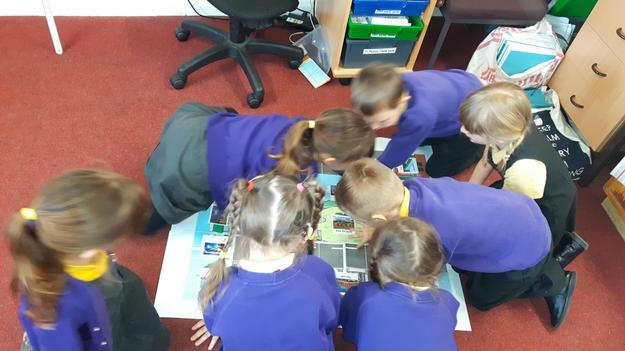 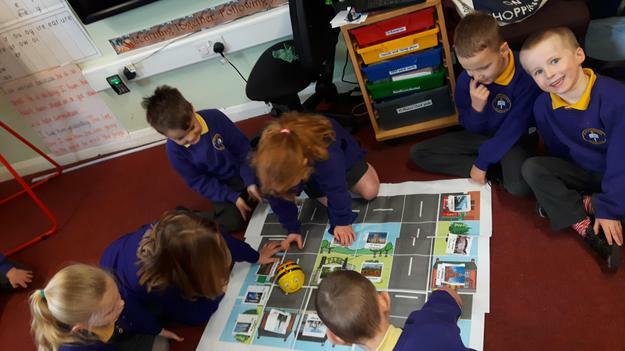 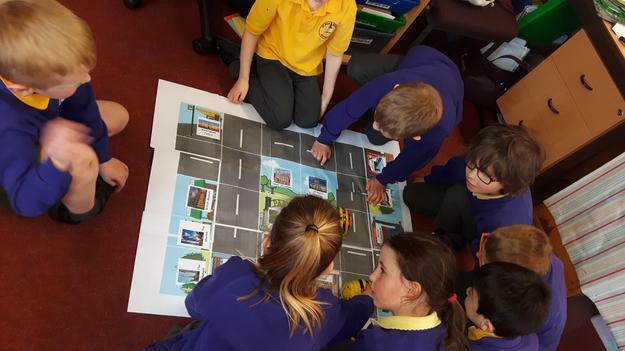 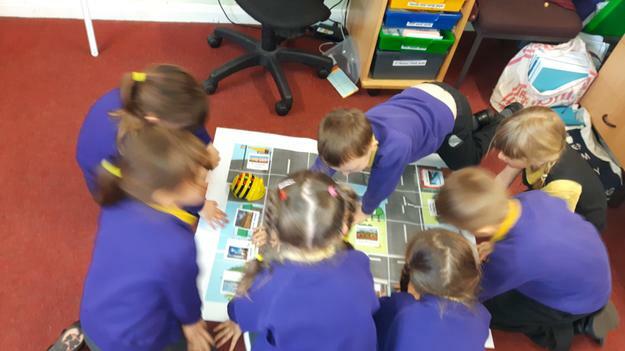 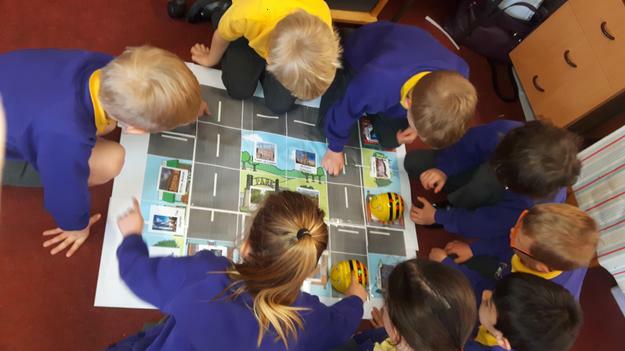 We programmed the Beebots to travel round the London Landmarks on the map. 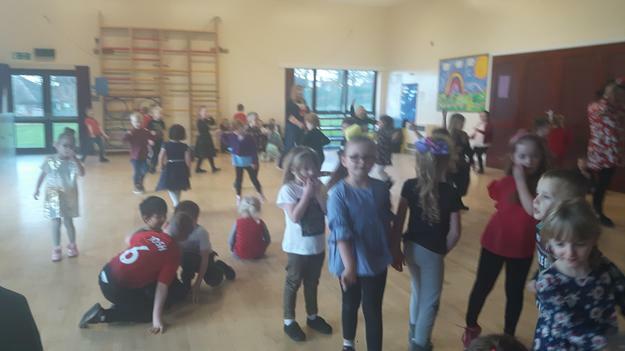 Welcome back after the half term break. 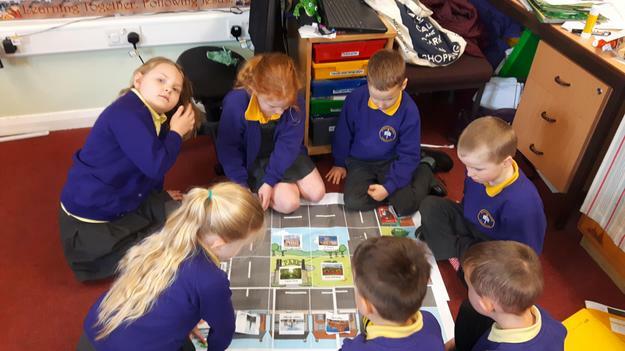 We are going to be learning all about London, The Royal Family and the Great Fire of London through our topic called 'Bright Lights Big City'. 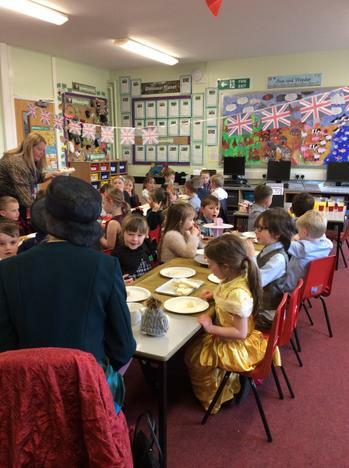 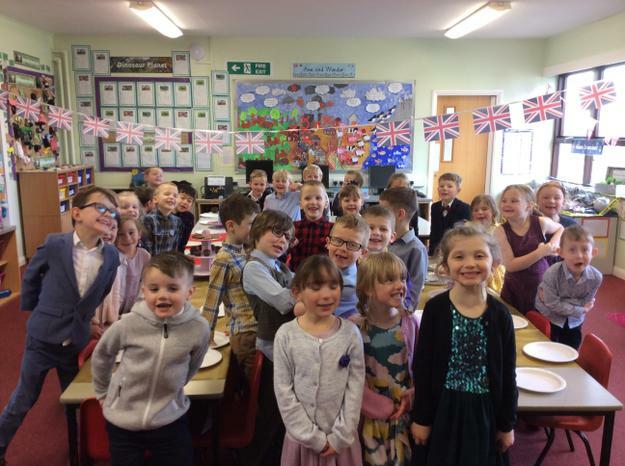 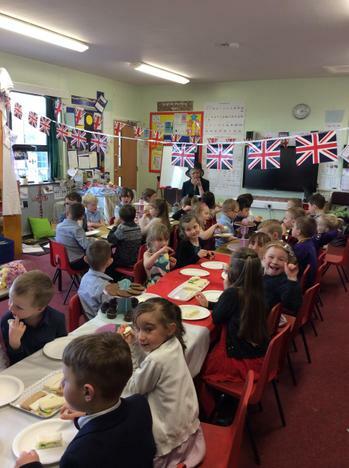 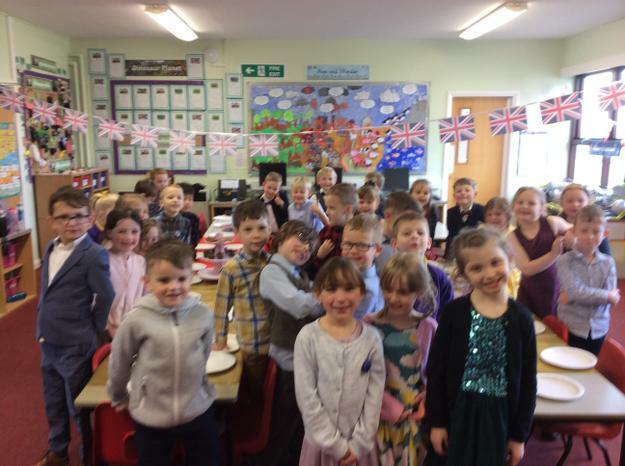 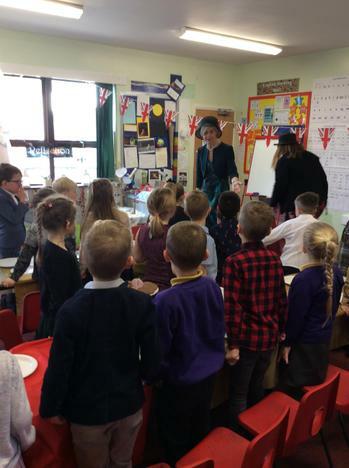 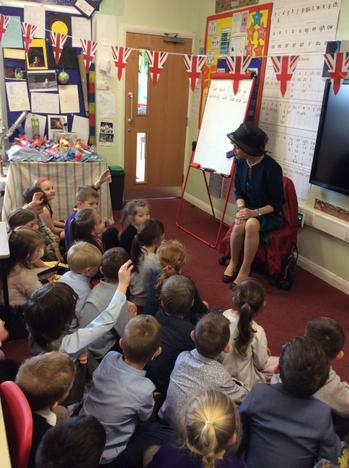 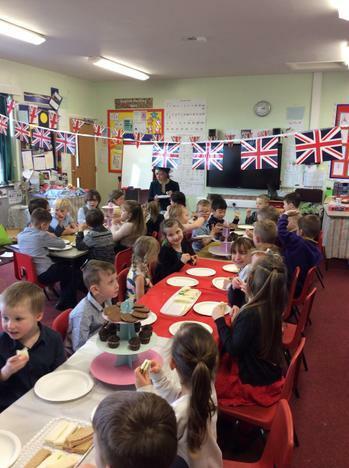 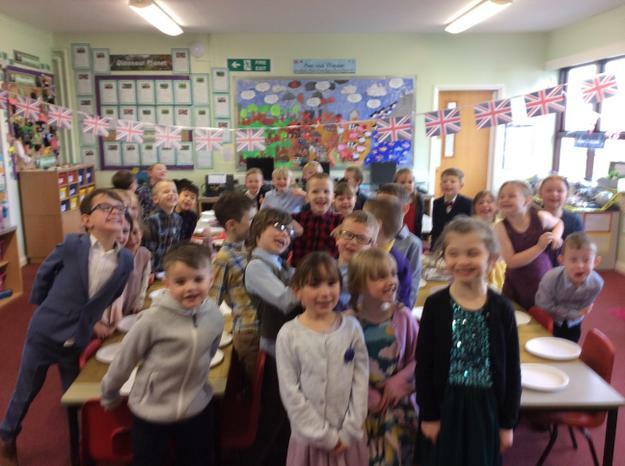 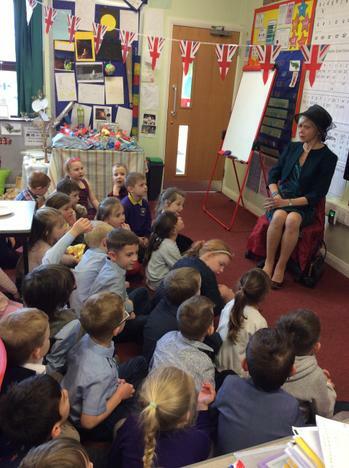 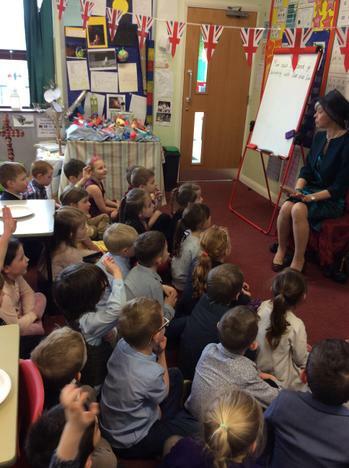 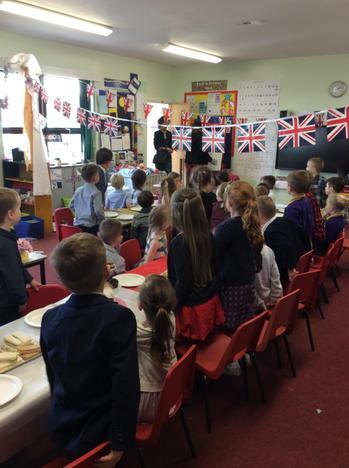 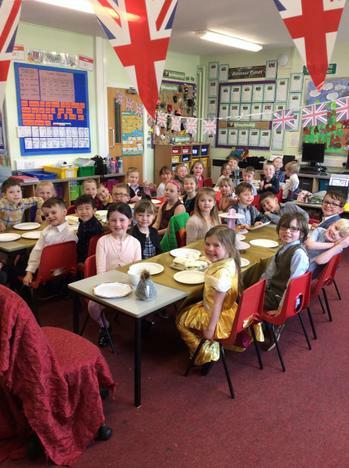 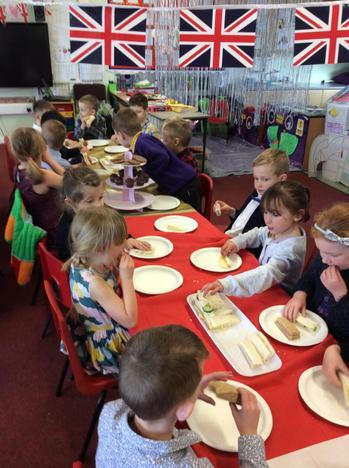 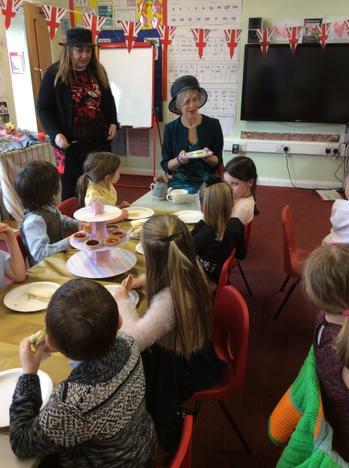 The wow activity for the children will be meeting 'The Queen' and having afternoon tea with her. 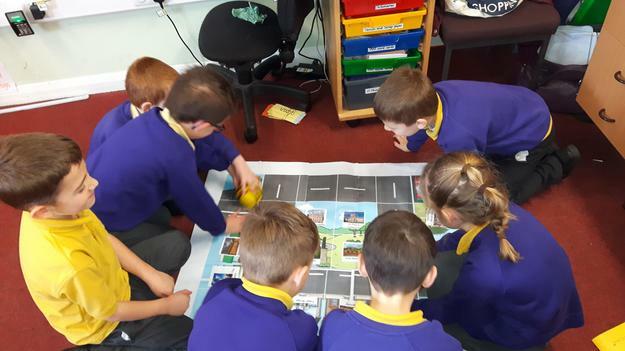 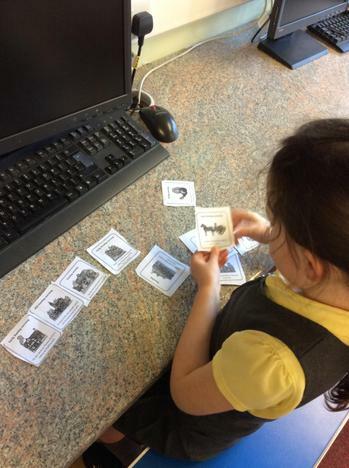 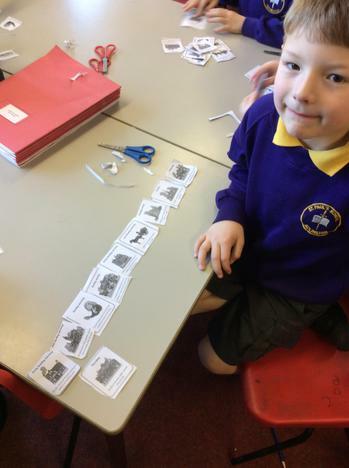 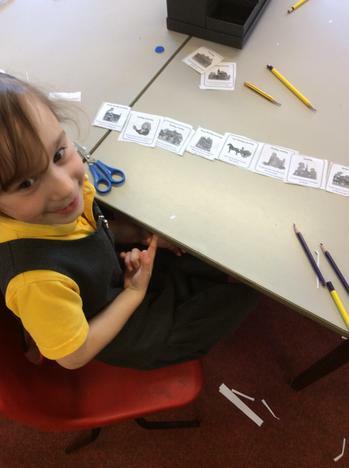 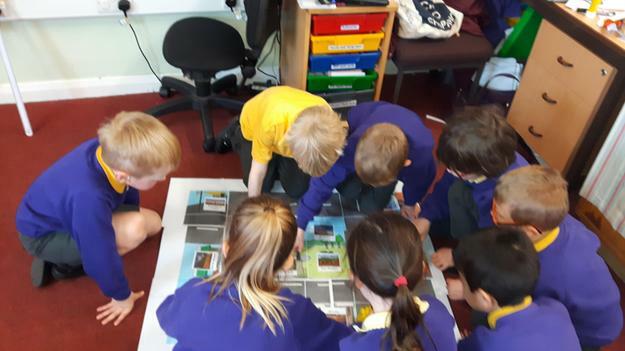 The children will then do a lot of work inn Geography looking at the landmarks of London, in History where they will discover all about the Great Fire of London in 1666 and in Design Technology where they will make a moving fire engine as well as other aspects of the curriculum too. 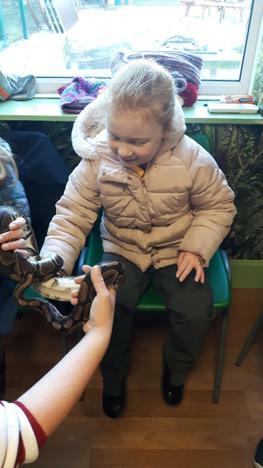 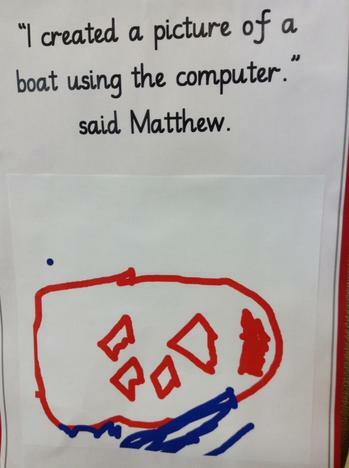 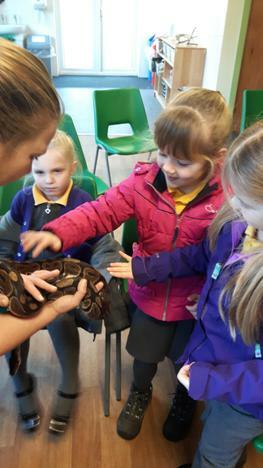 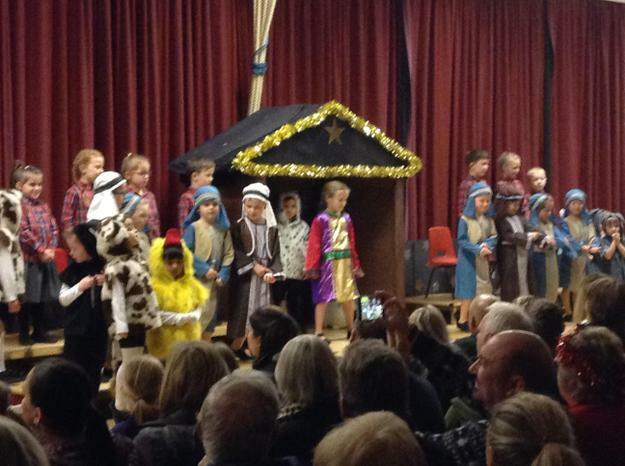 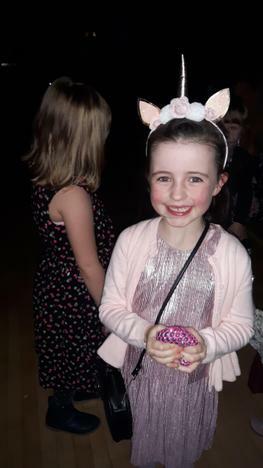 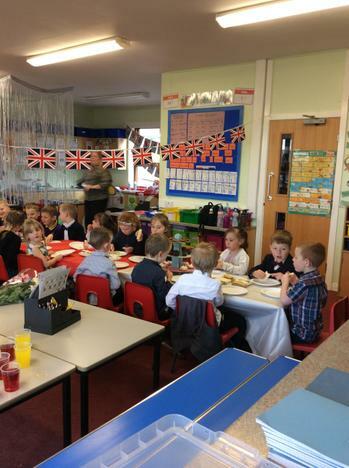 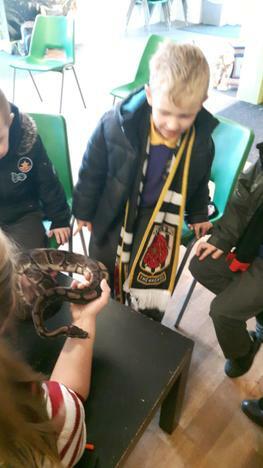 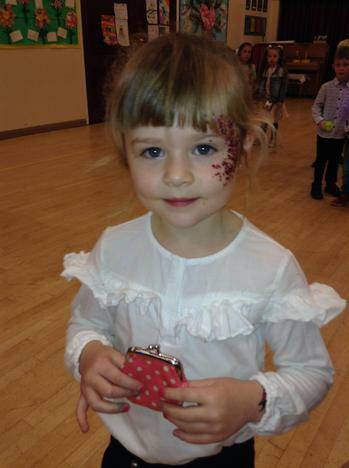 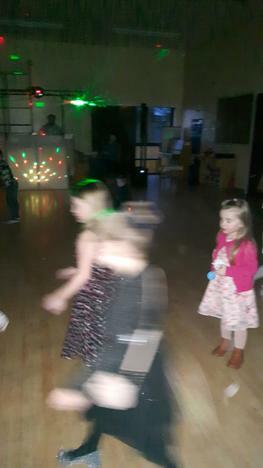 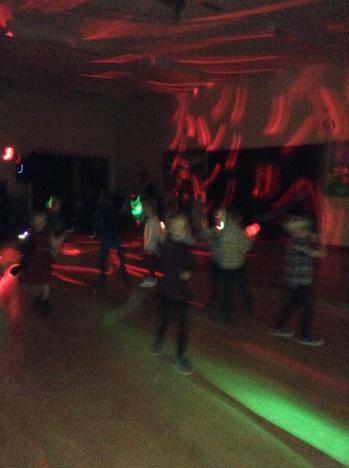 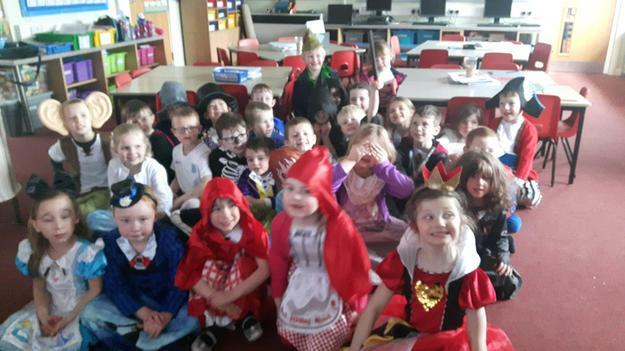 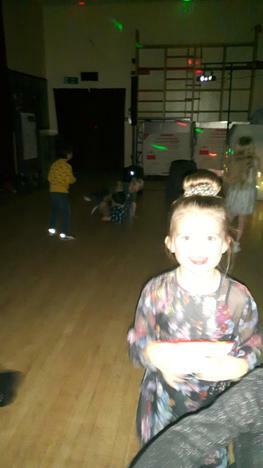 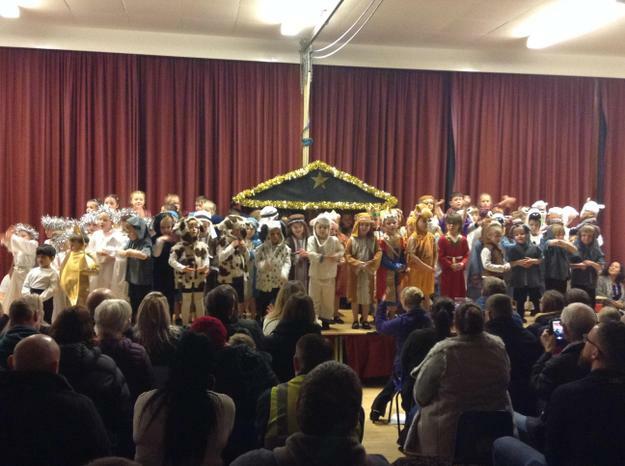 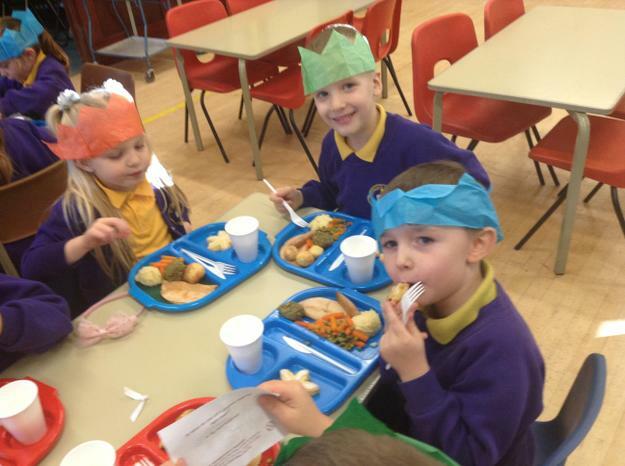 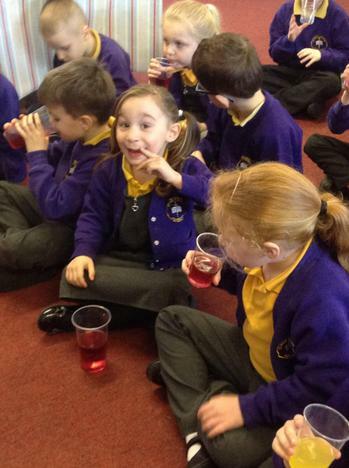 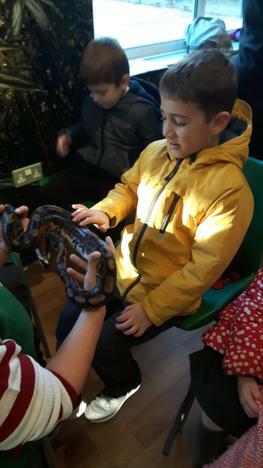 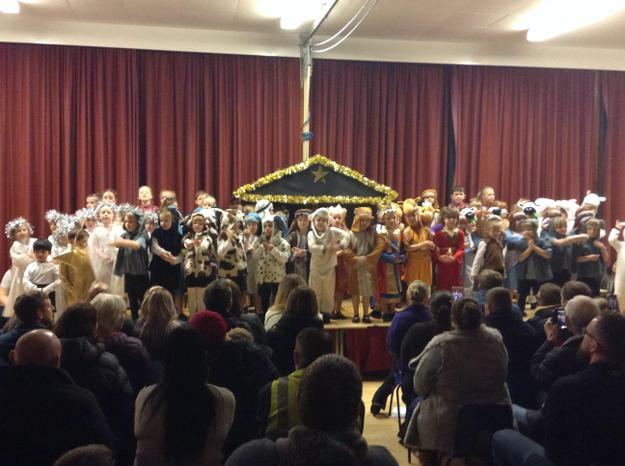 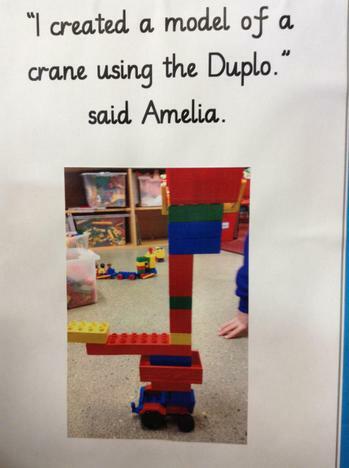 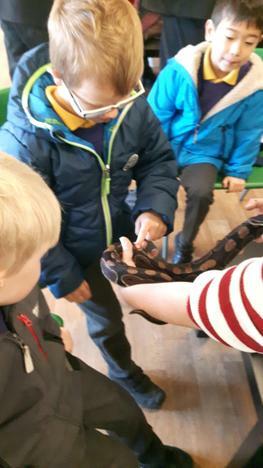 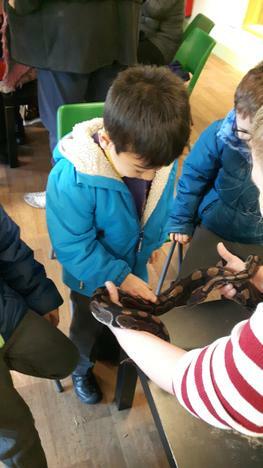 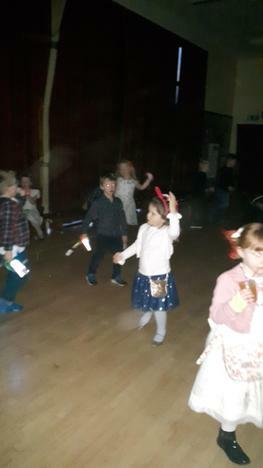 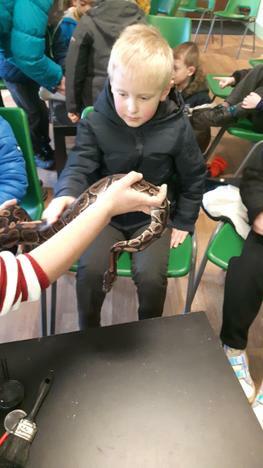 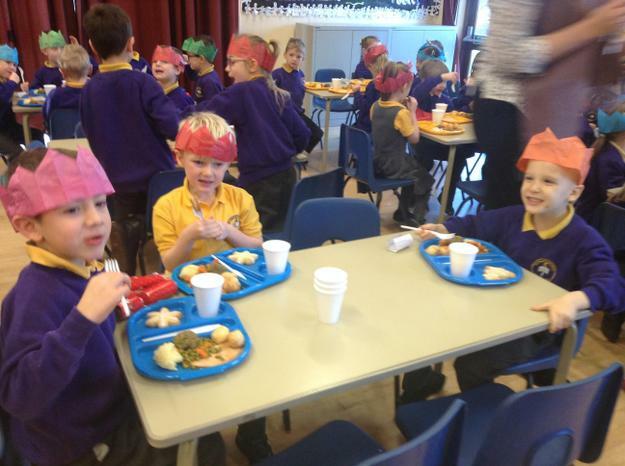 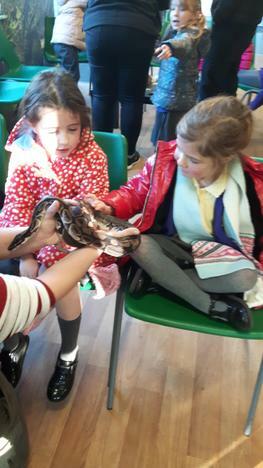 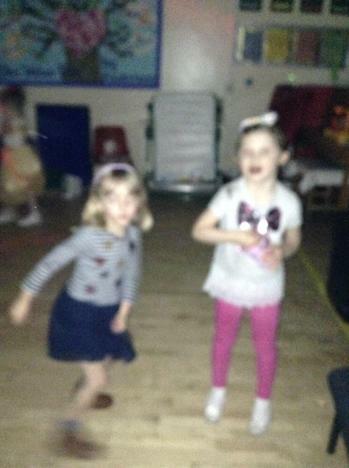 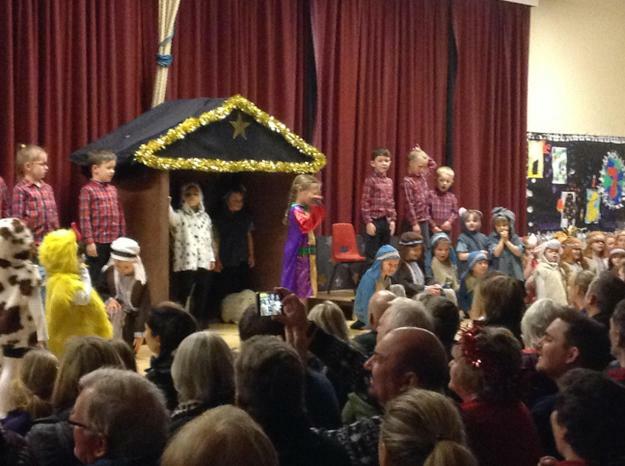 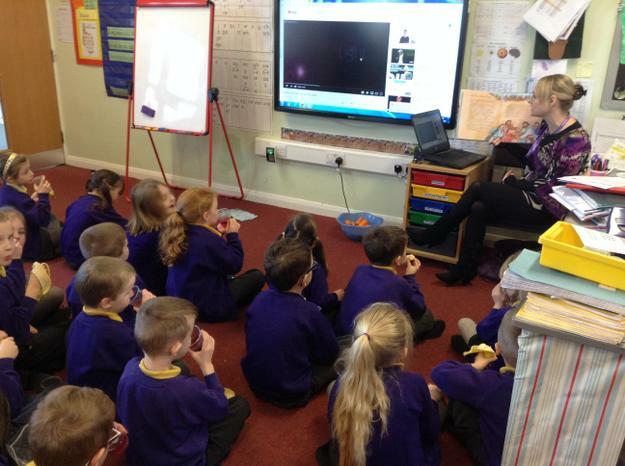 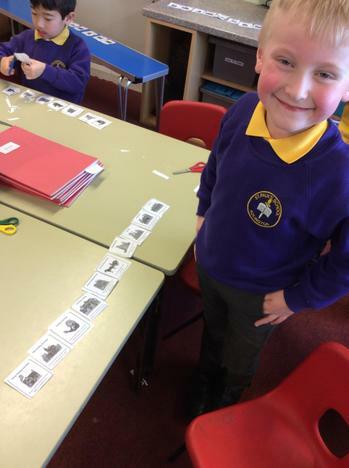 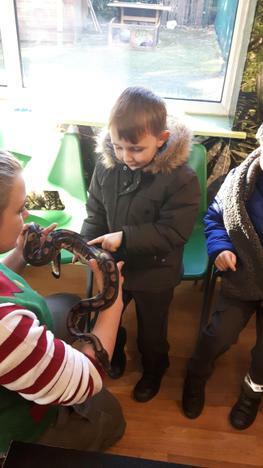 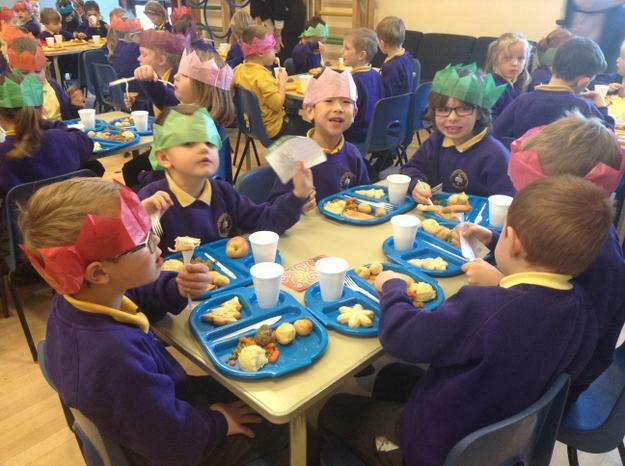 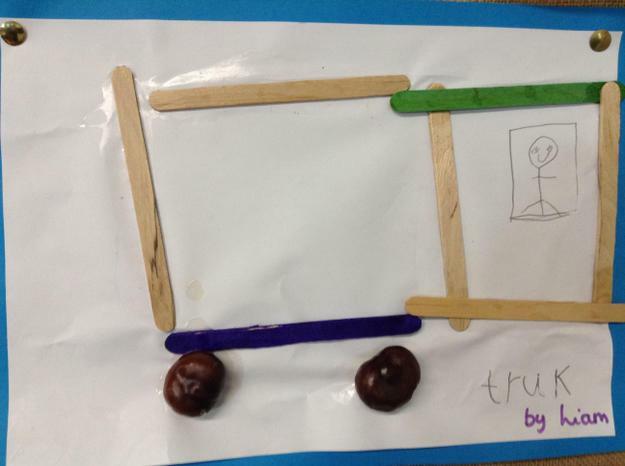 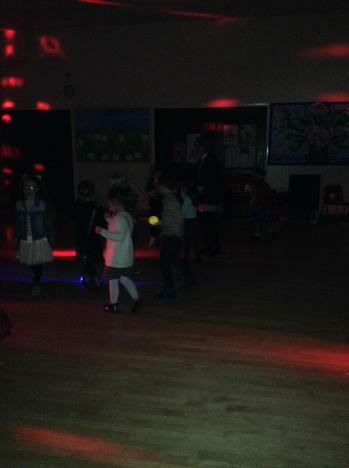 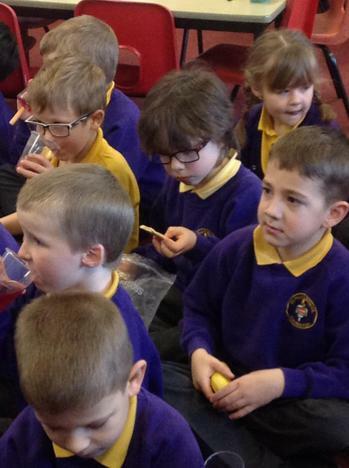 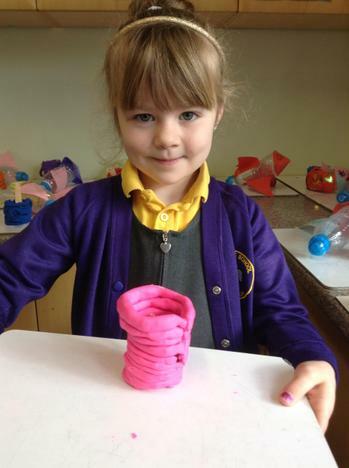 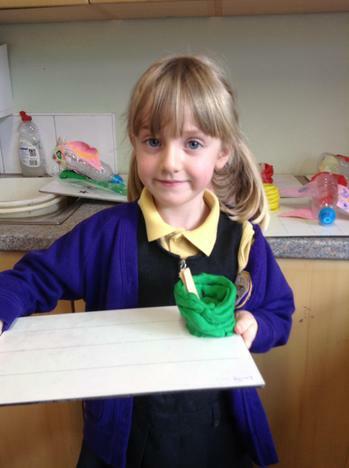 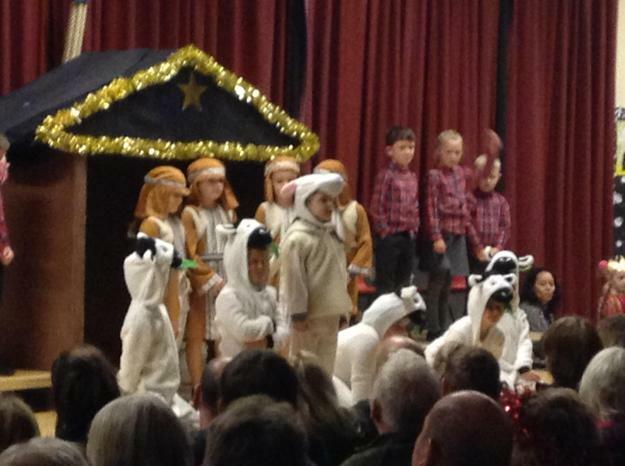 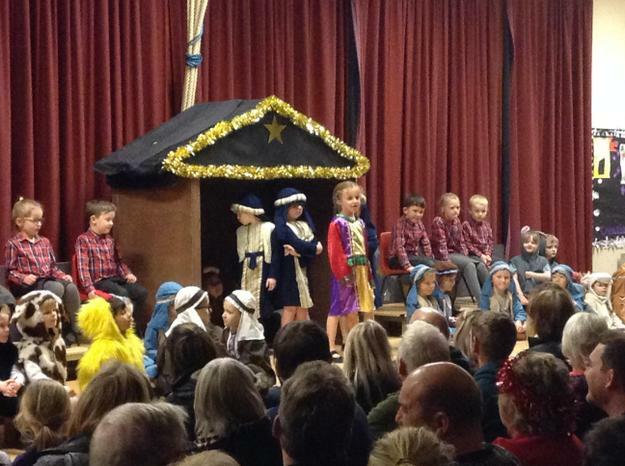 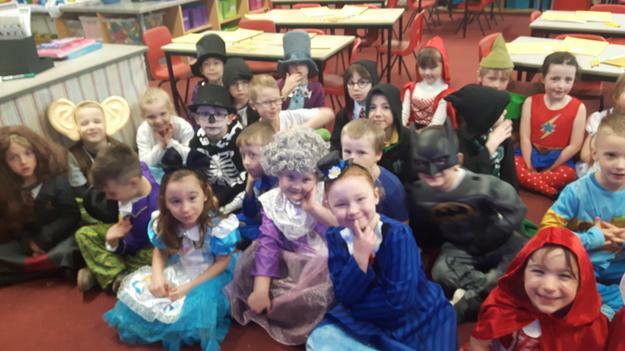 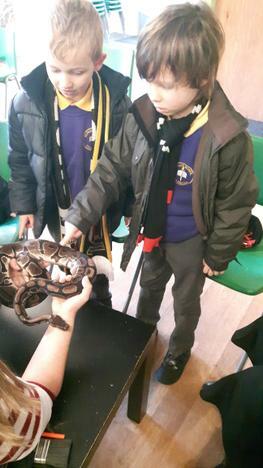 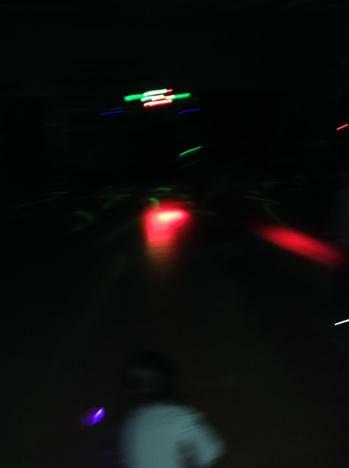 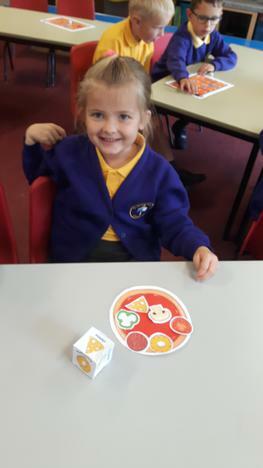 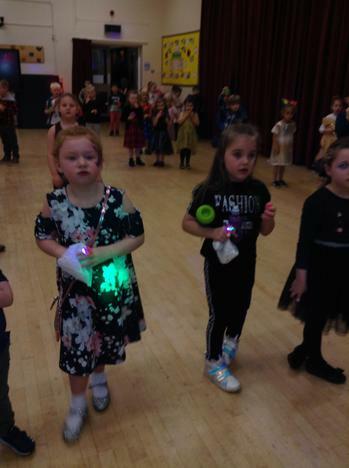 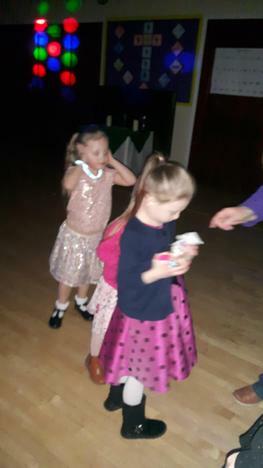 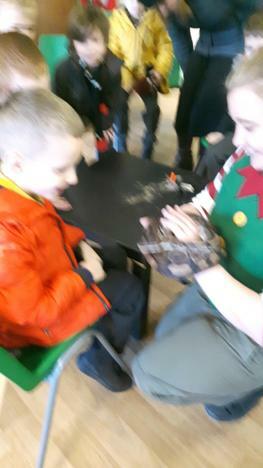 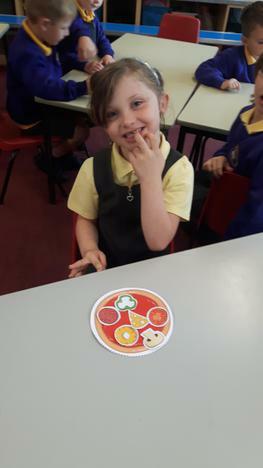 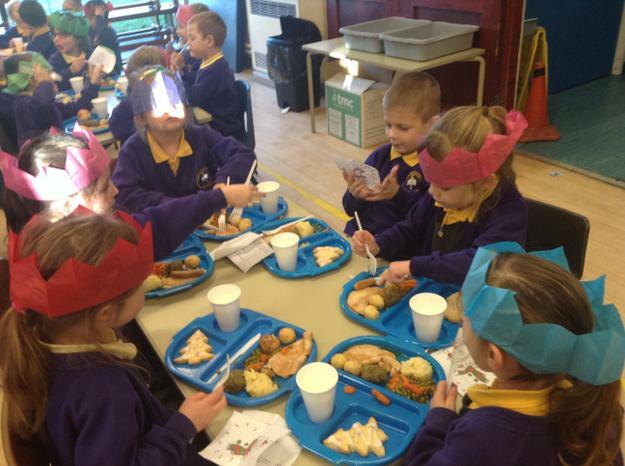 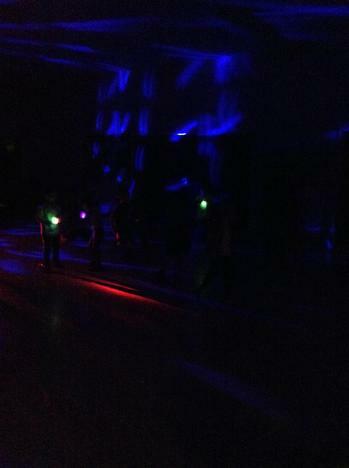 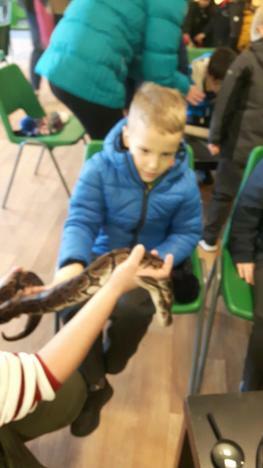 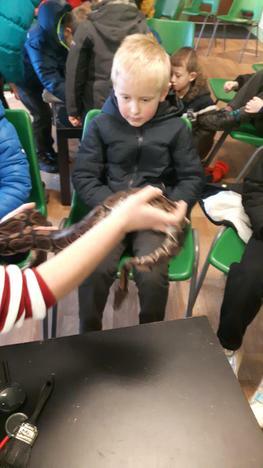 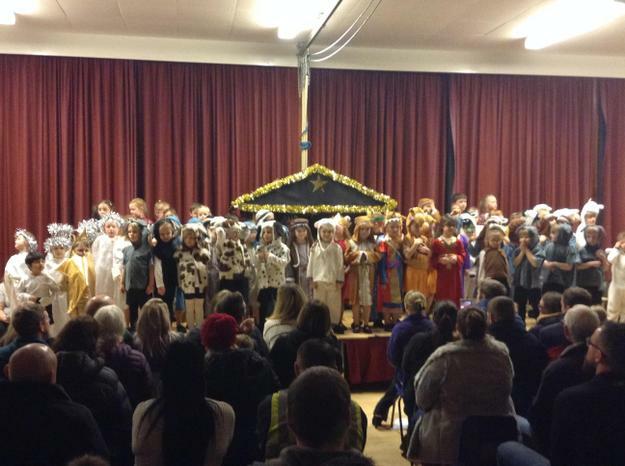 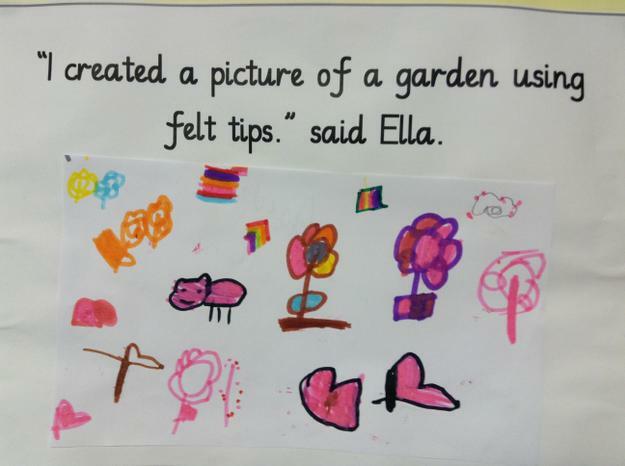 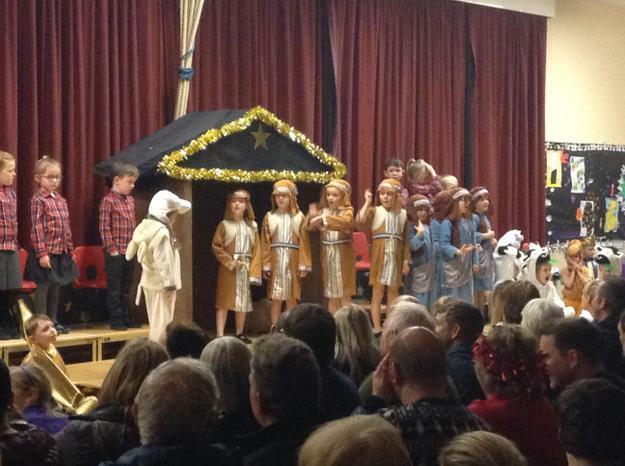 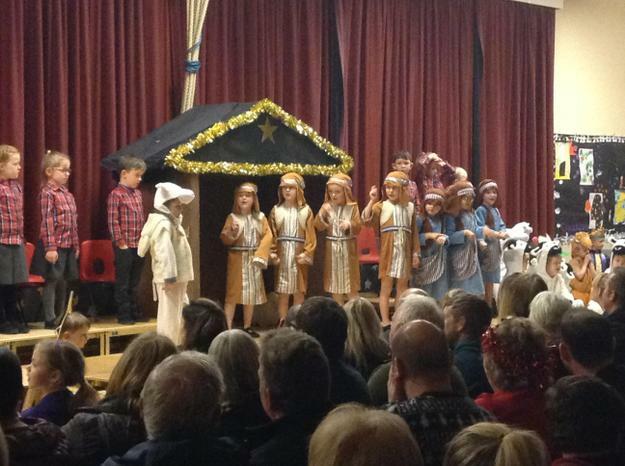 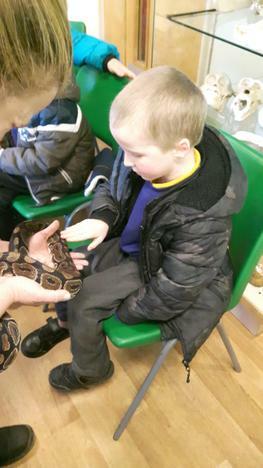 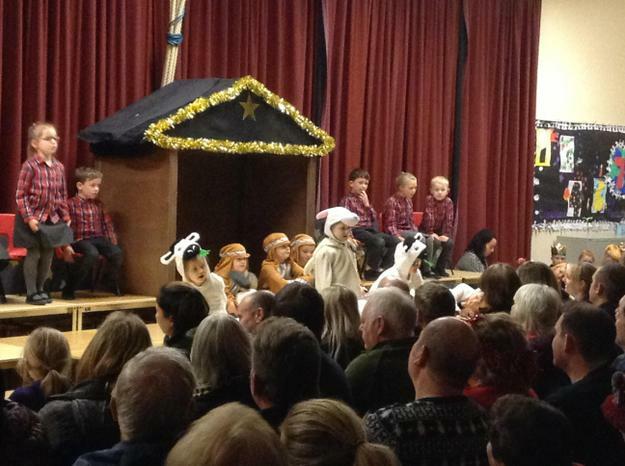 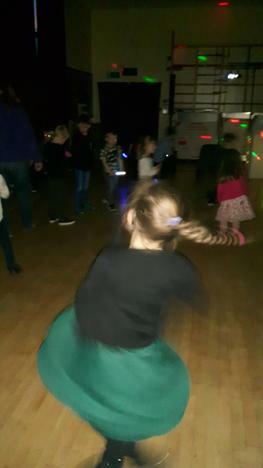 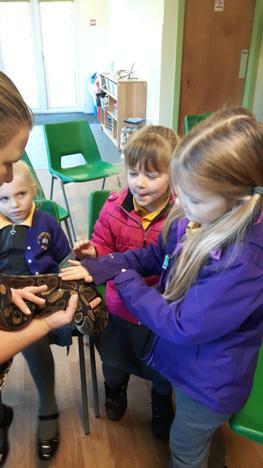 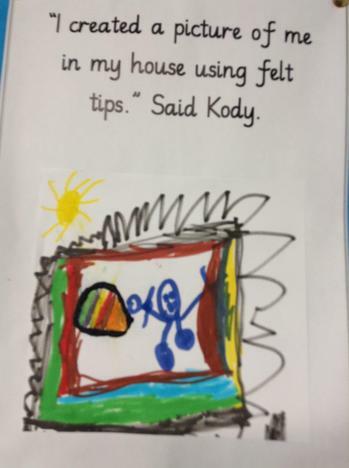 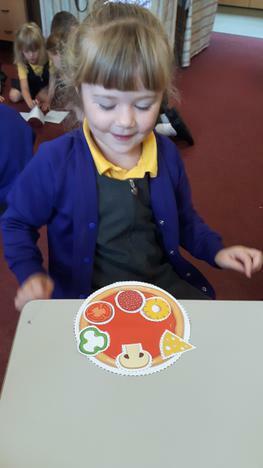 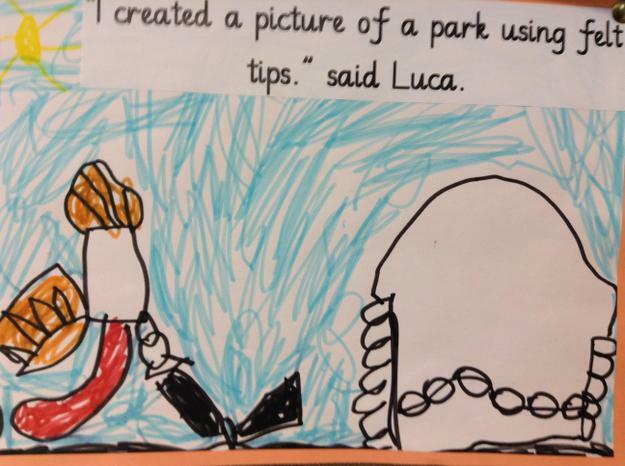 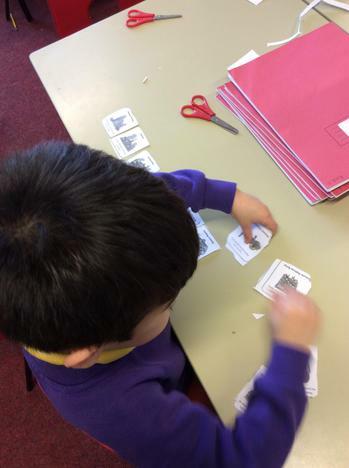 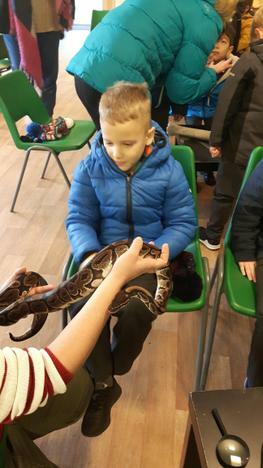 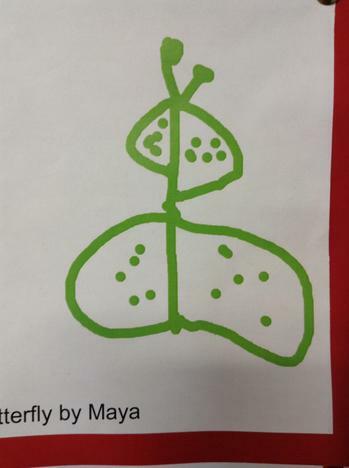 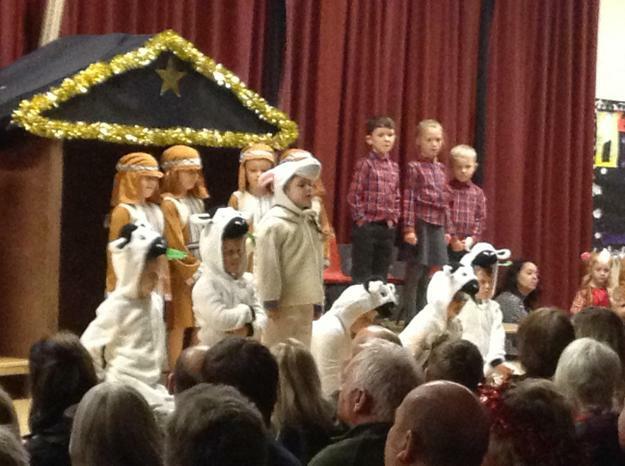 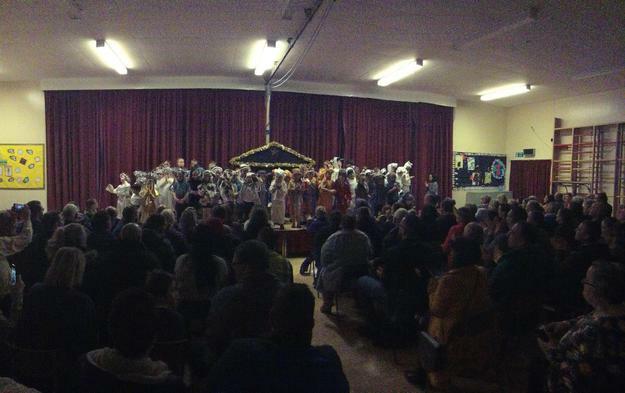 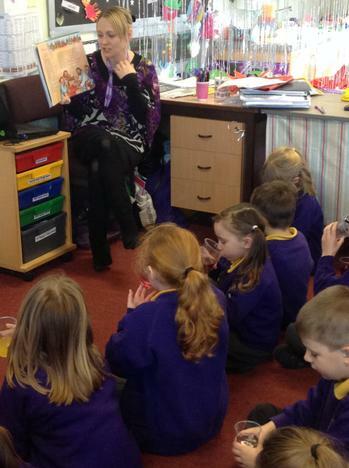 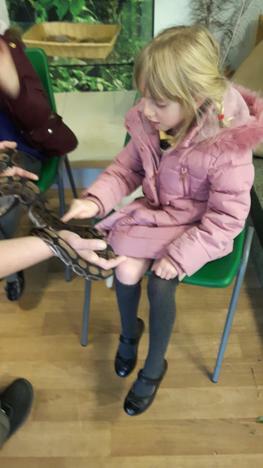 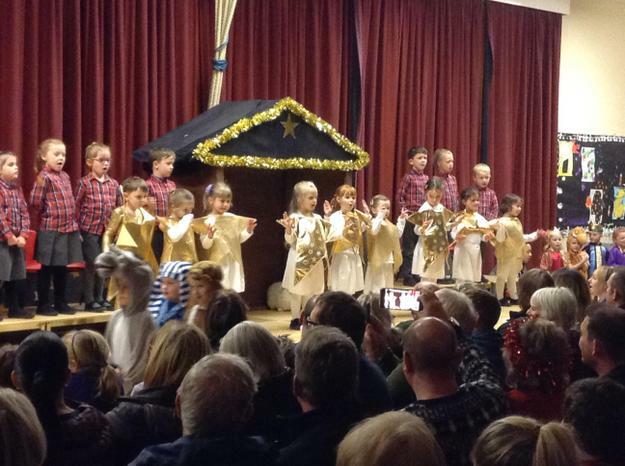 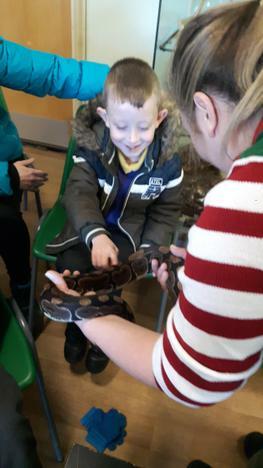 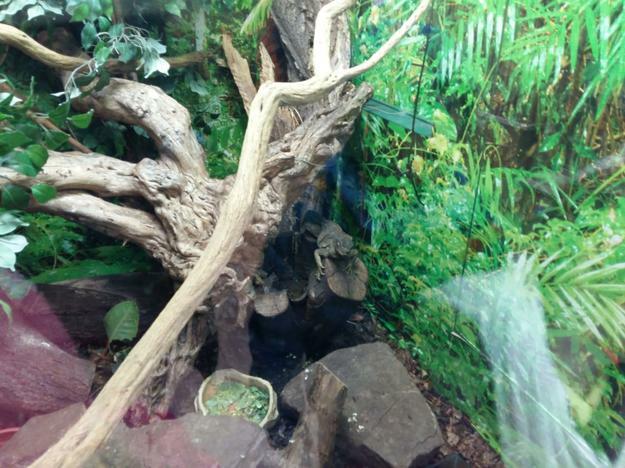 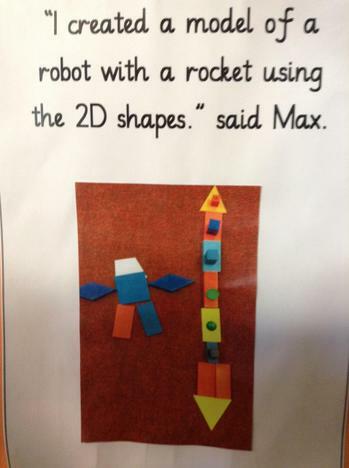 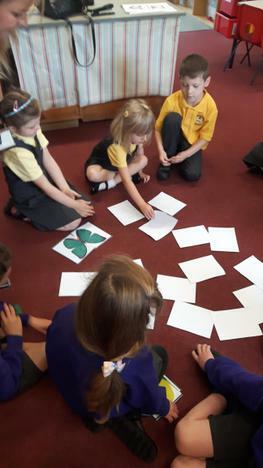 We will add photos to the website as we get them so you can share some of the children's learning experiences with them. 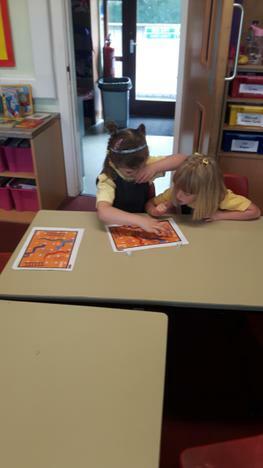 If you would like any further information please feel free to come and ask a member of the Year 1 team. 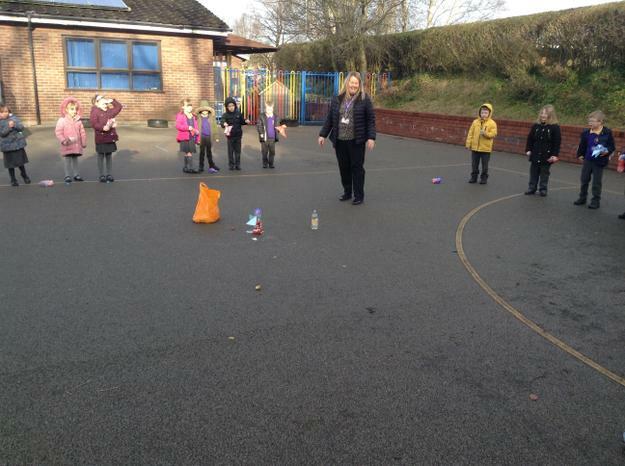 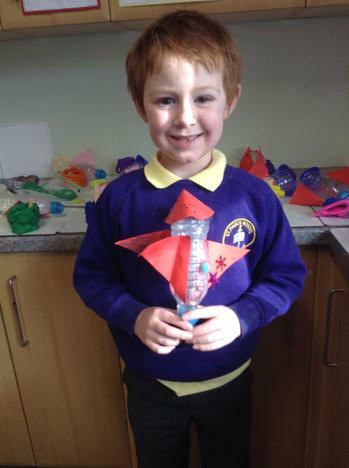 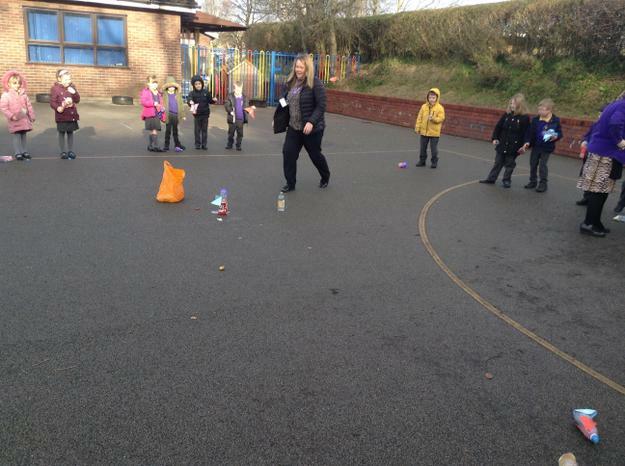 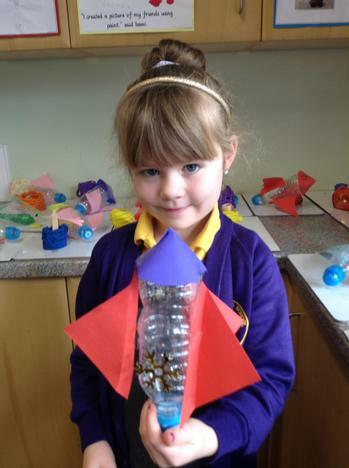 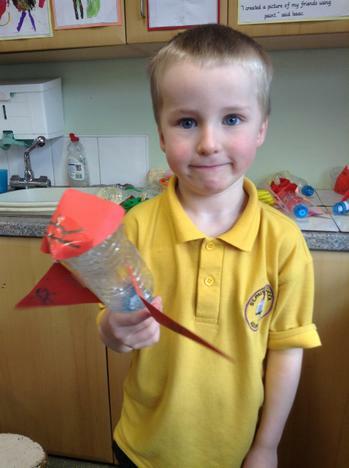 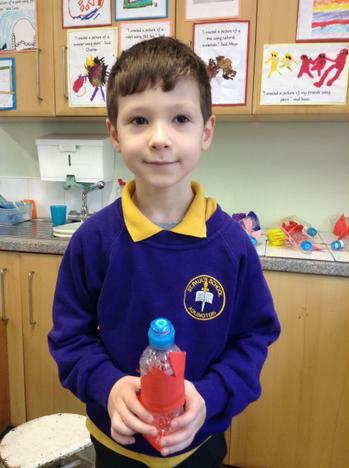 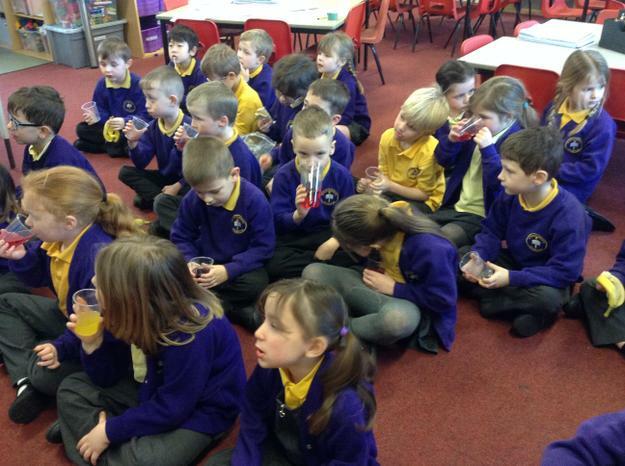 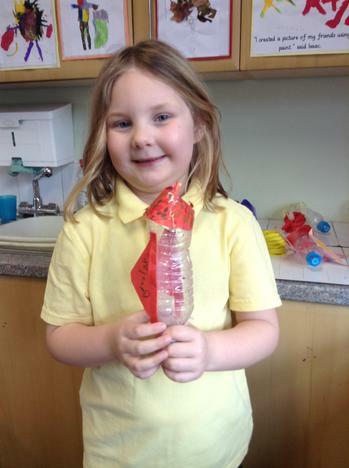 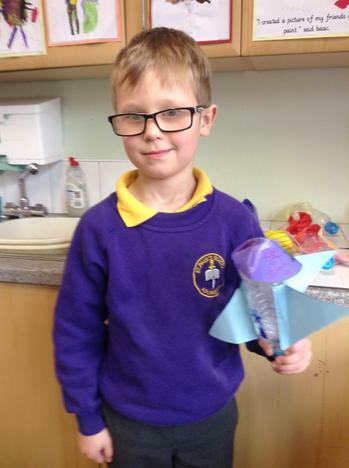 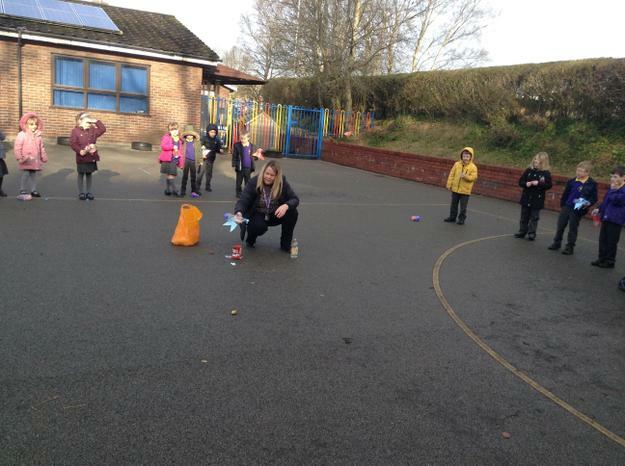 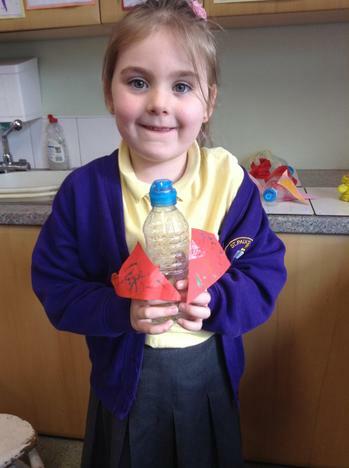 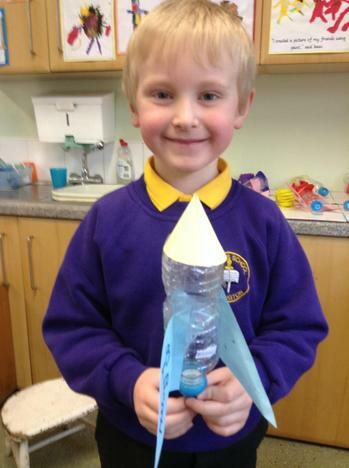 We made rockets and used bicarbonate of soda and vinegar to launch them into space. 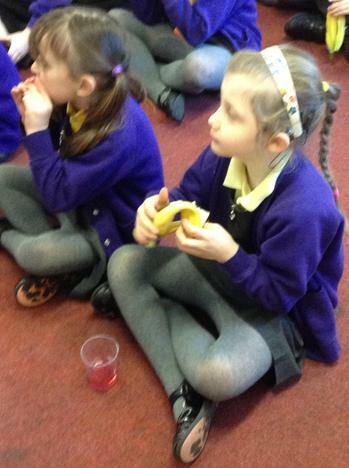 We had a snack time picnic while we listened to the Bible story of the feeding of the five thousand. 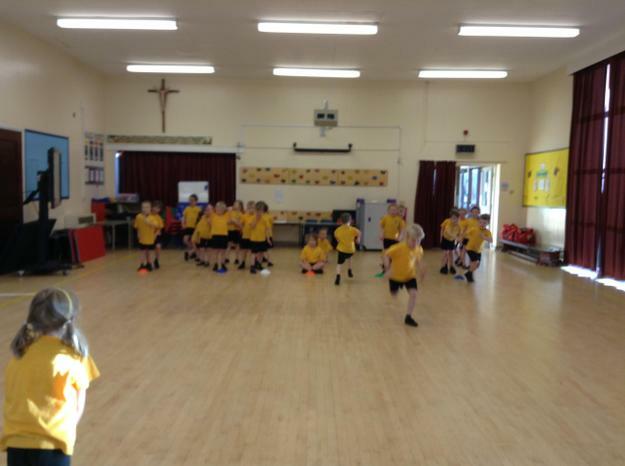 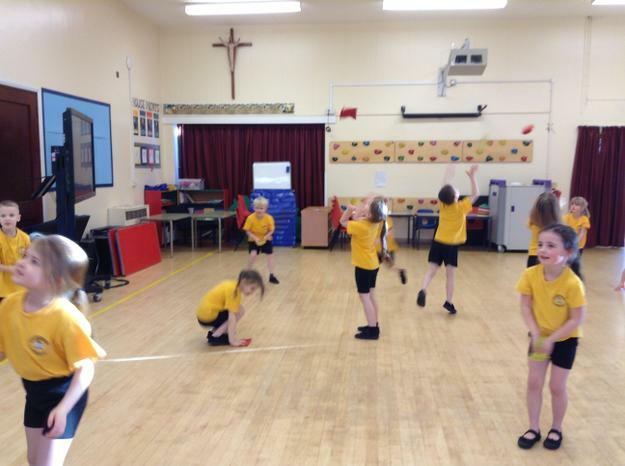 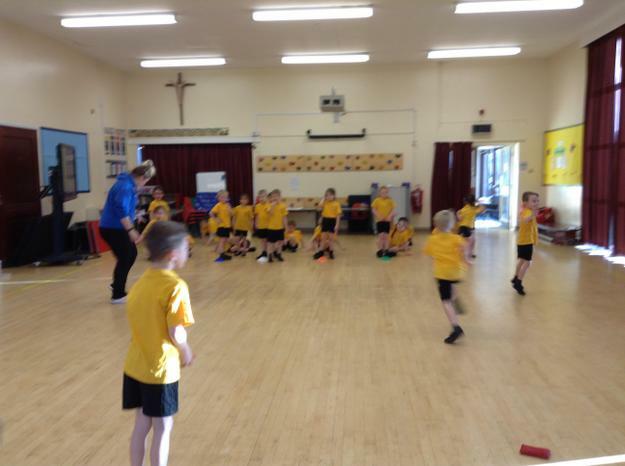 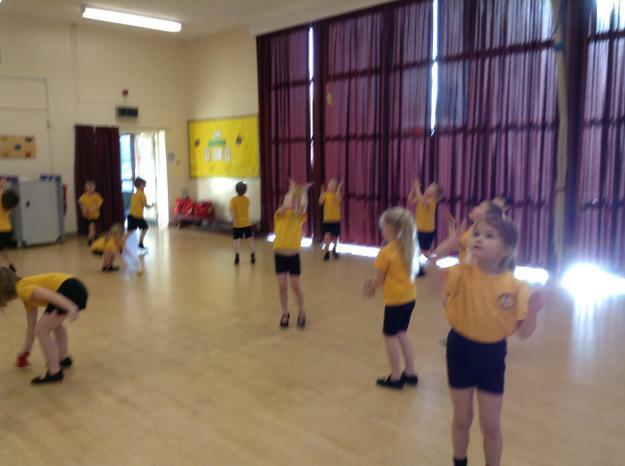 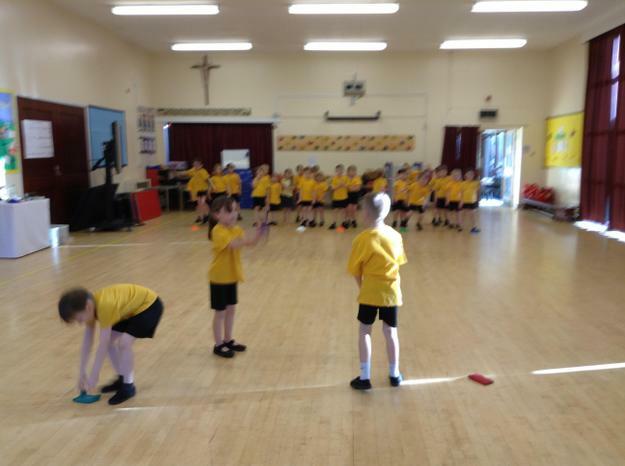 The children had a great time developing accuracy in their throwing skills during their PE lesson with Chorley School Sports Partnership. 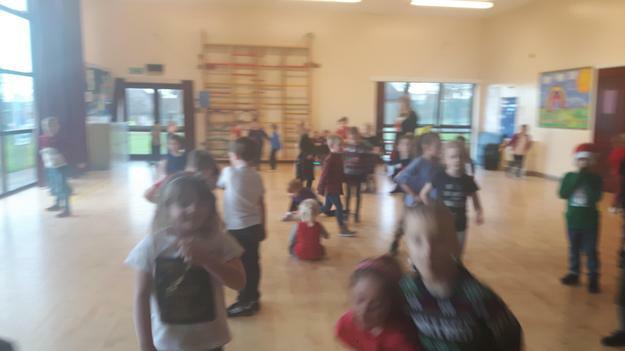 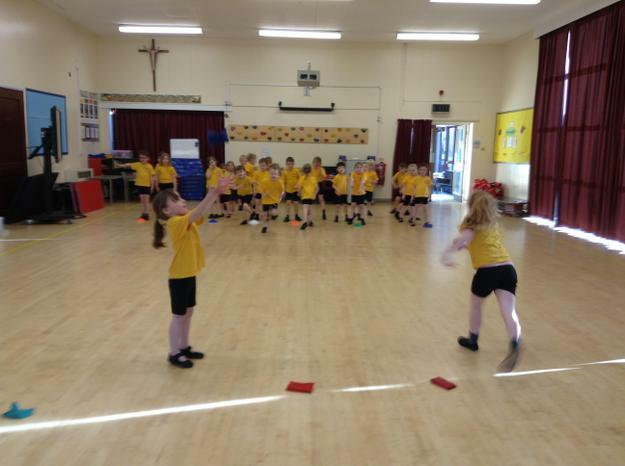 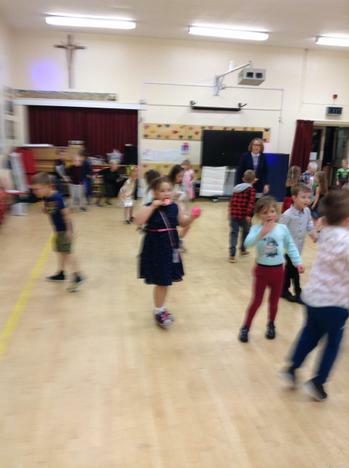 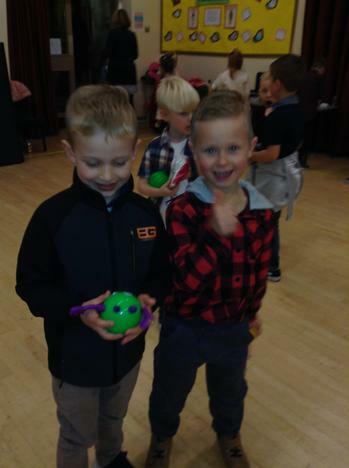 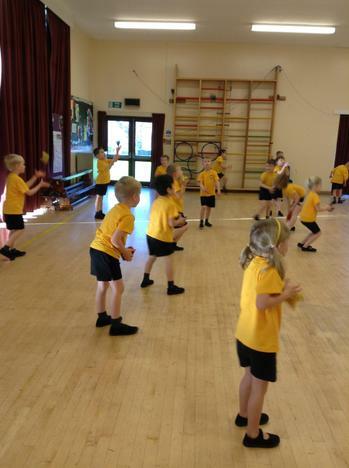 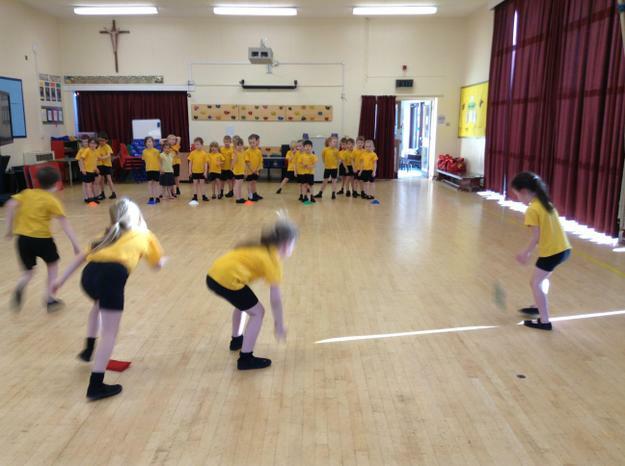 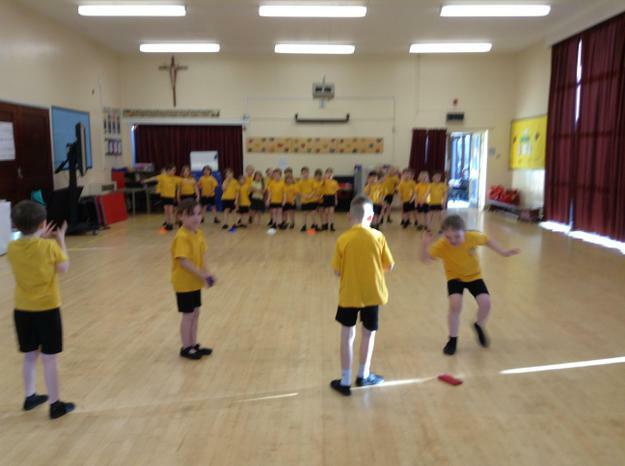 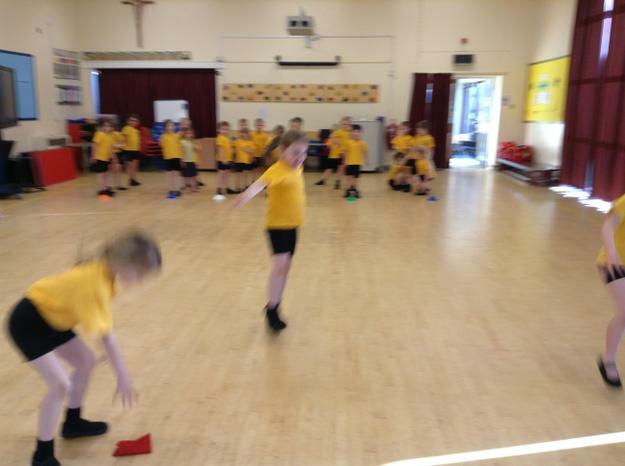 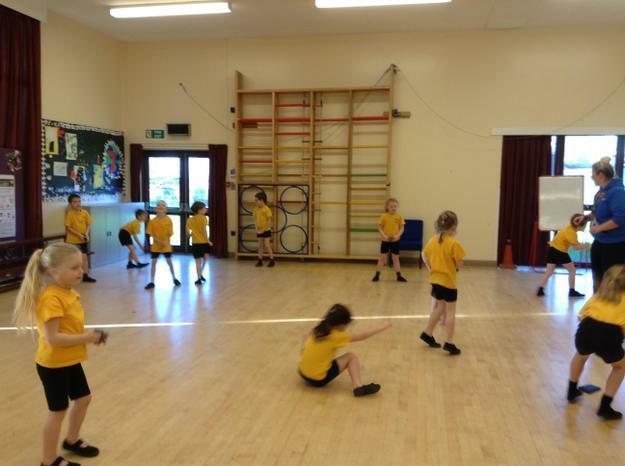 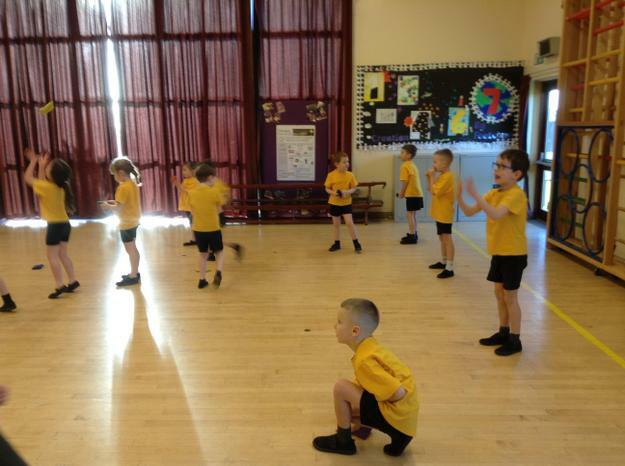 They were developing their co-ordination skills by watching the beanbag, making a target with their hands and moving their feet at the same time to ensure they could catch the bean bag with increasing accuracy as they increased the distance they were throwing across. 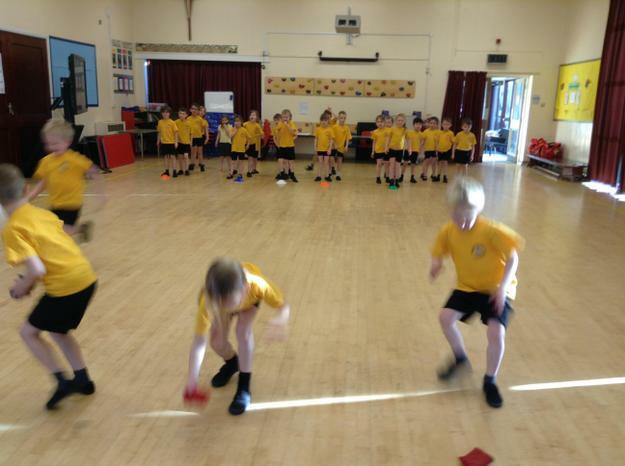 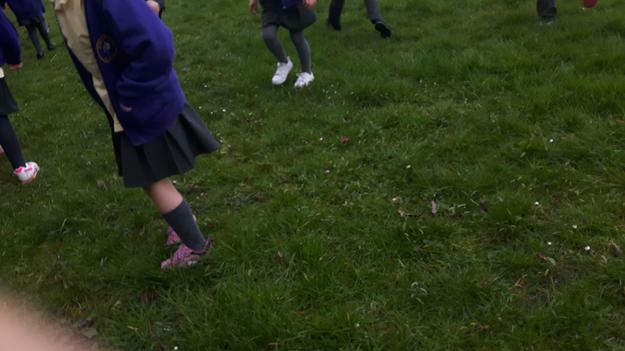 We then combined our catching skills with different ways of travelling to create some simple team games where the children had to work together to complete a race. 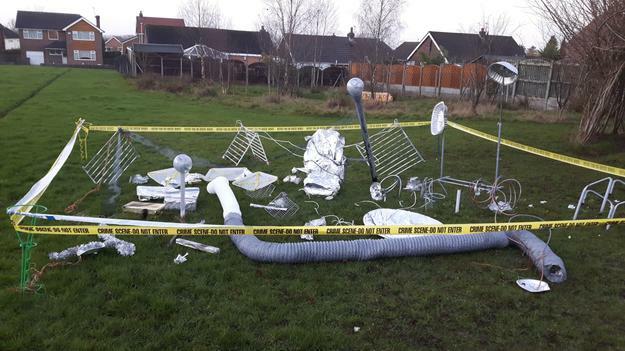 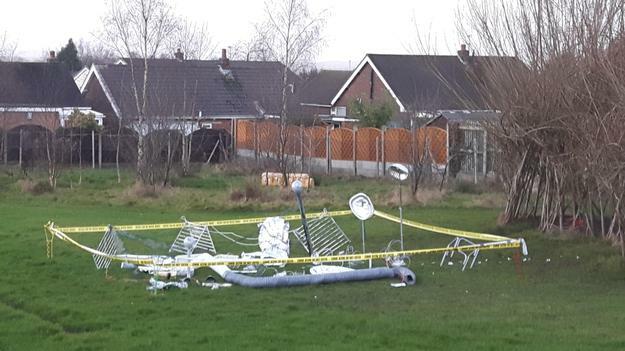 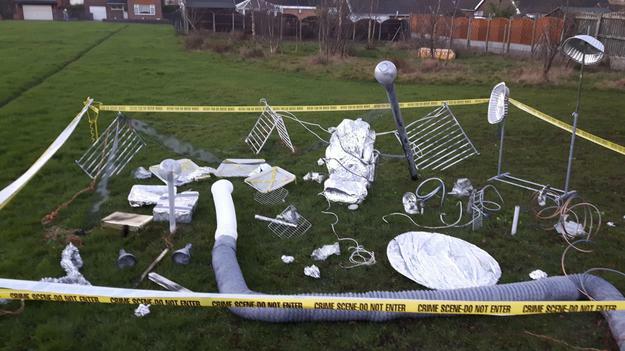 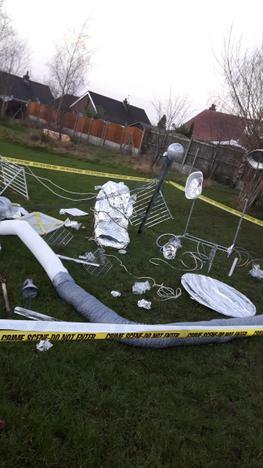 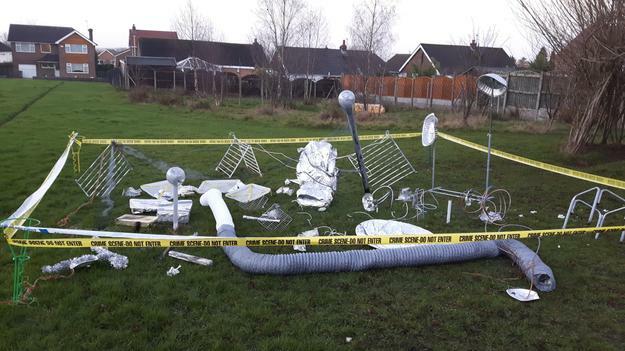 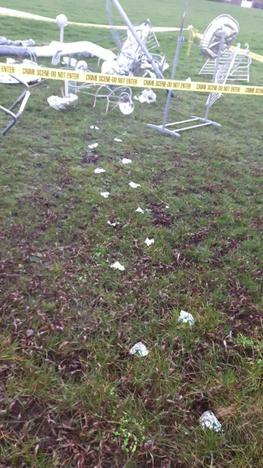 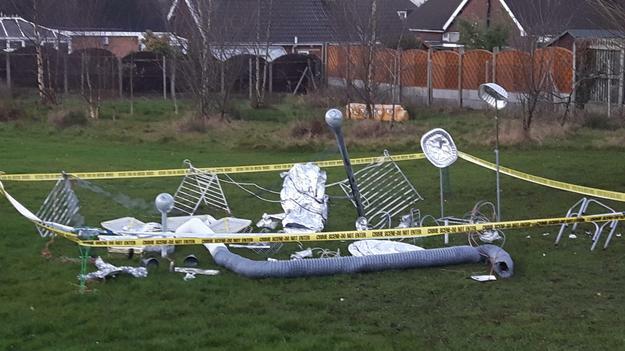 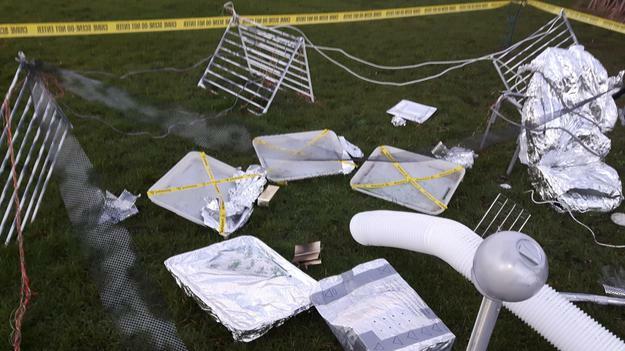 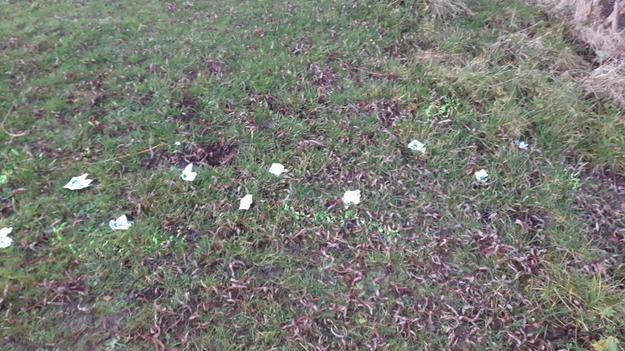 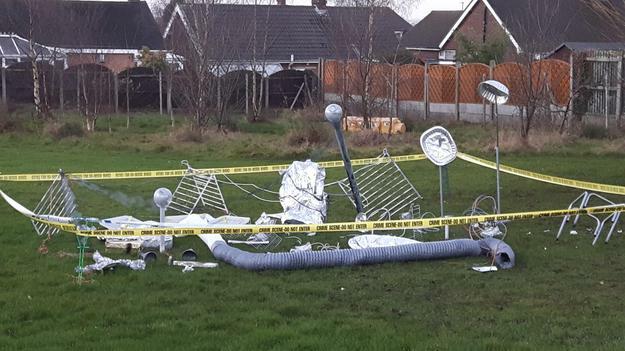 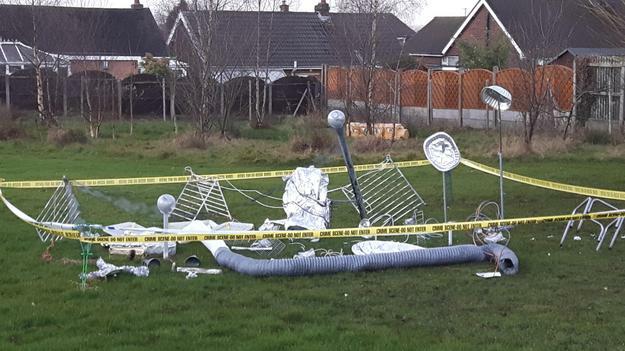 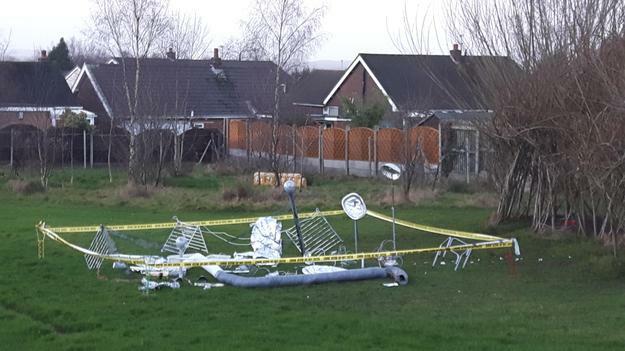 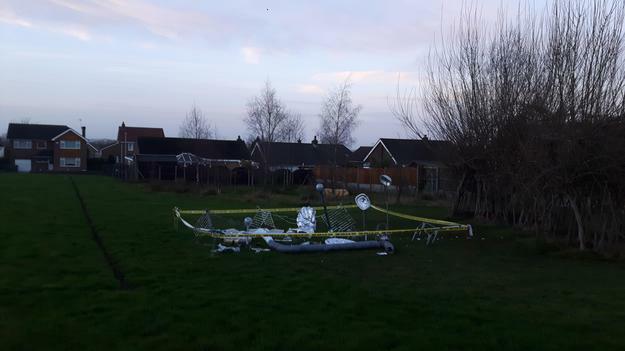 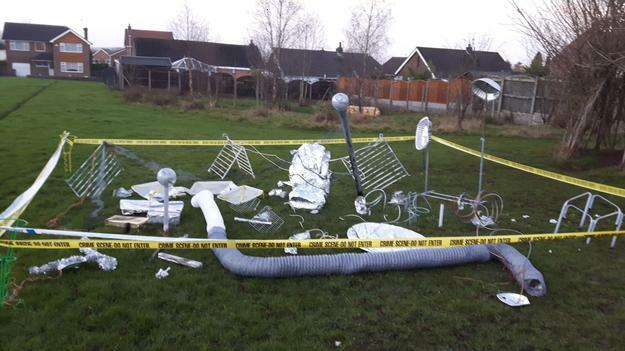 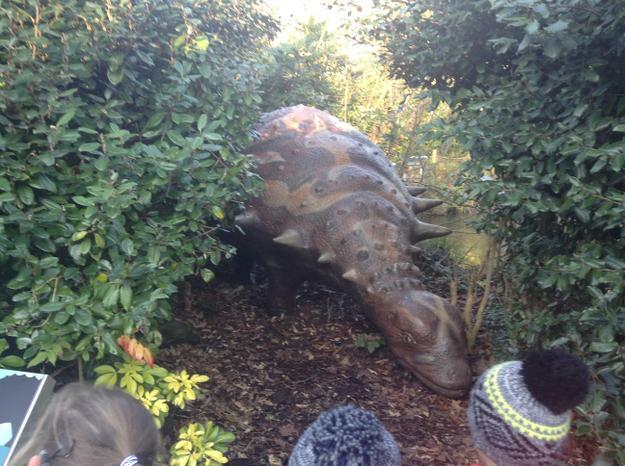 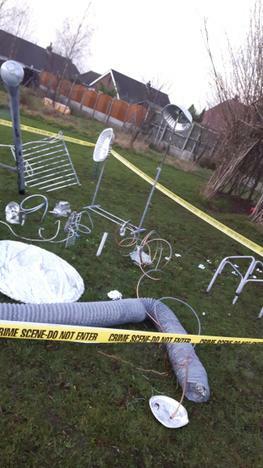 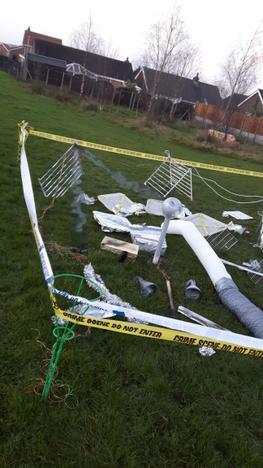 The children have enjoyed looking at the crashed alien spacecraft that has appeared on our field over the holidays. 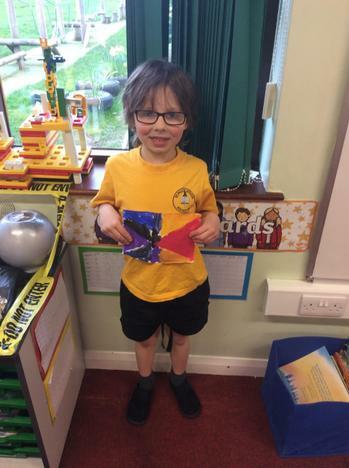 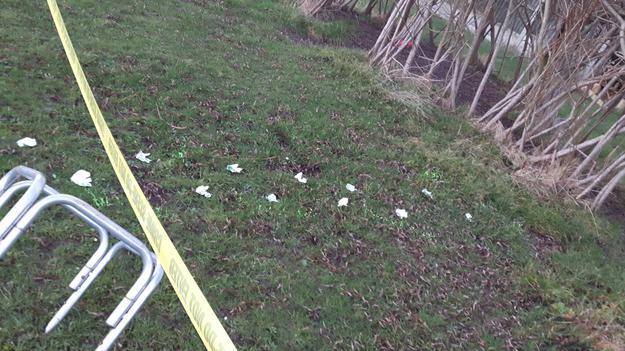 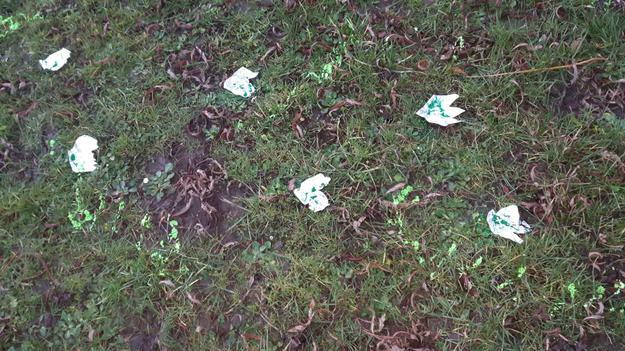 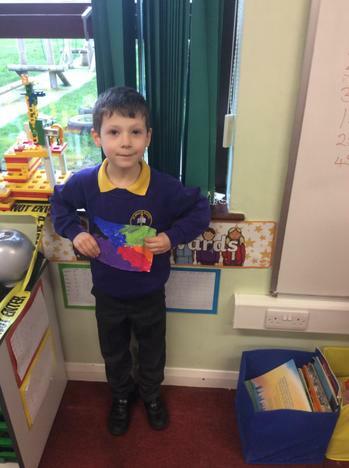 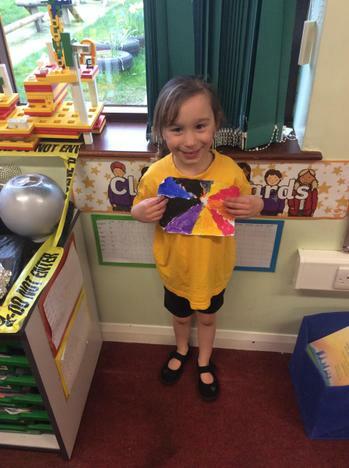 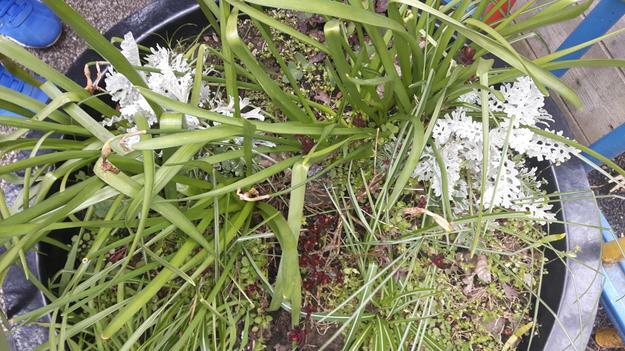 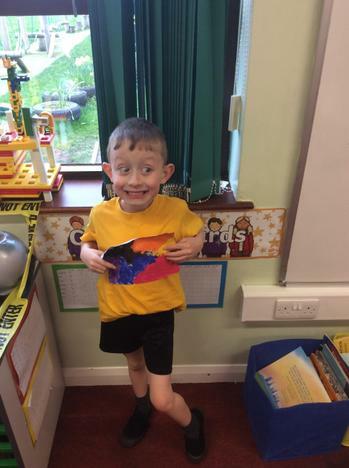 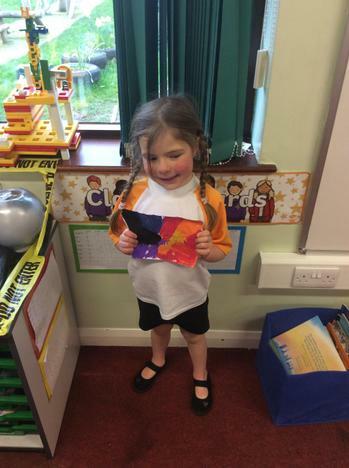 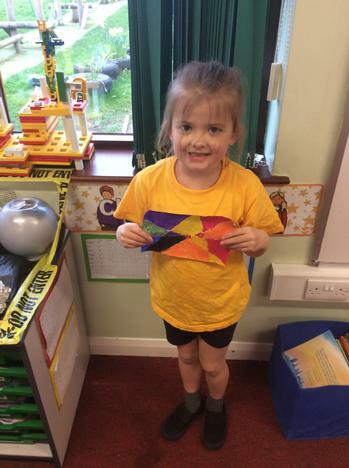 They have used their observational skills to describe the scene for the police and have enjoyed discussing where the aliens may have gone after discovering alien footprints walking away from the crash site. 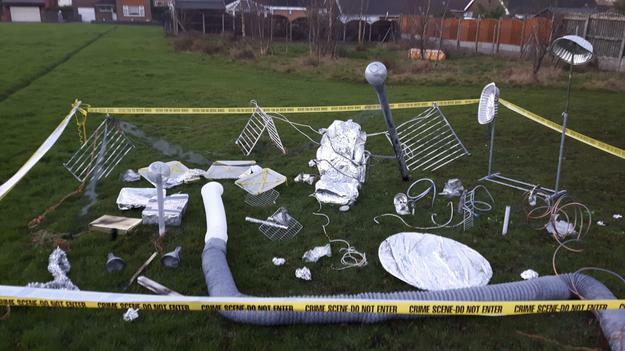 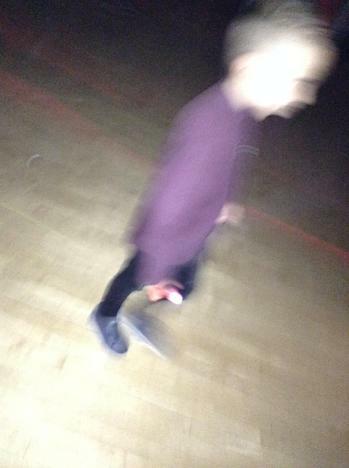 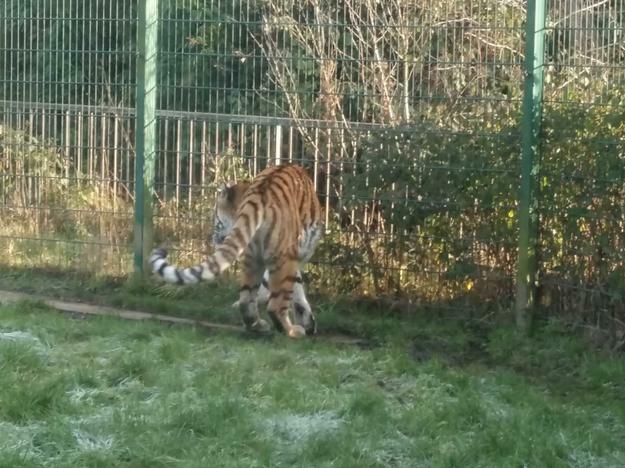 Please stay alert through the half term in case there are any other strange events occurring at school. 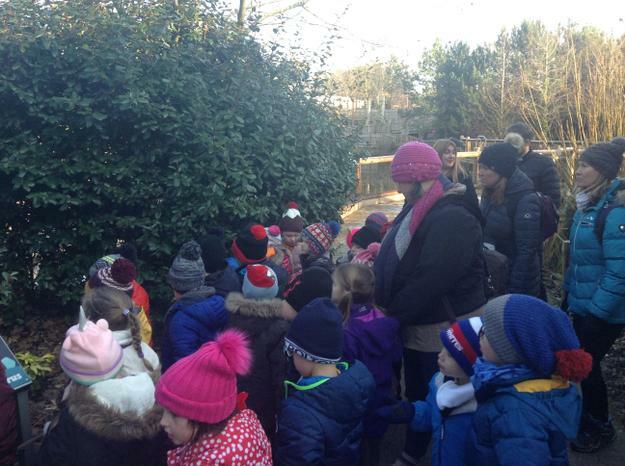 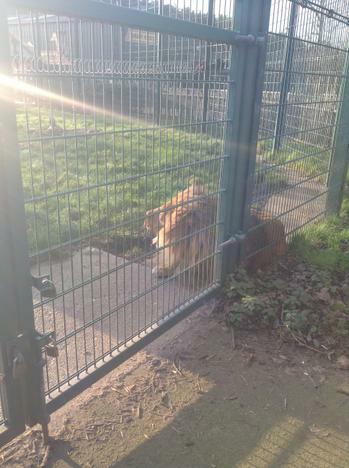 Welcome back to school after the Christmas holidays. 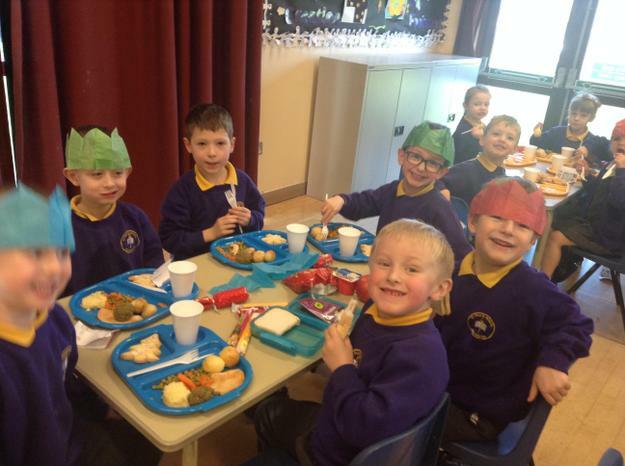 We hope everyone had a lovely time over Christmas and New Year. 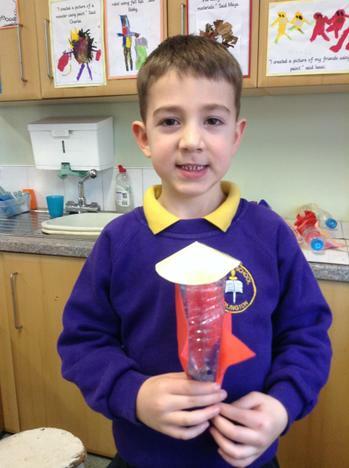 We have another exciting half term planned around our topic of 'Moon Zoom. 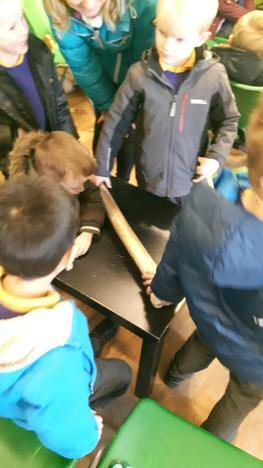 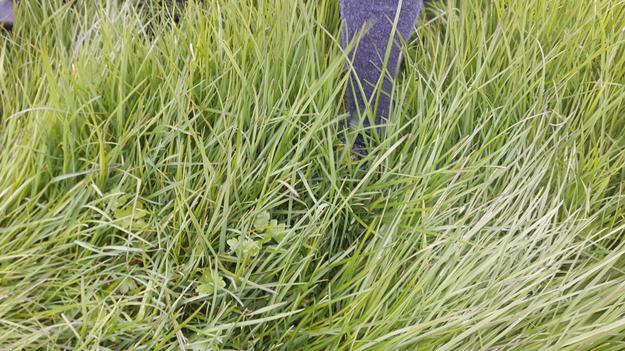 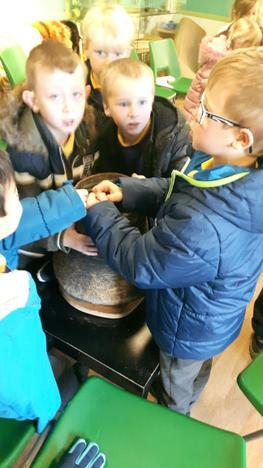 The wow experience for the children during this topic will be discovering the crashed alien space craft on the field and exploring all the artefacts and possibilities that may be uncovered. 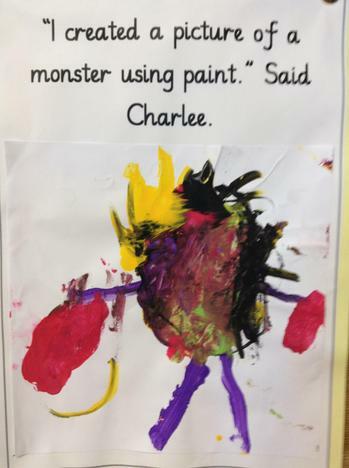 We hope this will capture the children's imaginations so we can inspire the children to work creatively in our lessons. 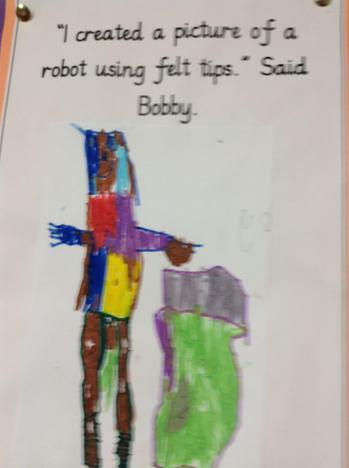 More information on this topic is available from the parent information document and home learning document above. 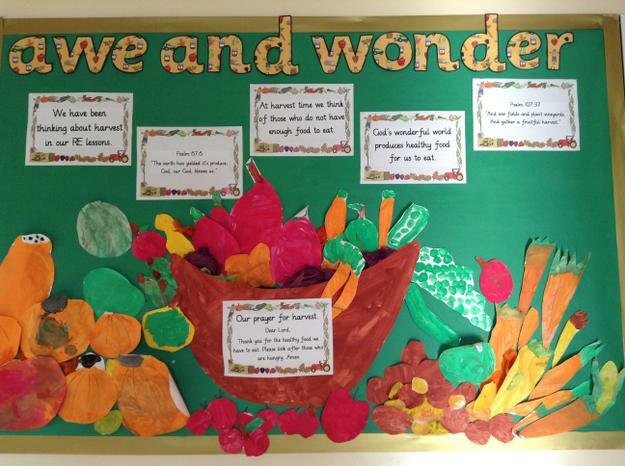 Please feel free to speak to a member of the Year 1 team if you have any queries over the next few weeks. 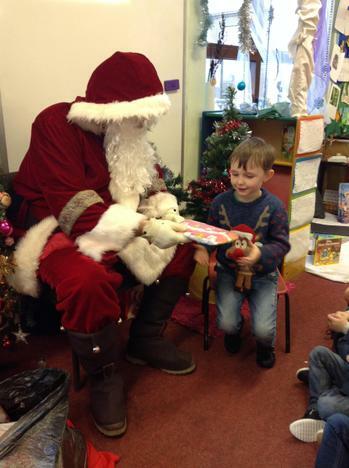 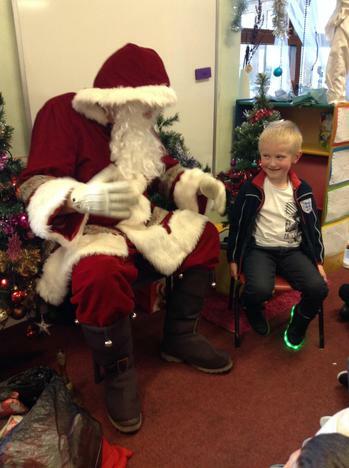 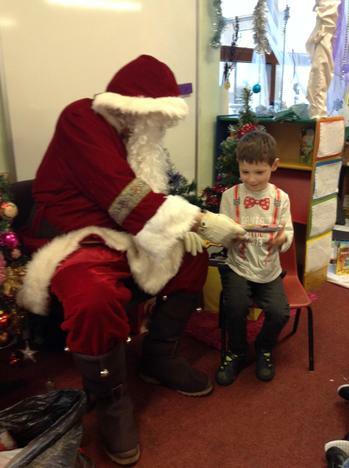 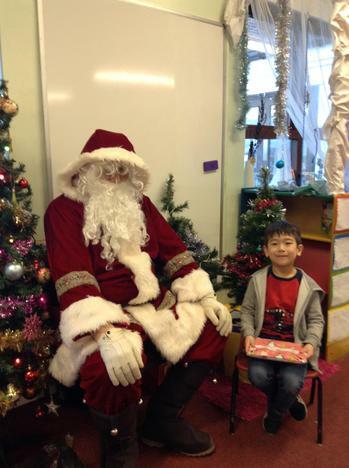 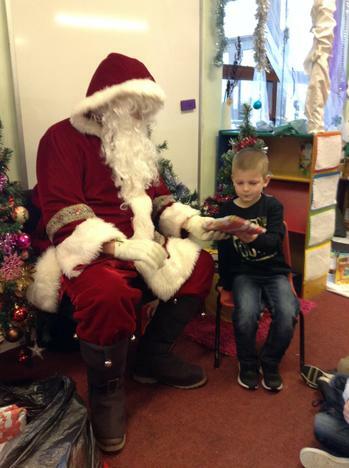 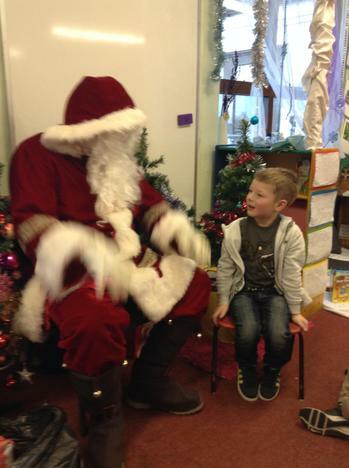 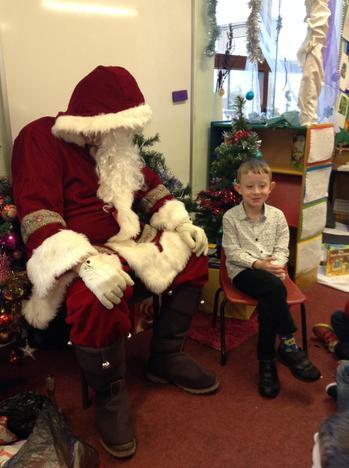 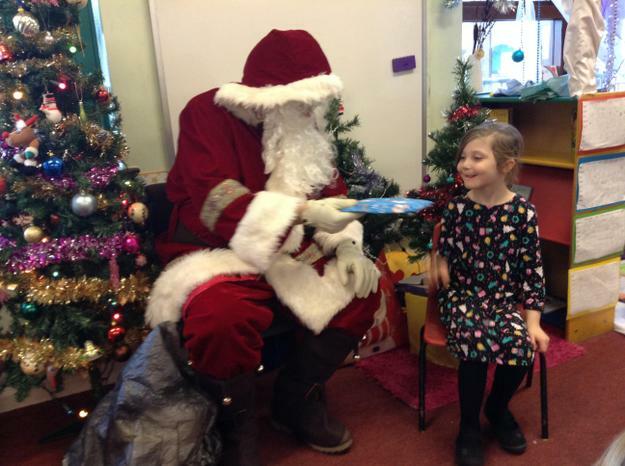 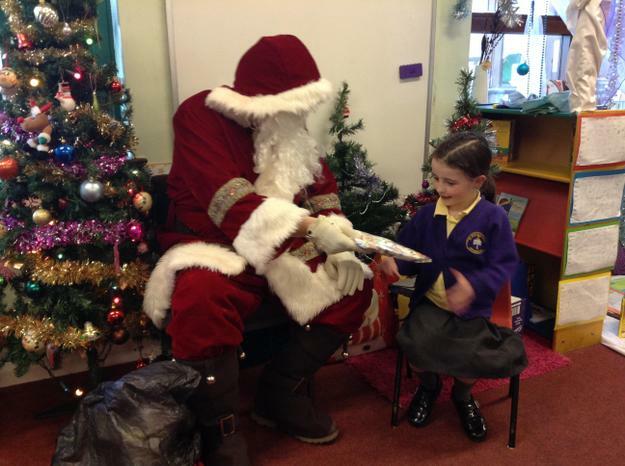 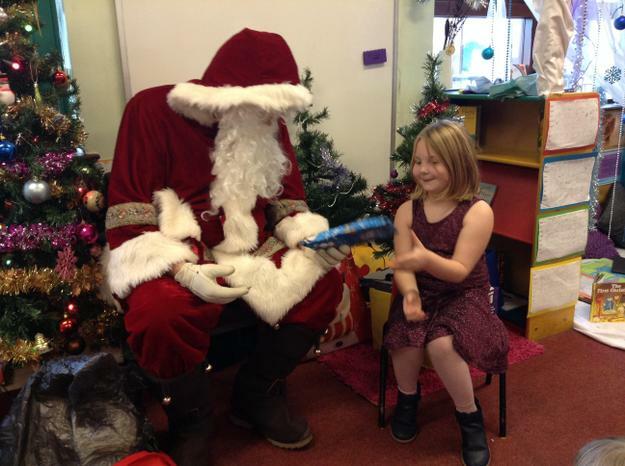 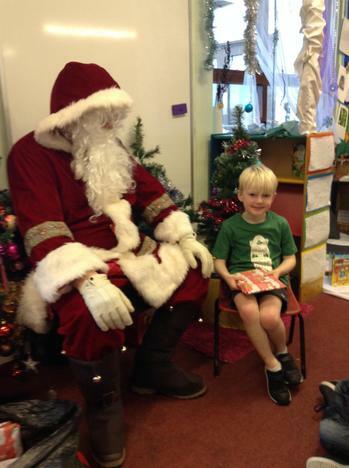 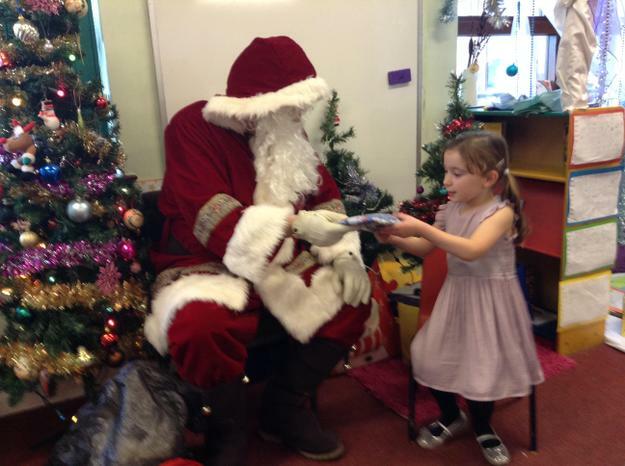 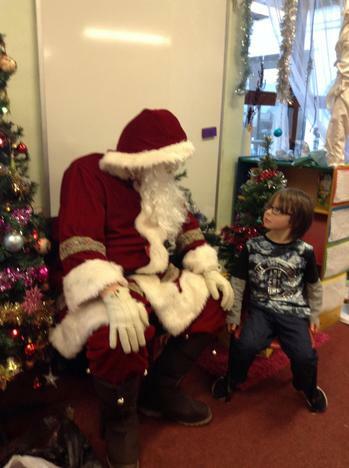 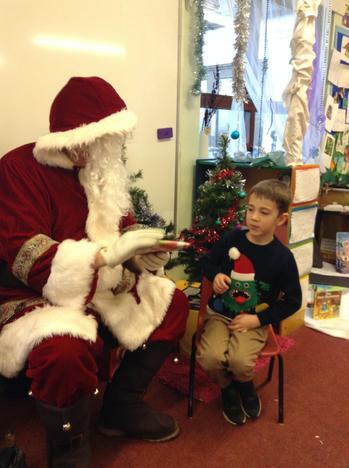 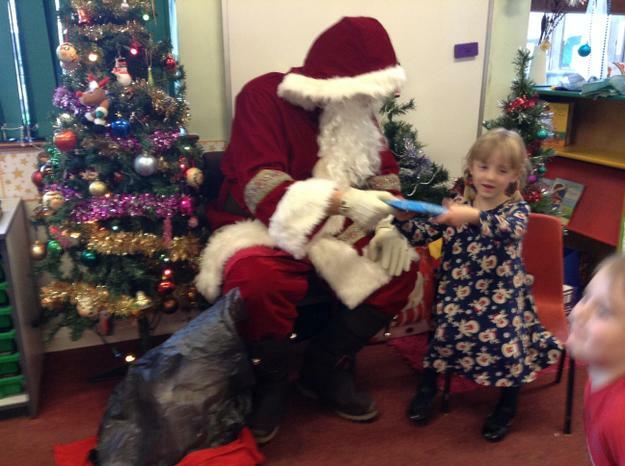 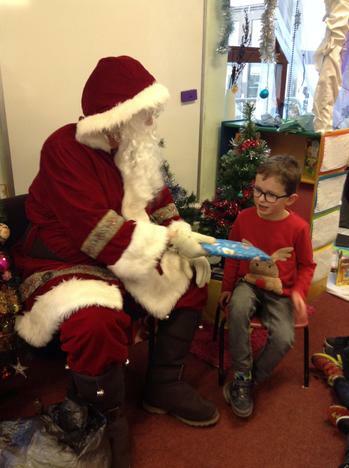 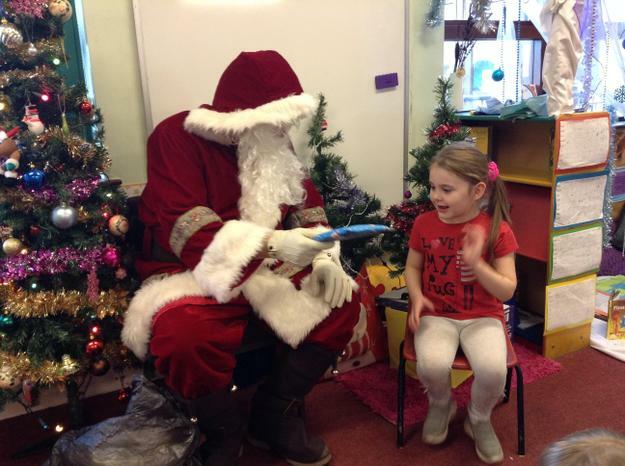 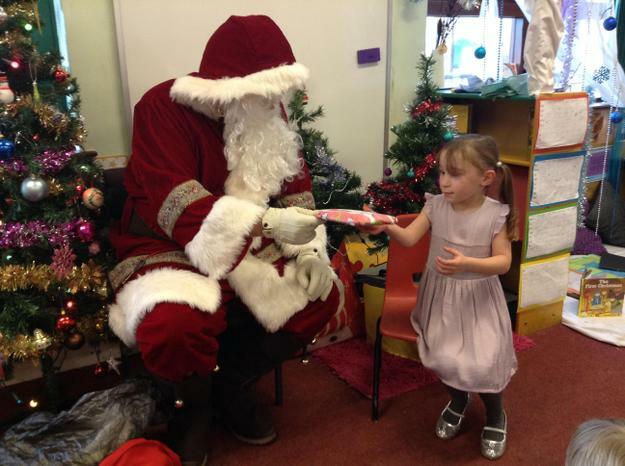 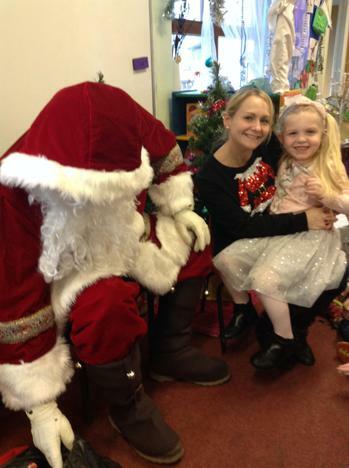 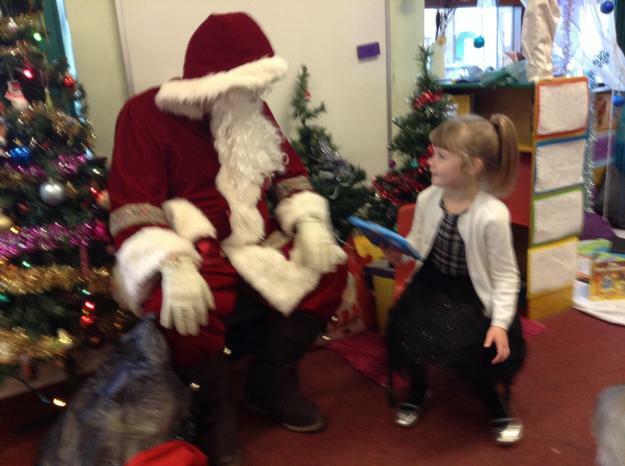 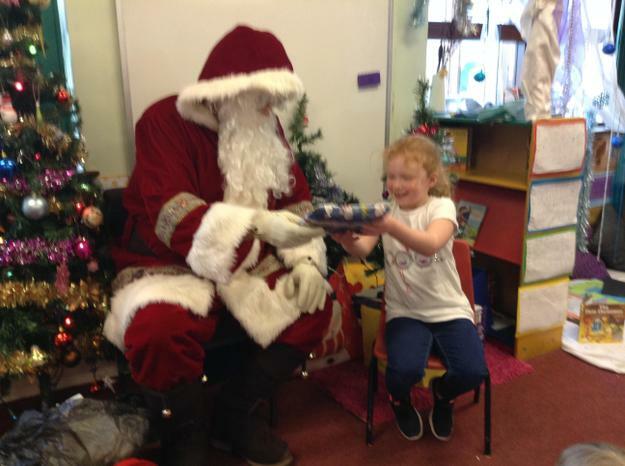 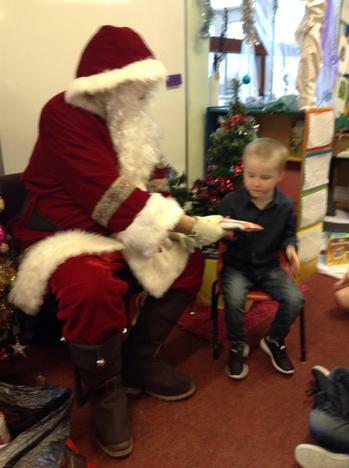 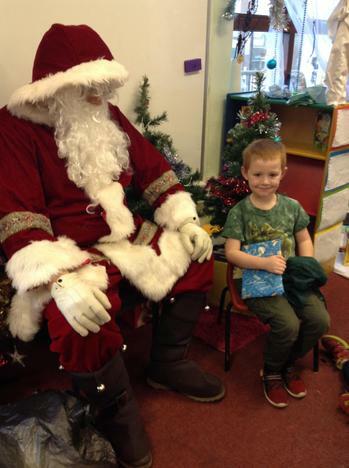 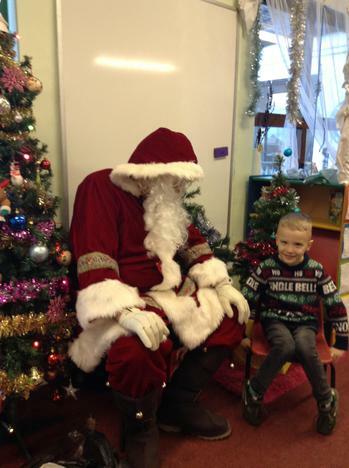 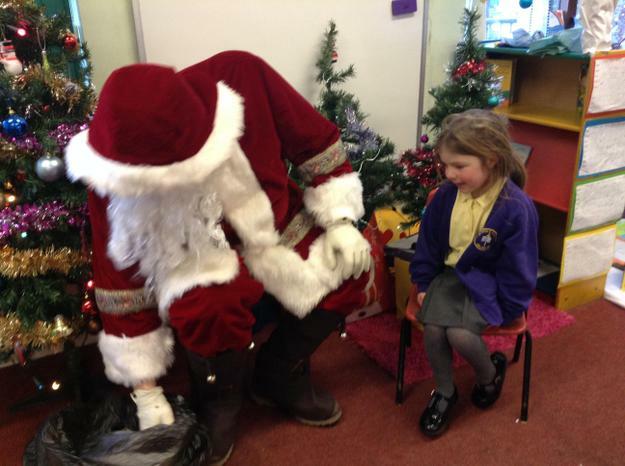 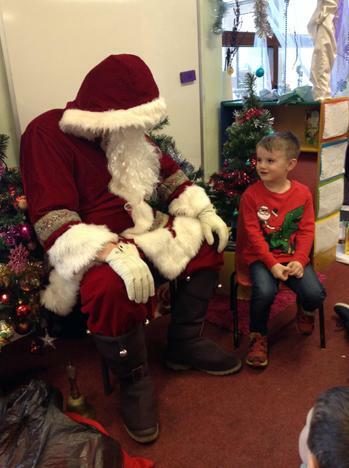 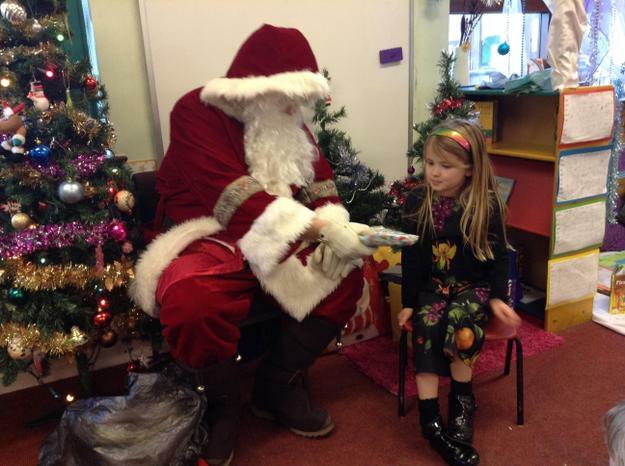 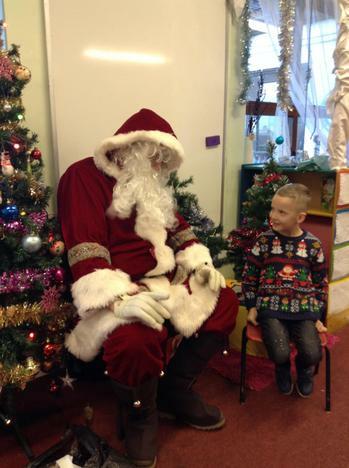 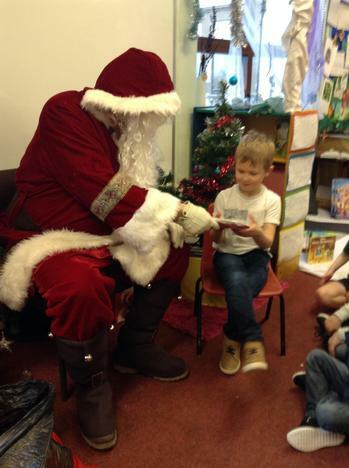 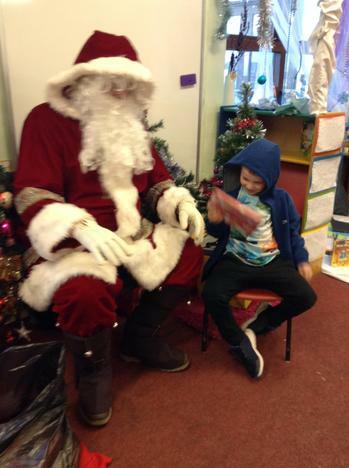 The children had a great time meeting Father Christmas at the Christmas Party. 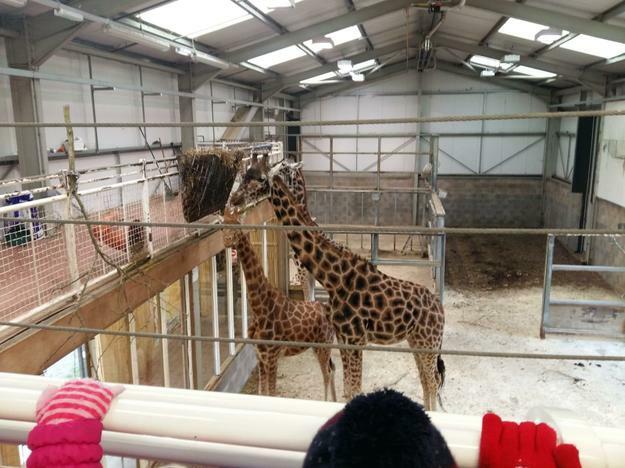 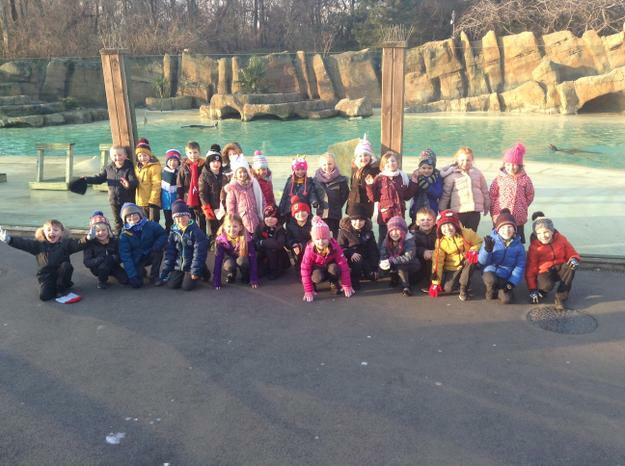 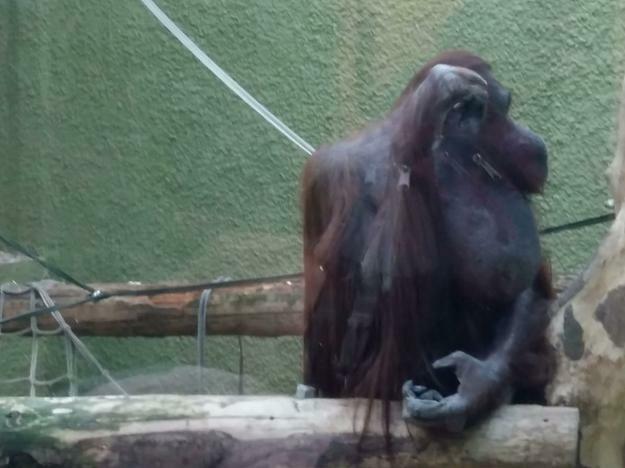 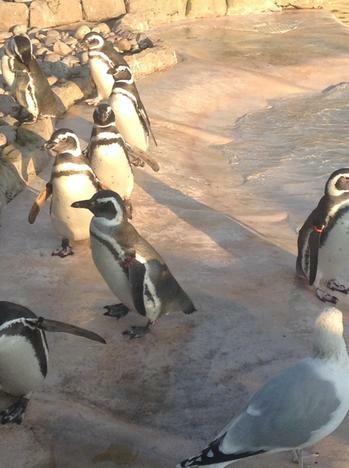 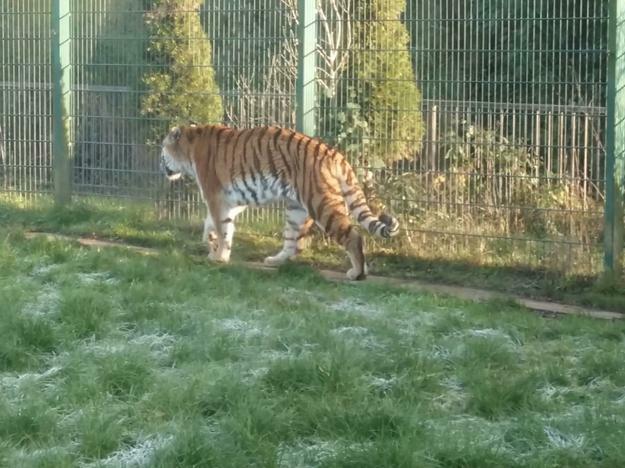 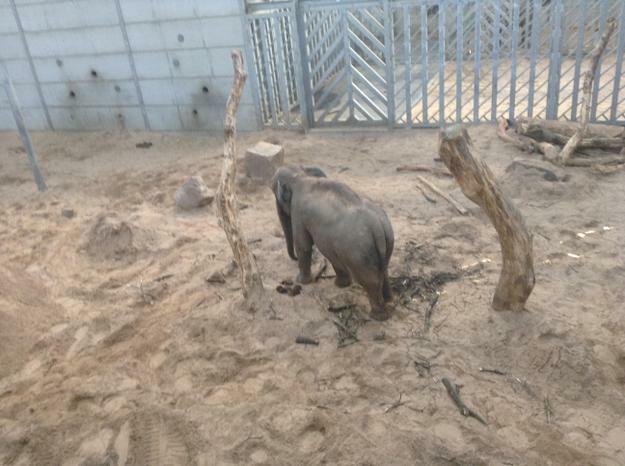 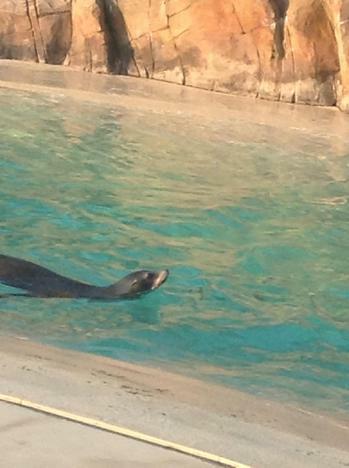 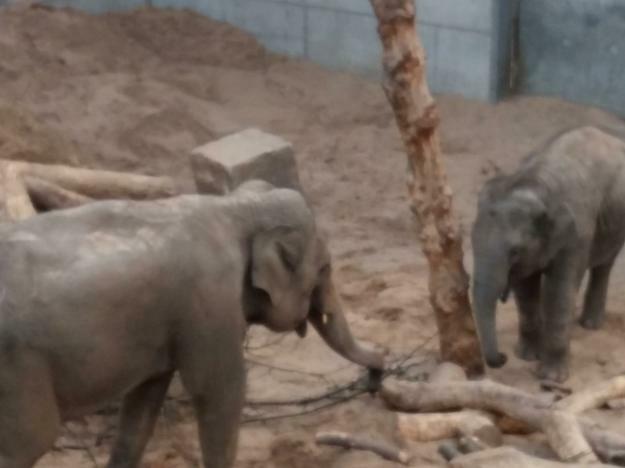 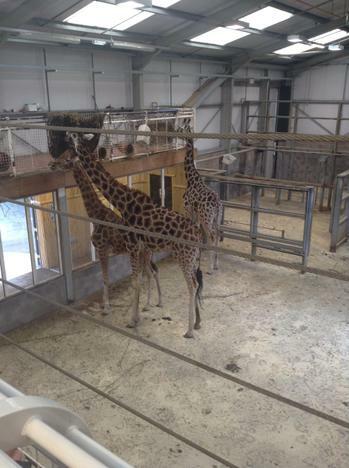 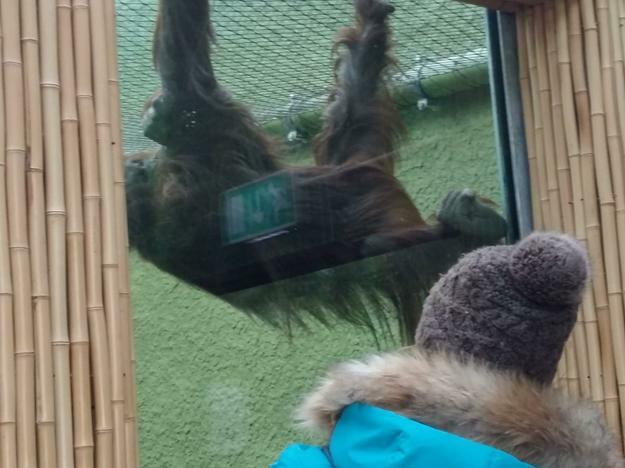 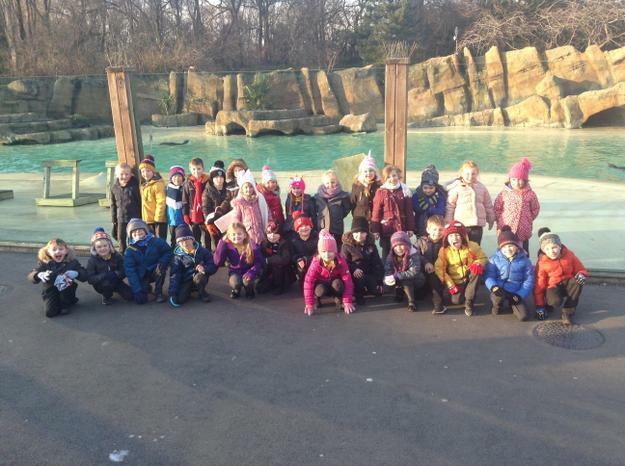 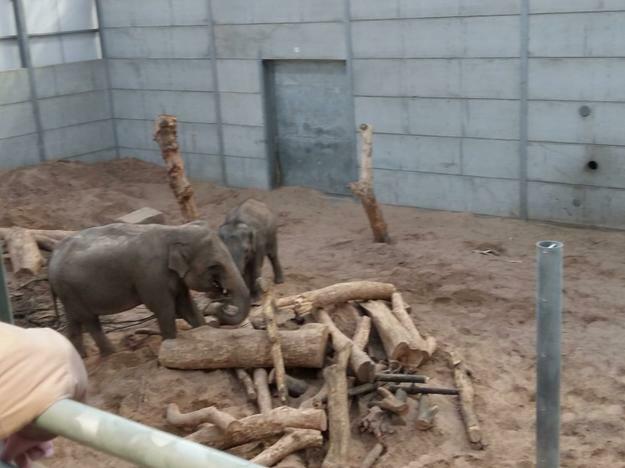 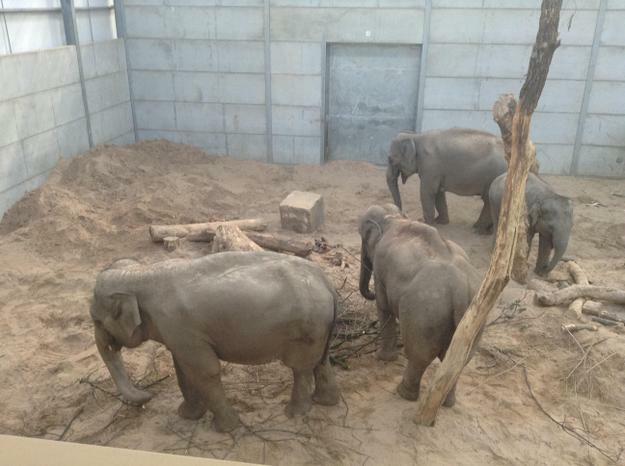 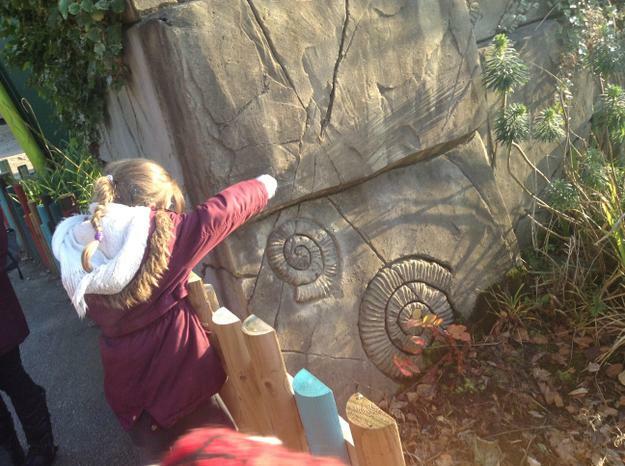 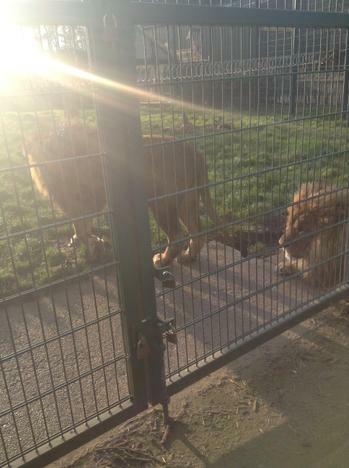 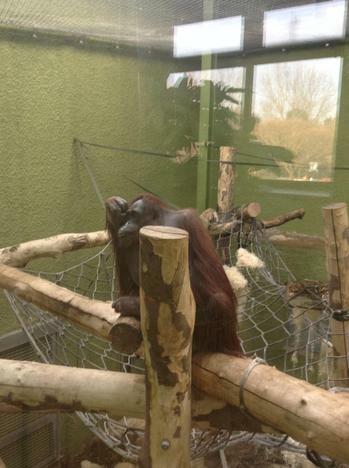 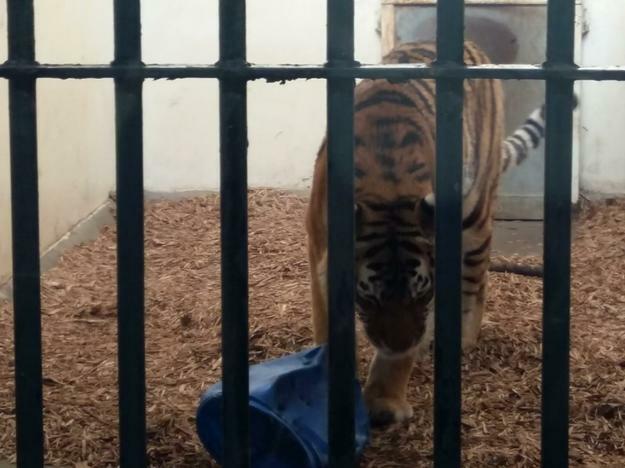 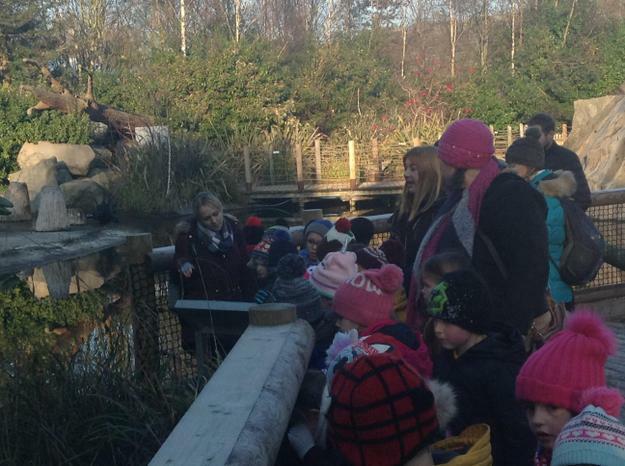 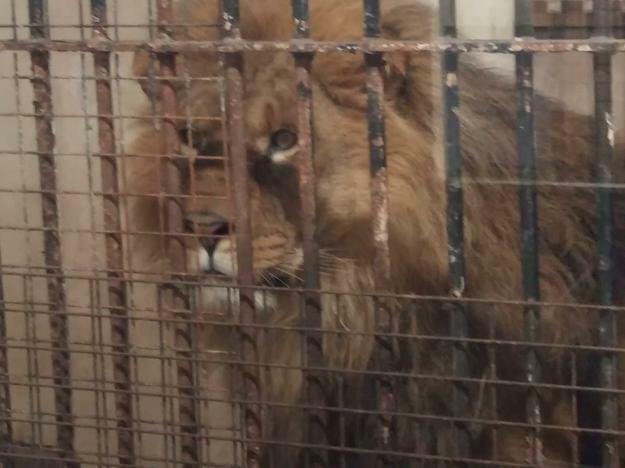 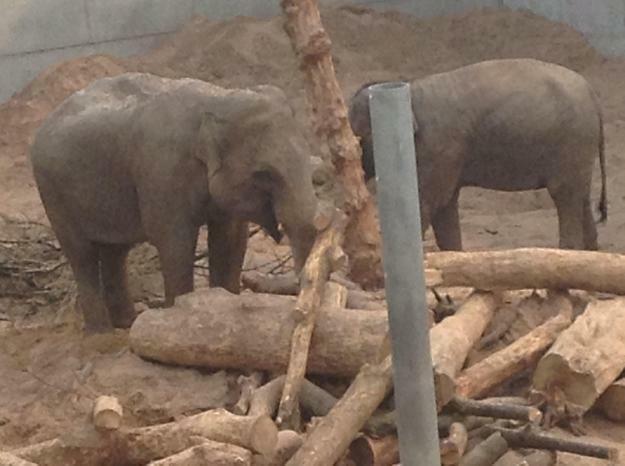 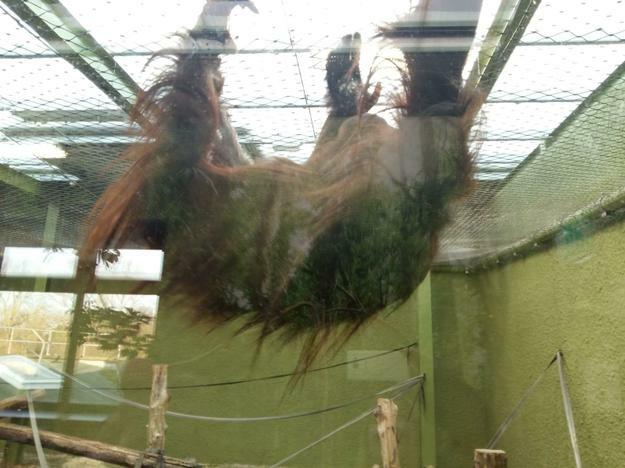 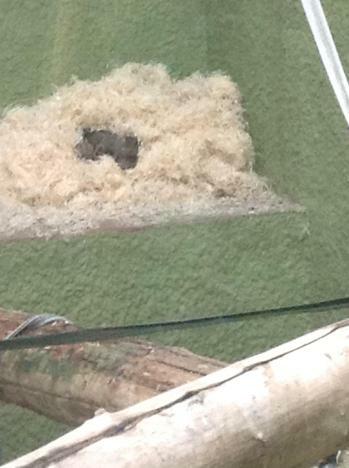 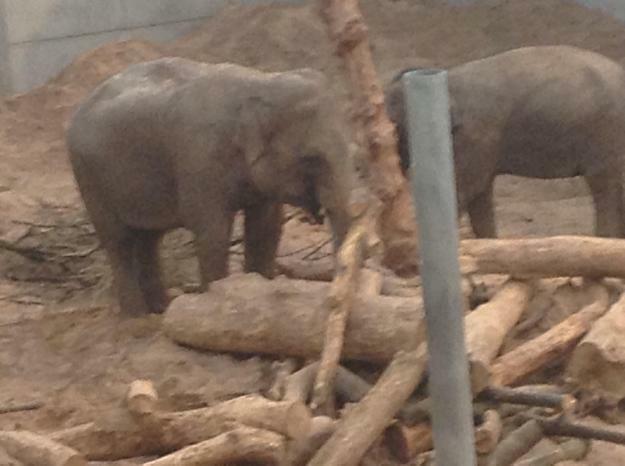 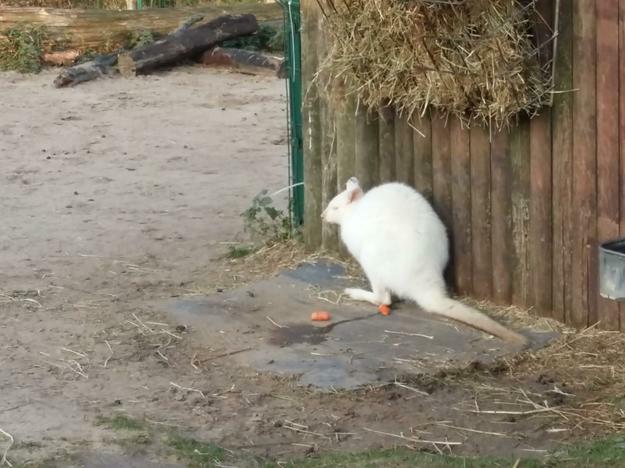 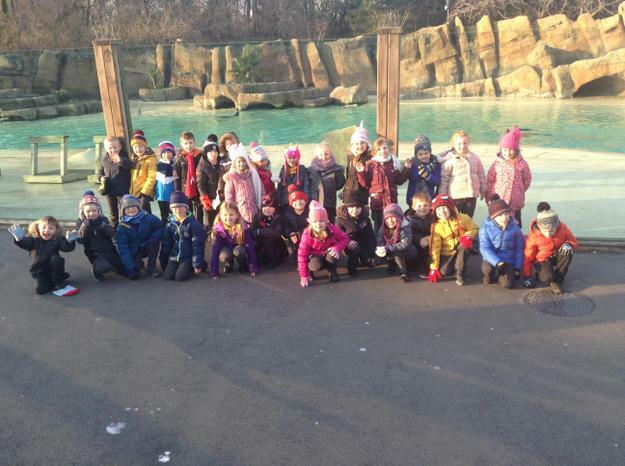 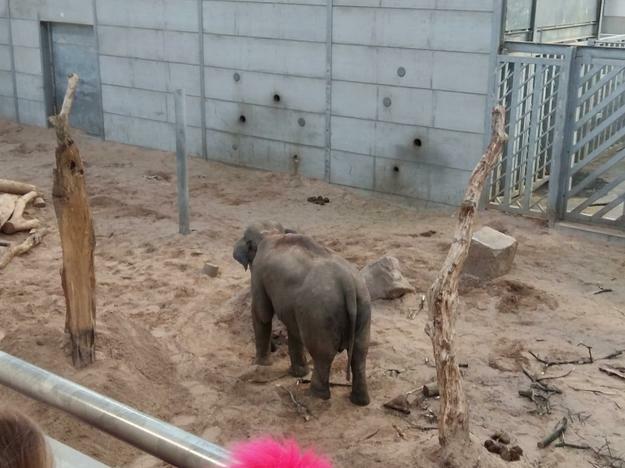 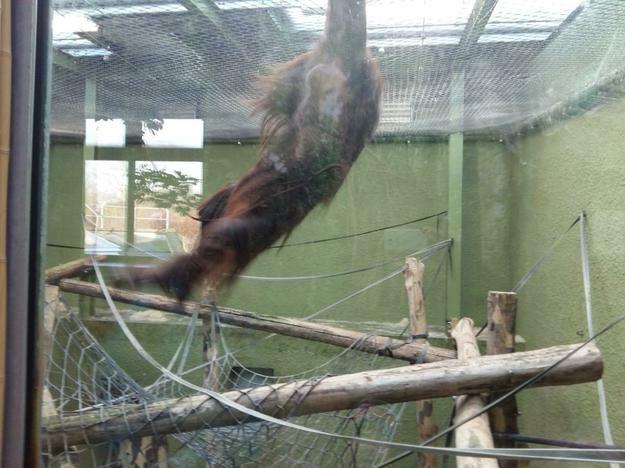 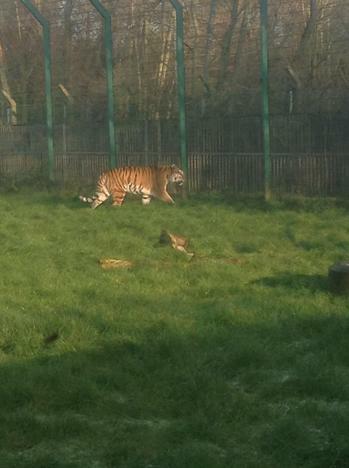 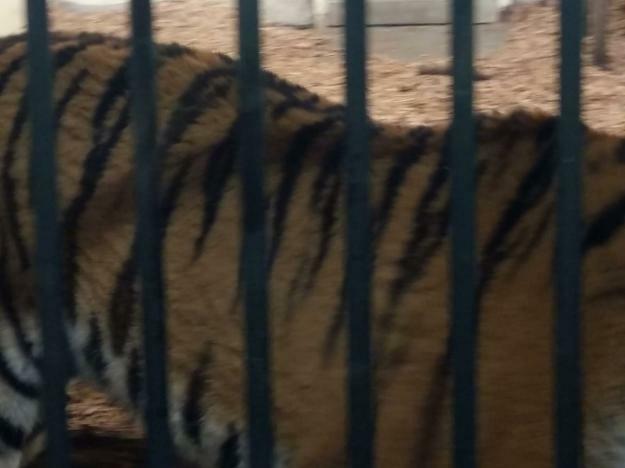 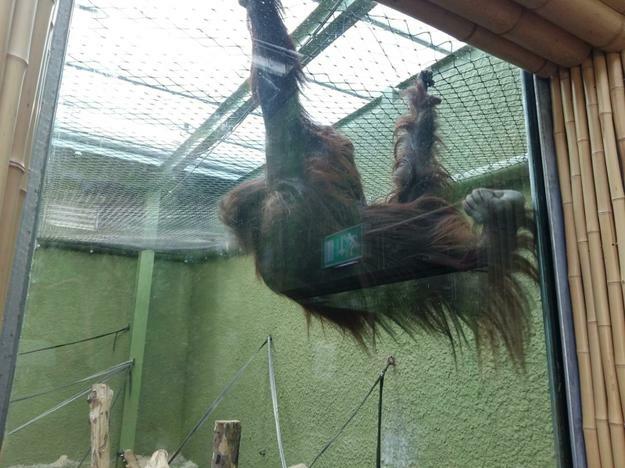 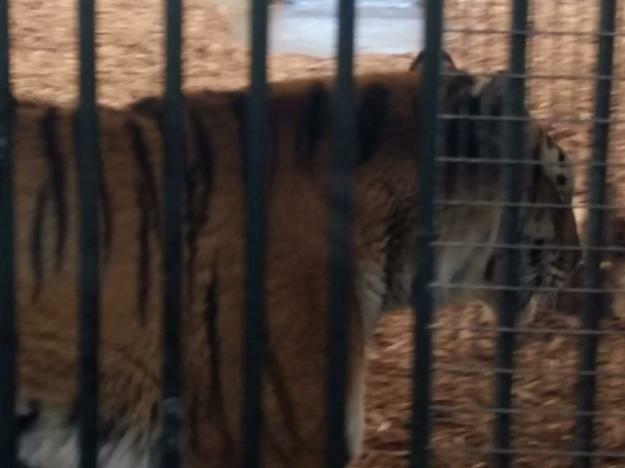 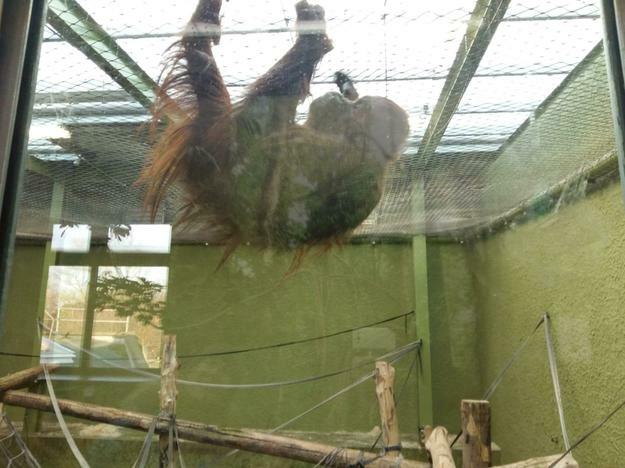 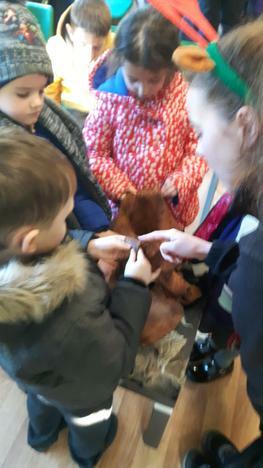 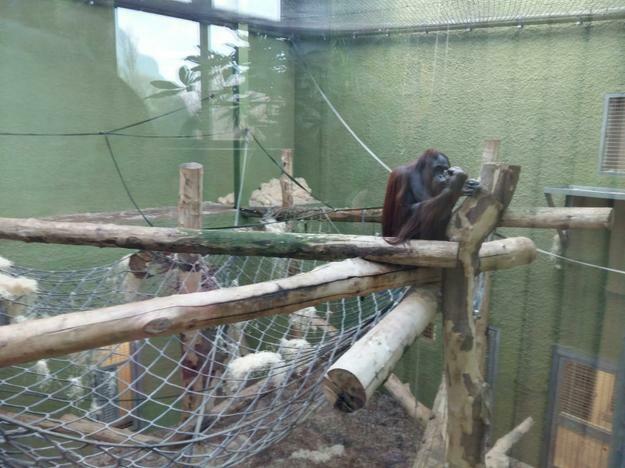 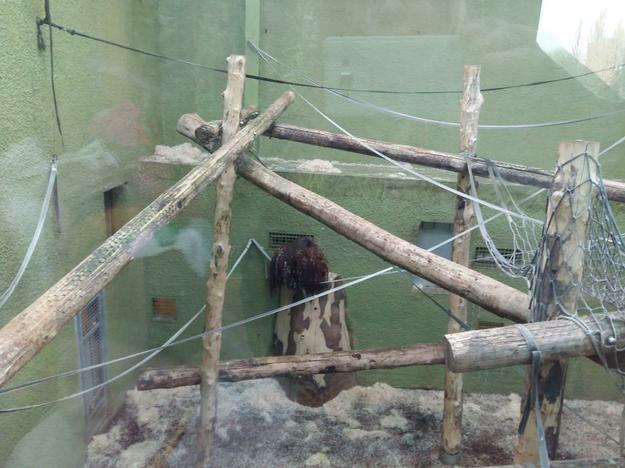 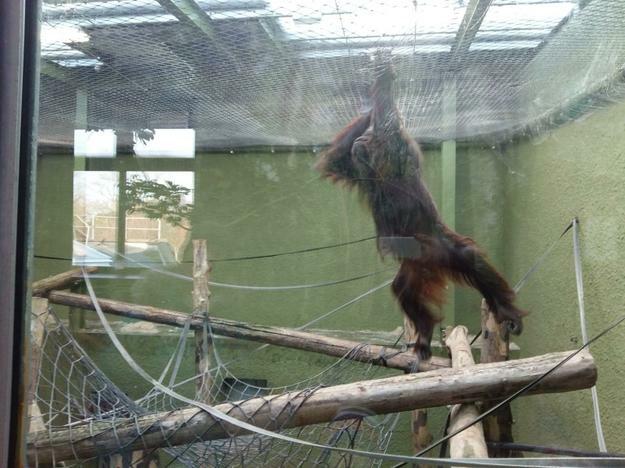 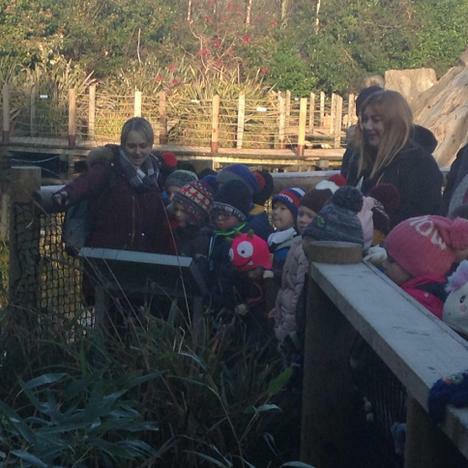 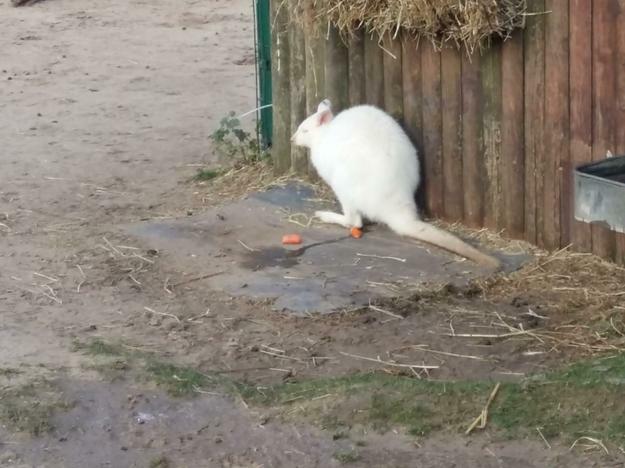 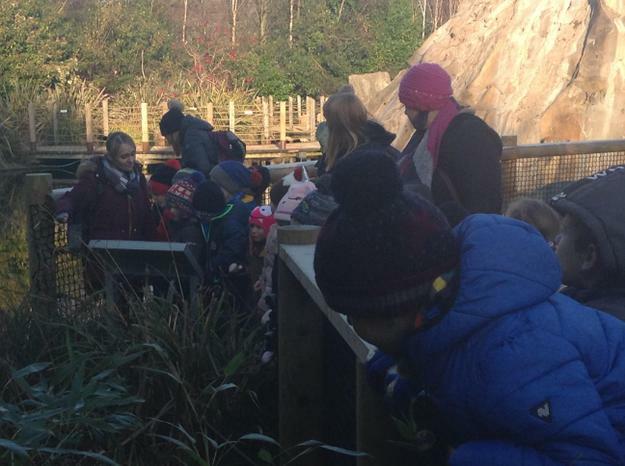 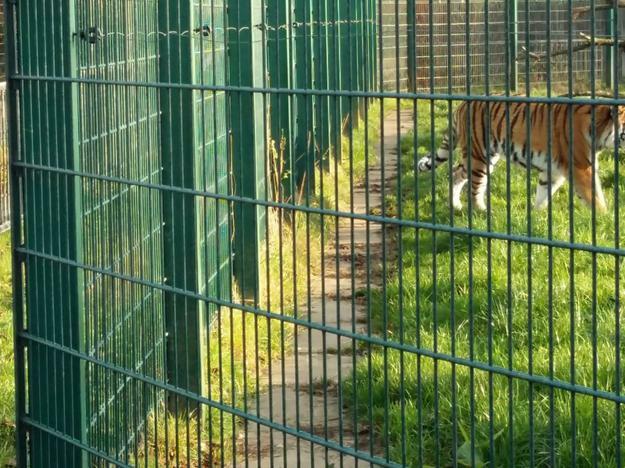 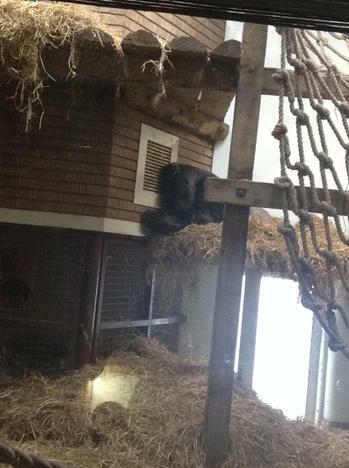 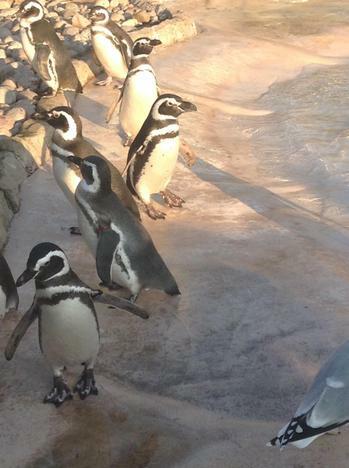 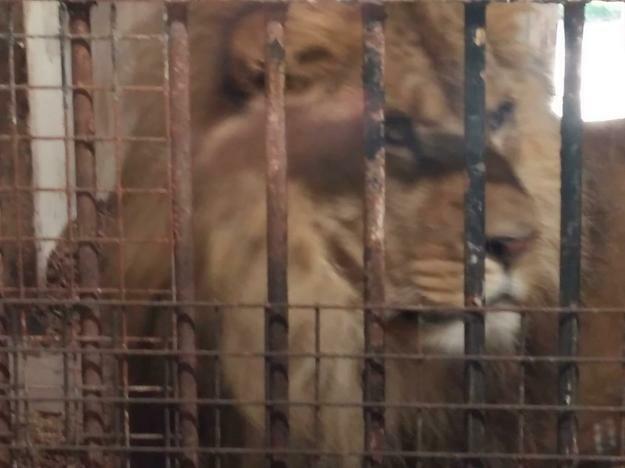 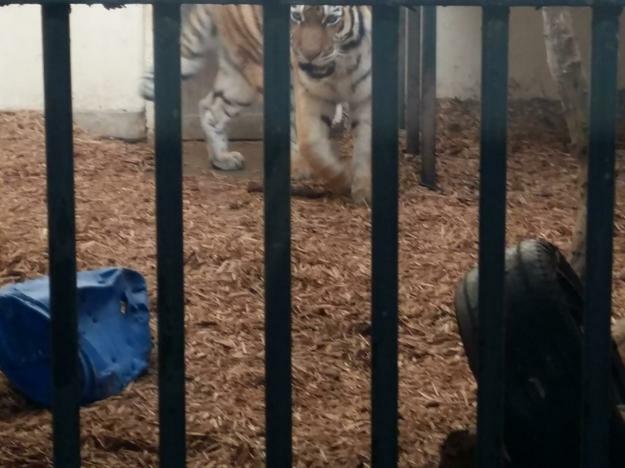 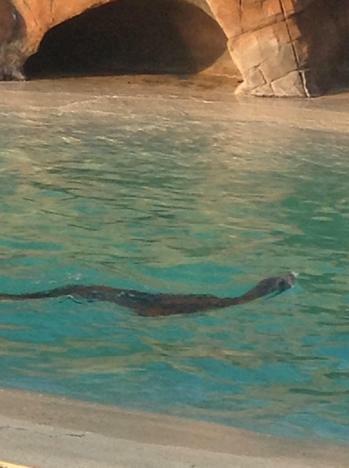 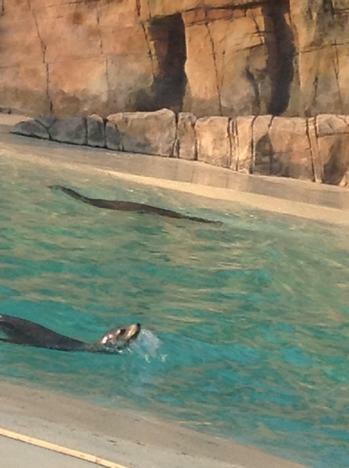 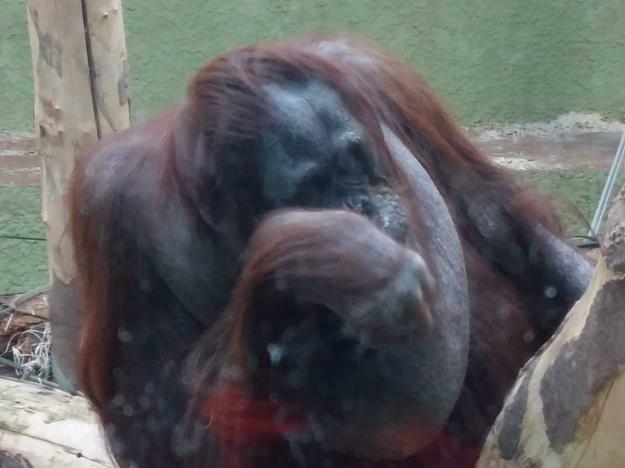 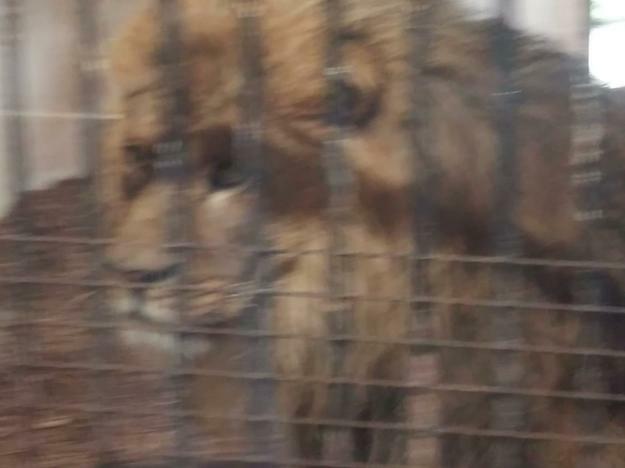 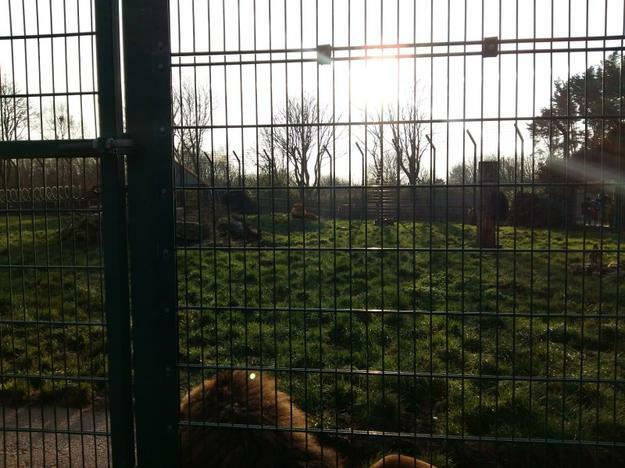 This was our tour around the animals. 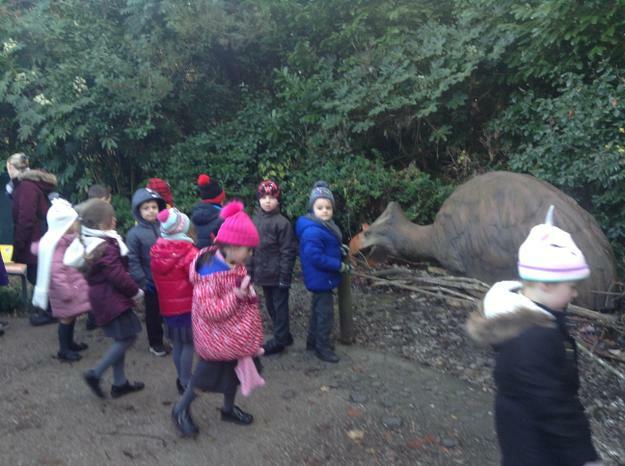 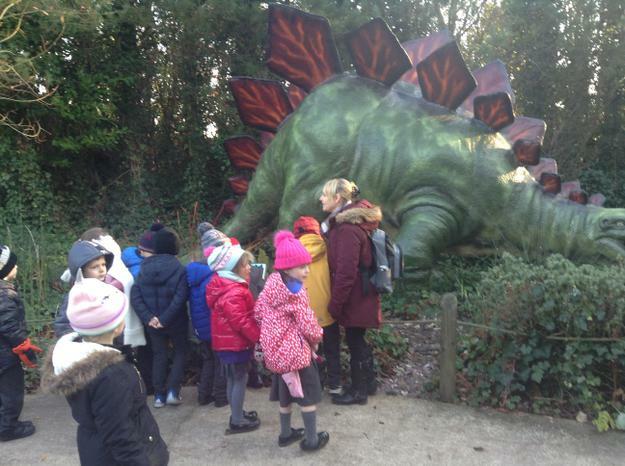 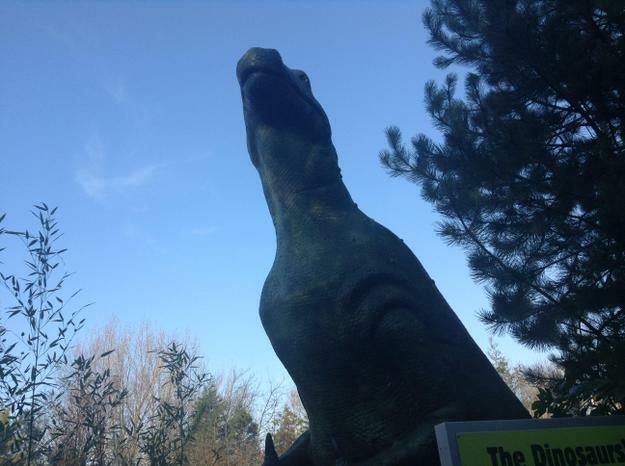 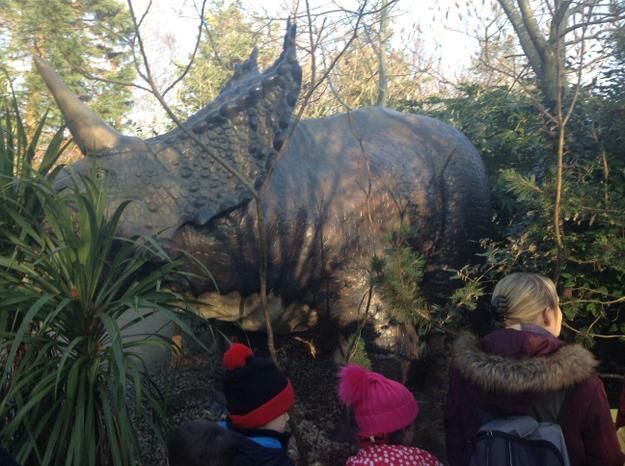 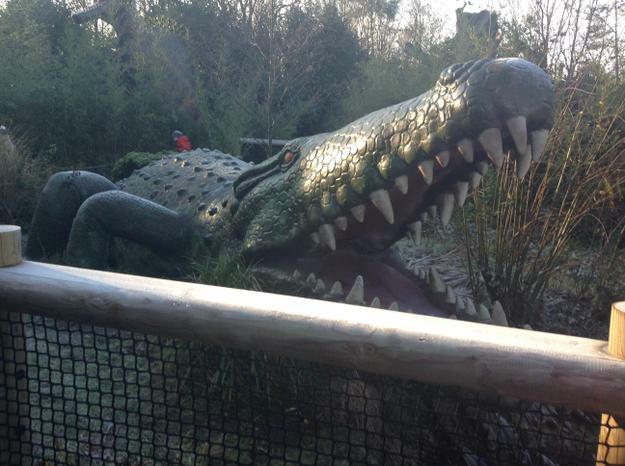 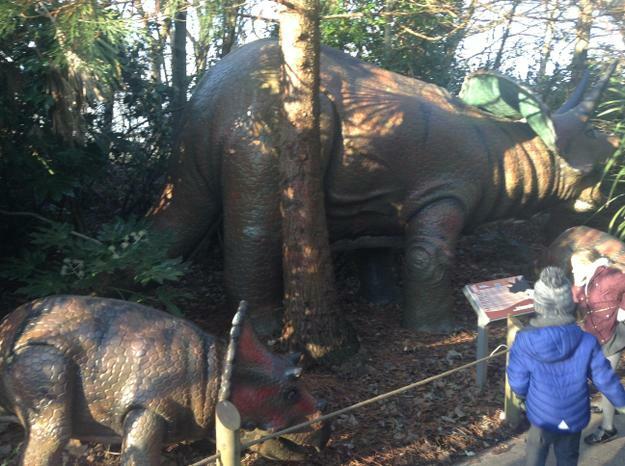 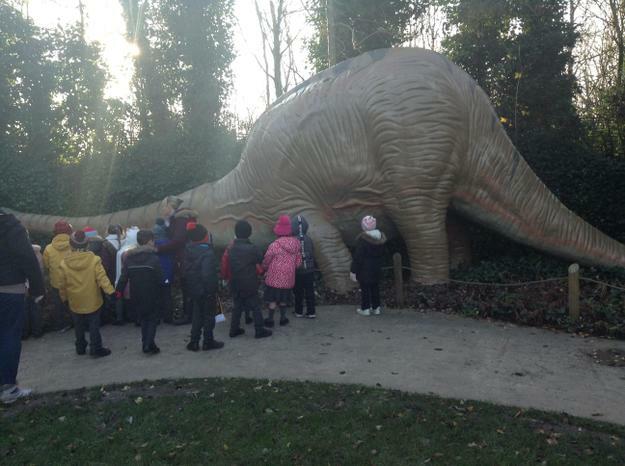 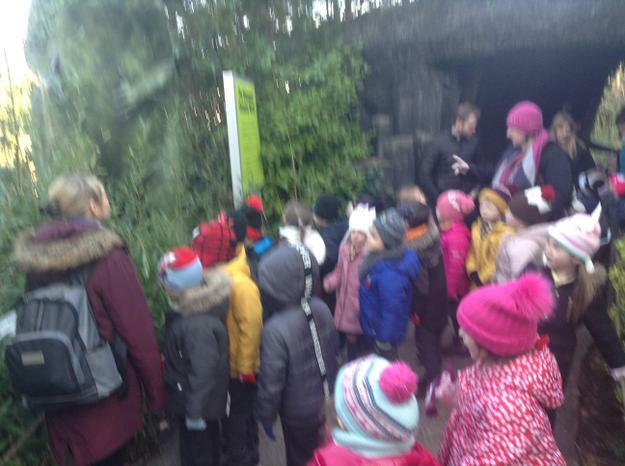 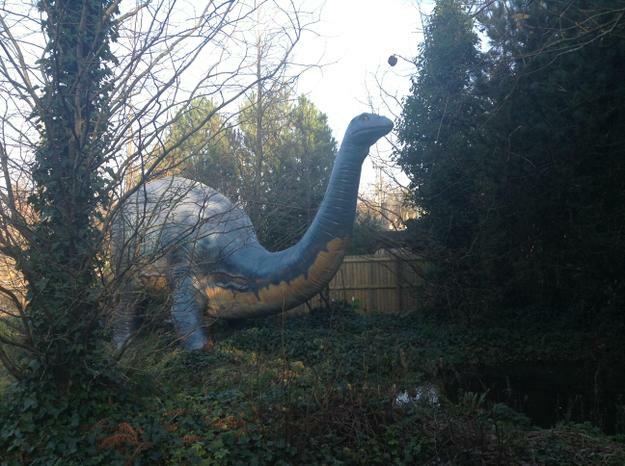 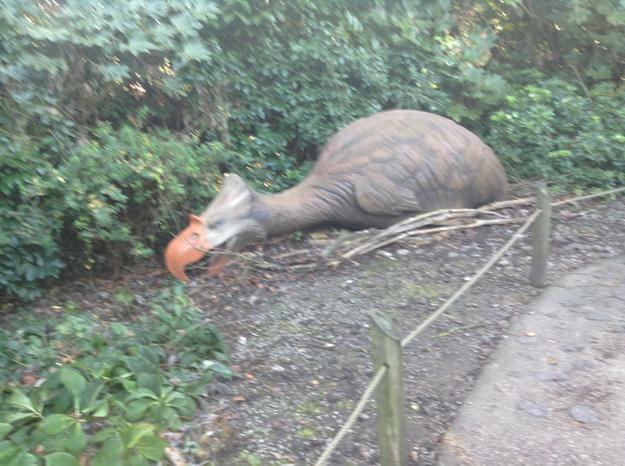 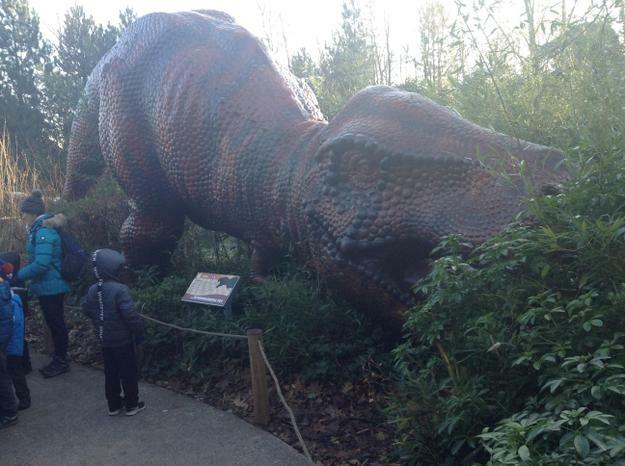 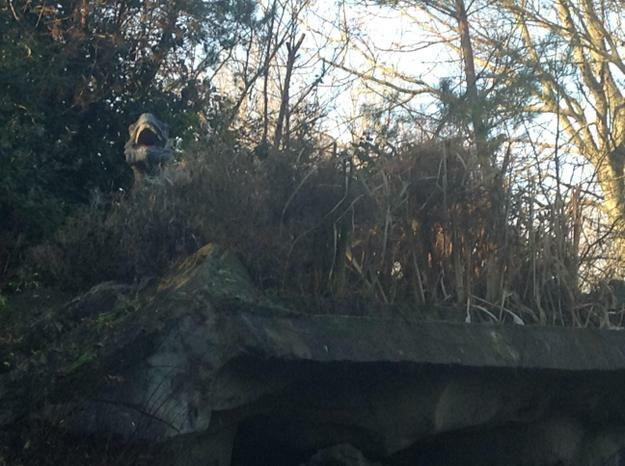 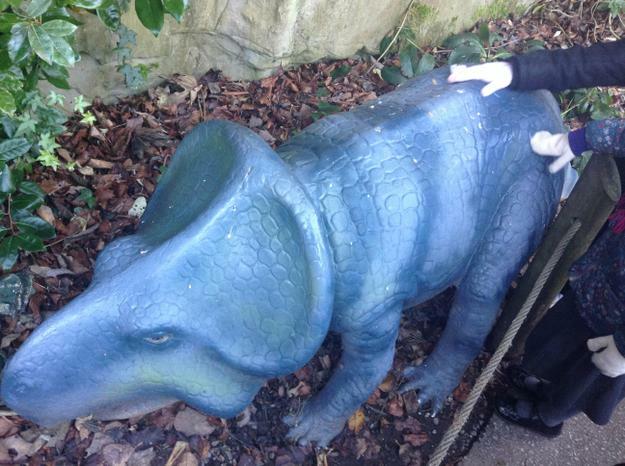 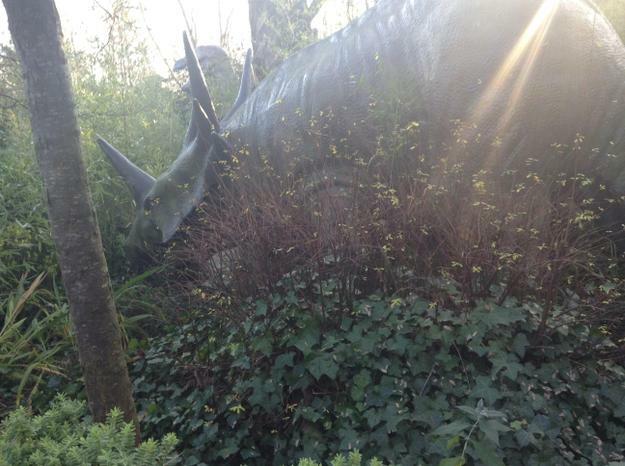 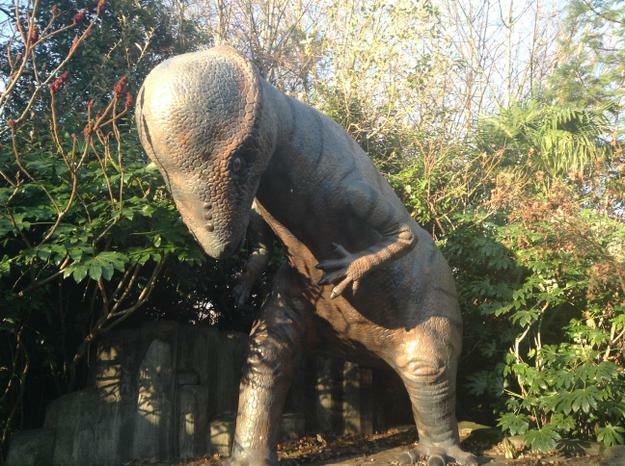 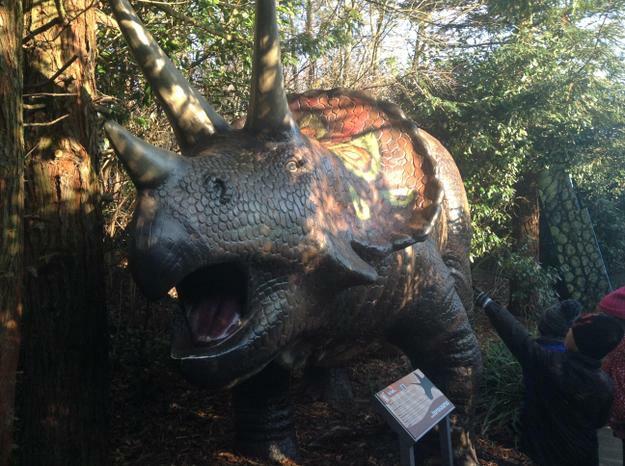 This was our tour around the dinosaur safari. 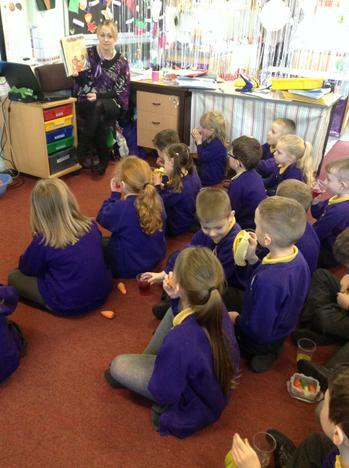 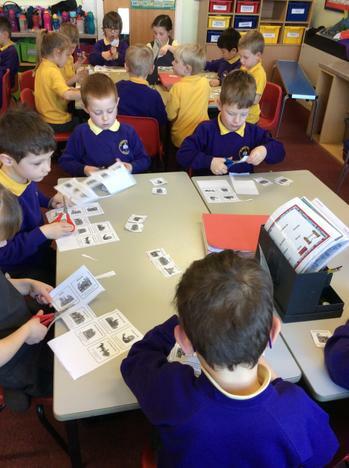 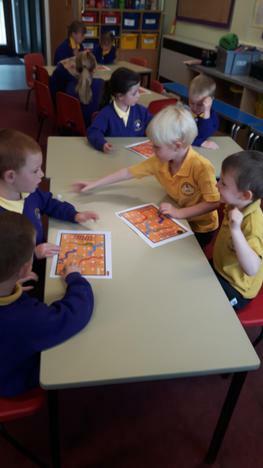 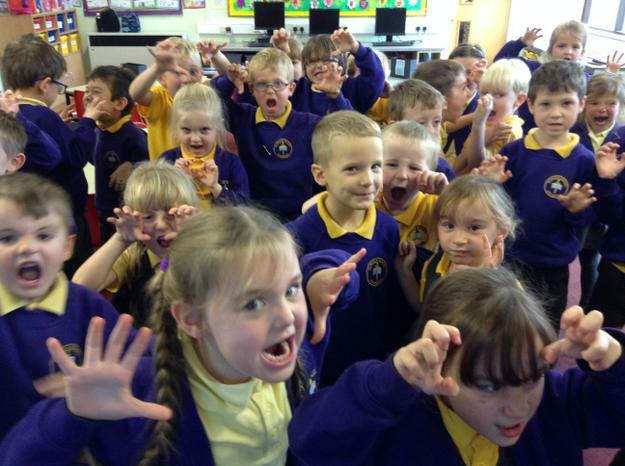 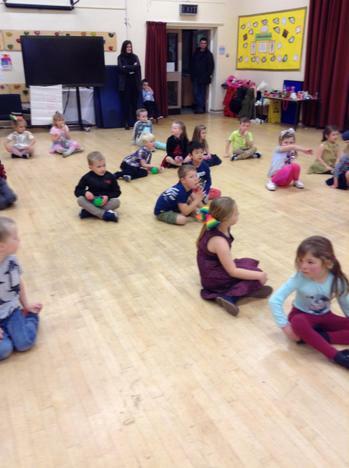 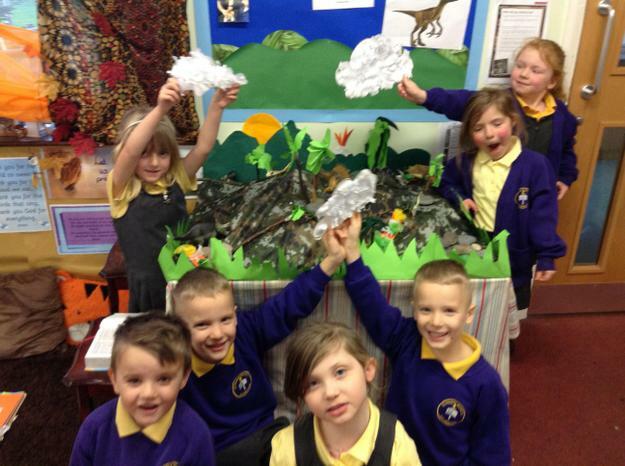 This was our Roarsome Dinosaur classroom session. 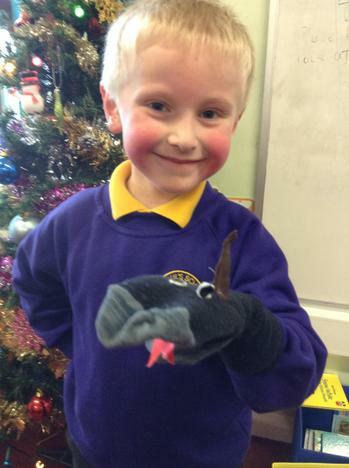 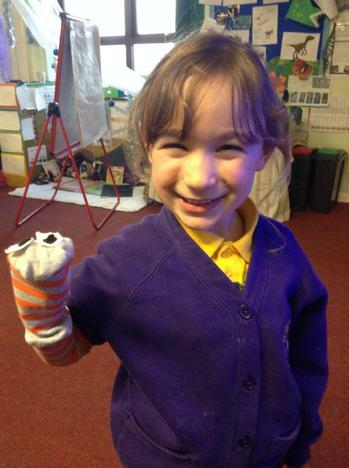 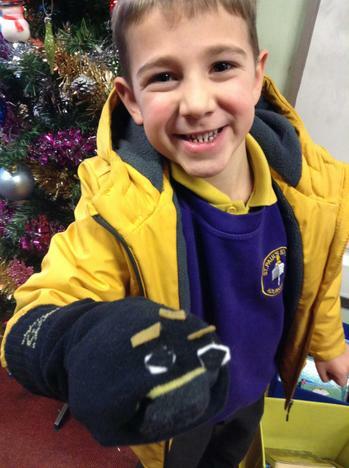 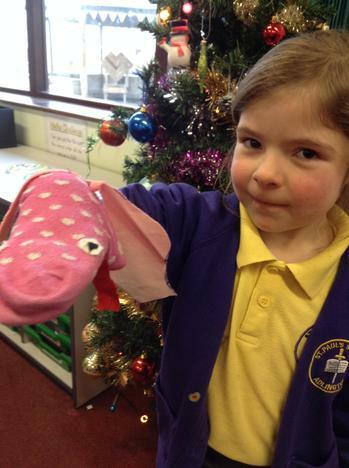 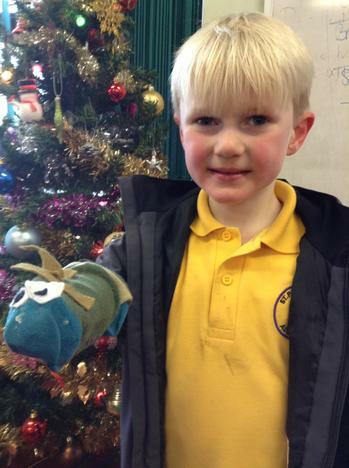 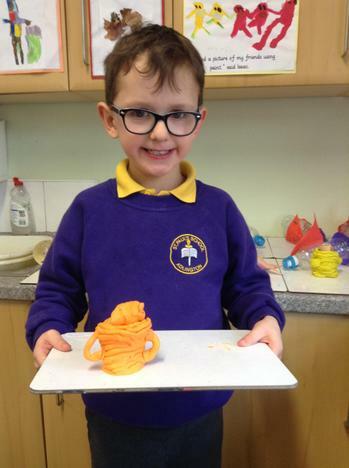 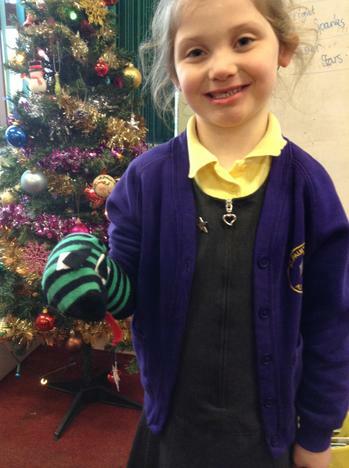 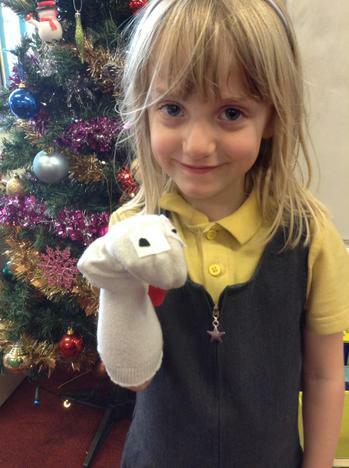 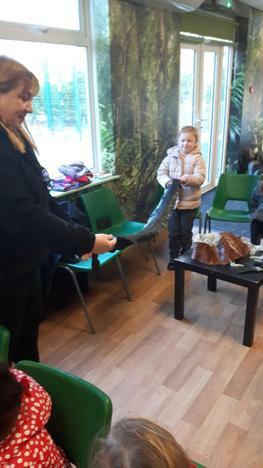 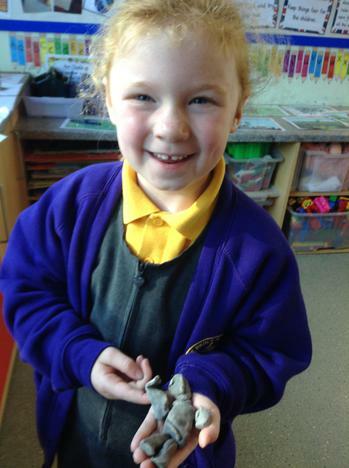 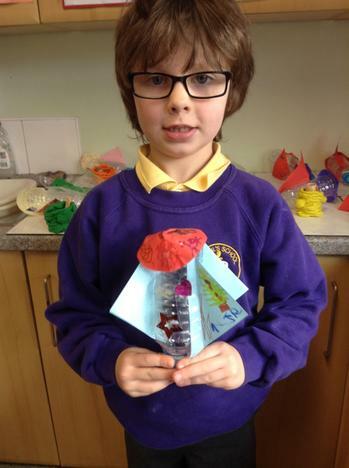 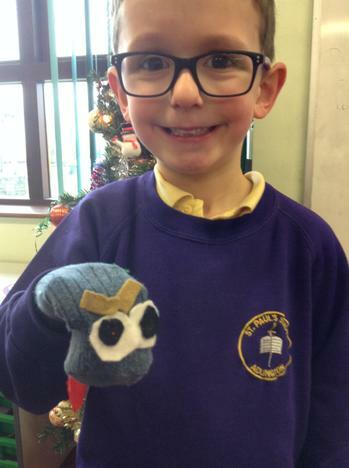 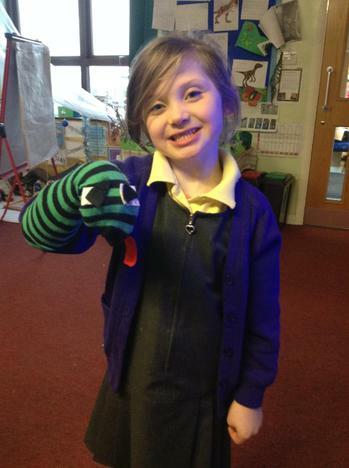 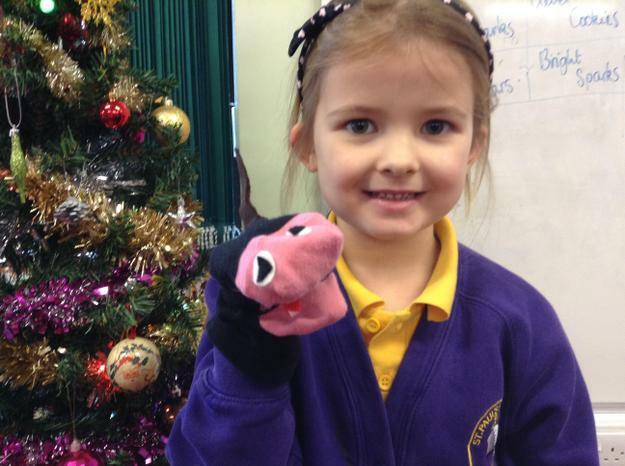 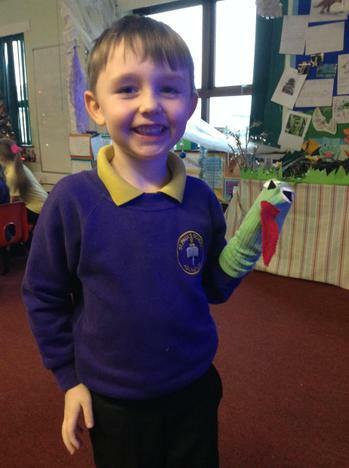 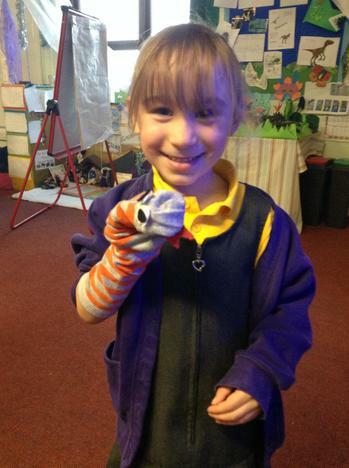 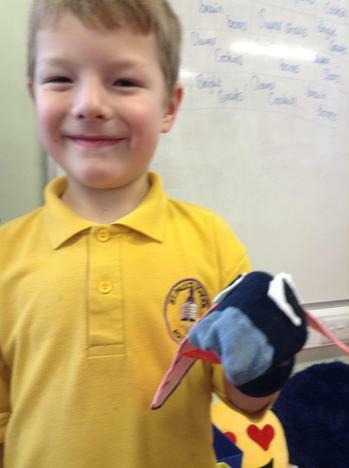 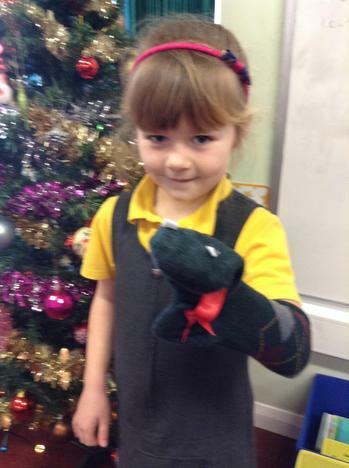 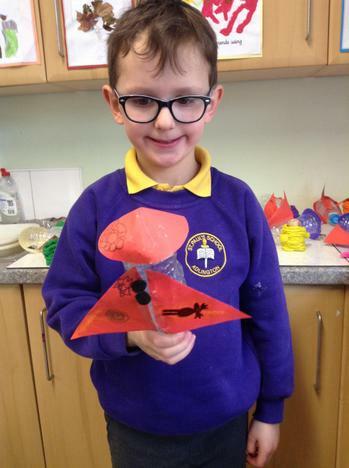 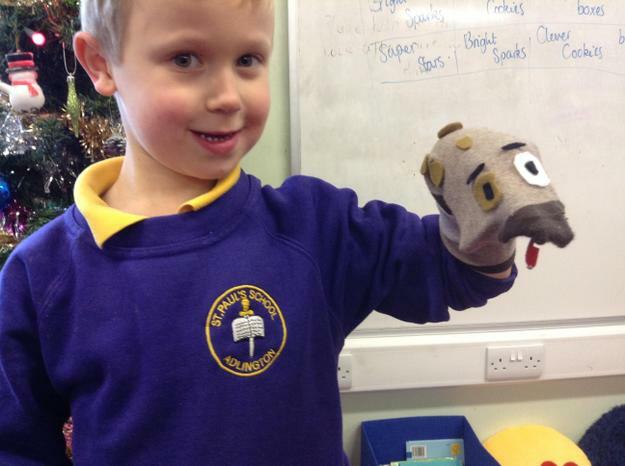 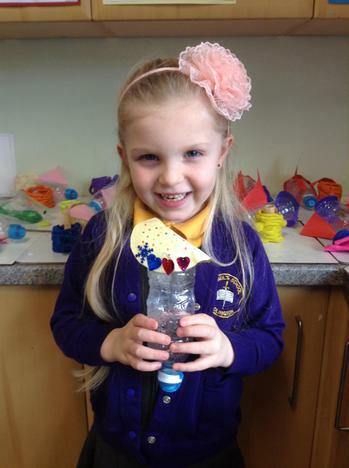 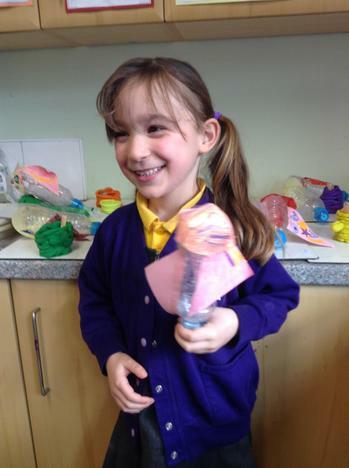 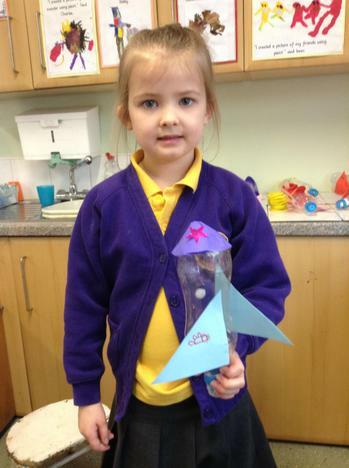 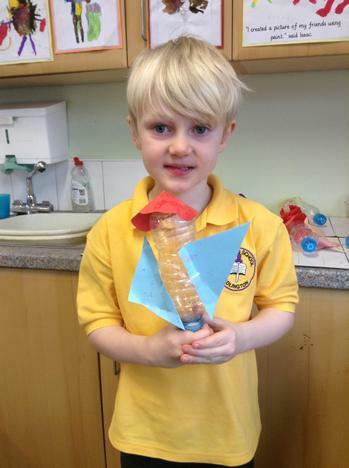 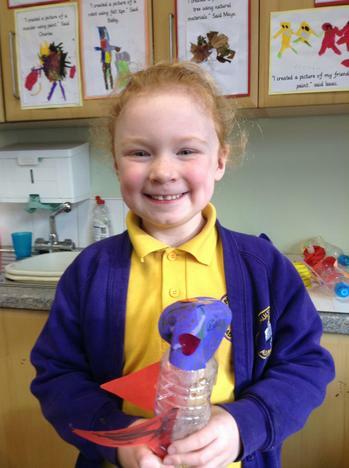 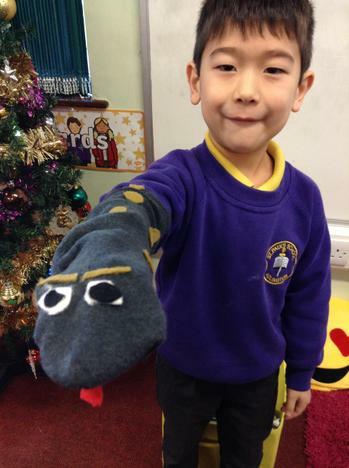 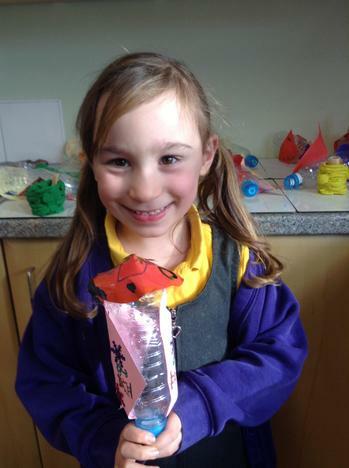 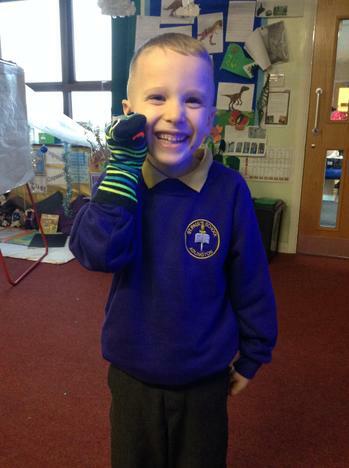 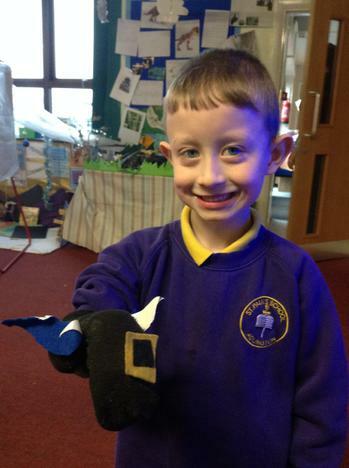 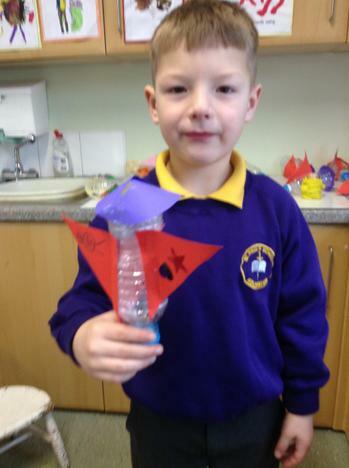 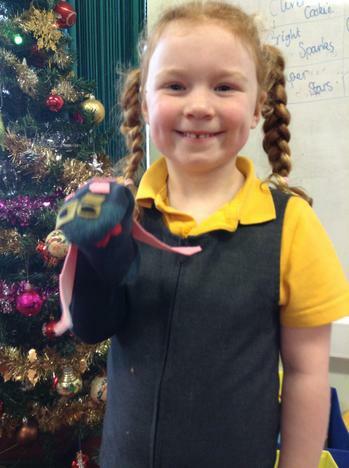 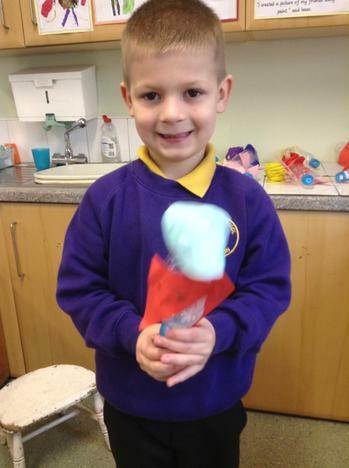 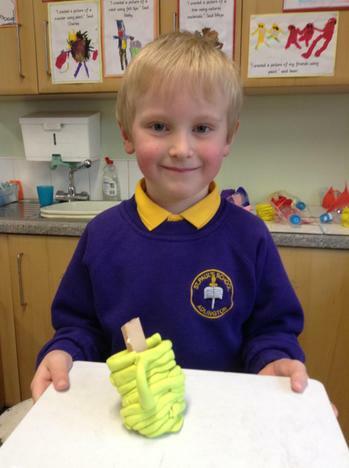 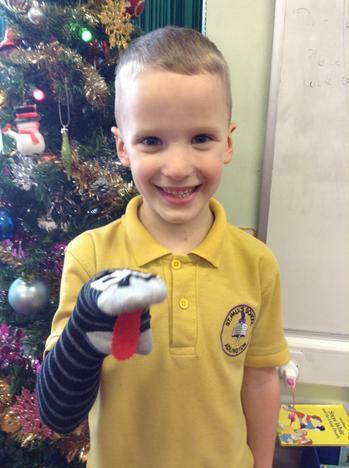 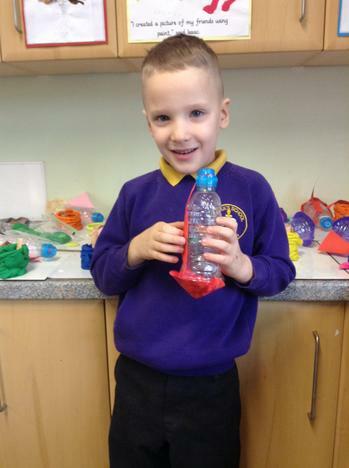 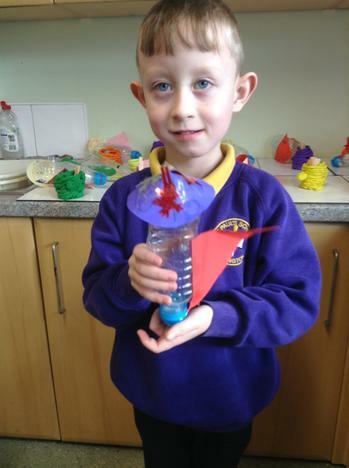 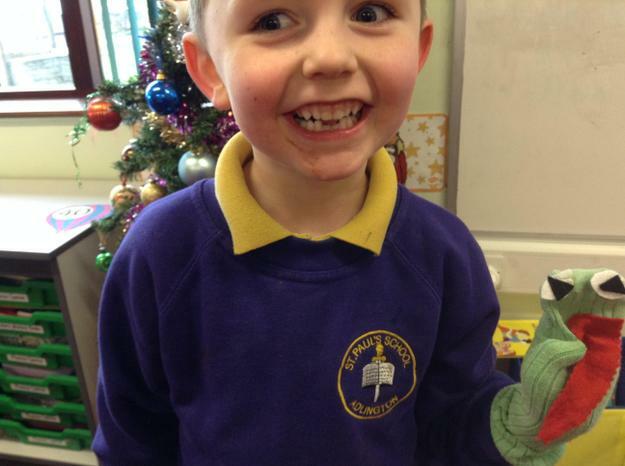 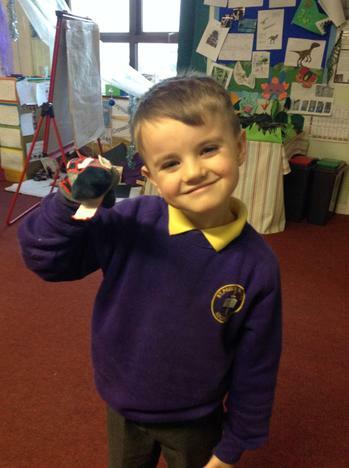 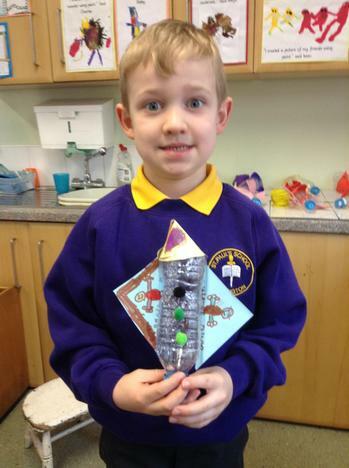 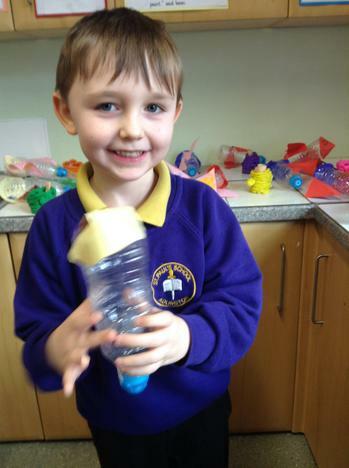 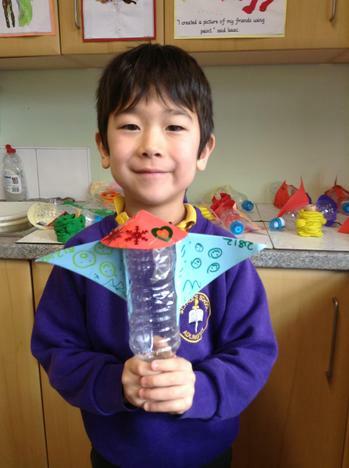 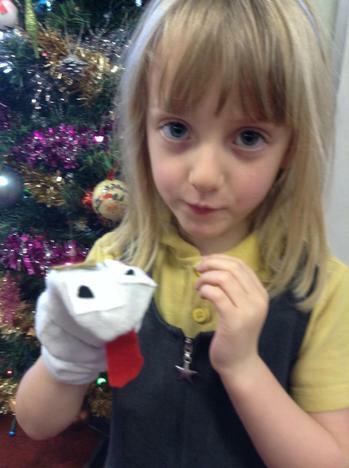 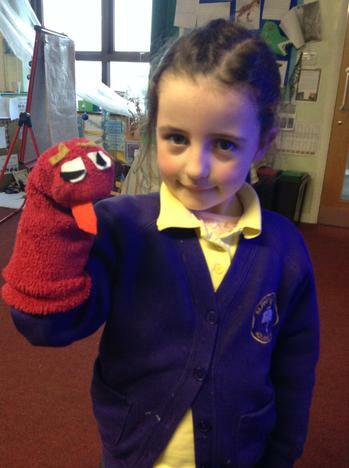 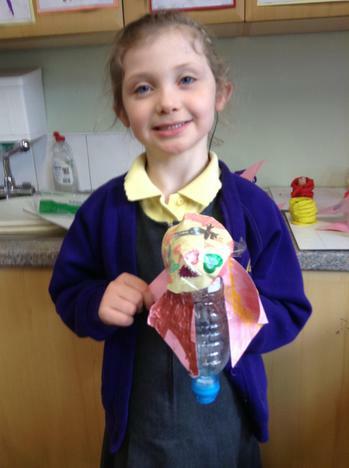 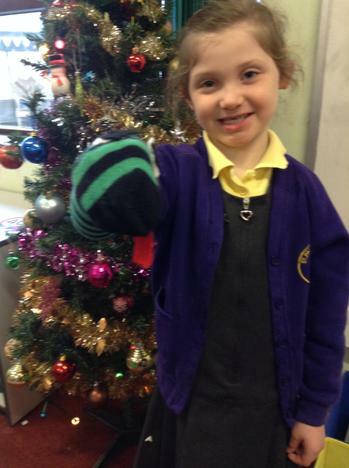 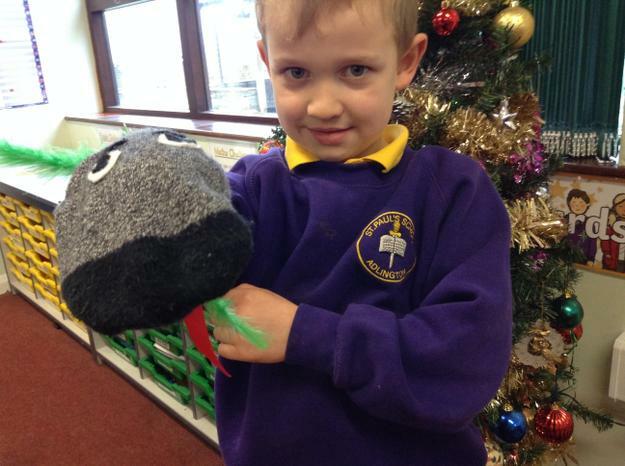 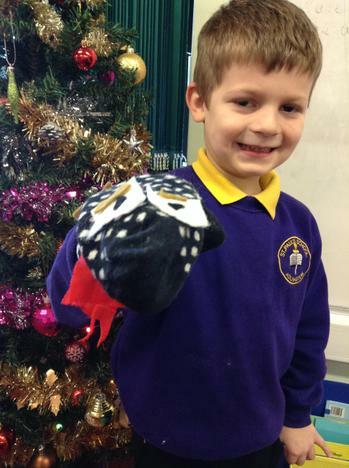 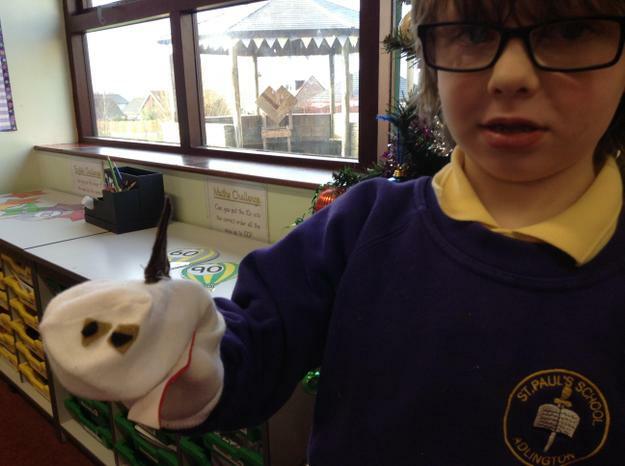 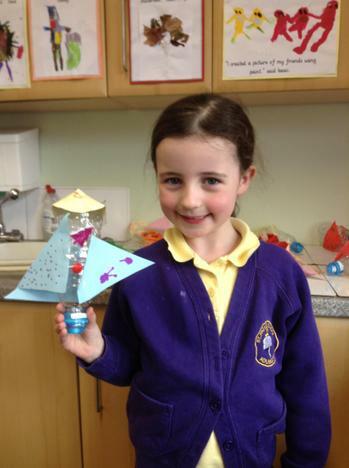 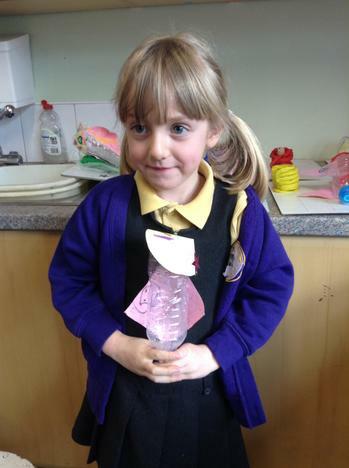 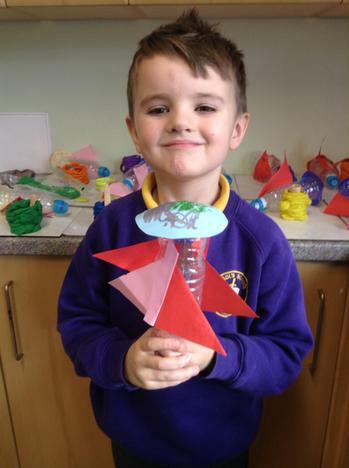 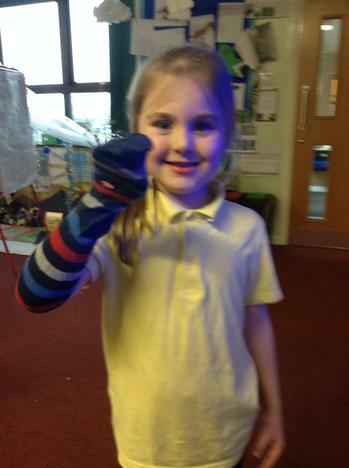 The children enjoyed creating a 'sockasaurus' puppet to be an exhibit in our dinosaur museum. 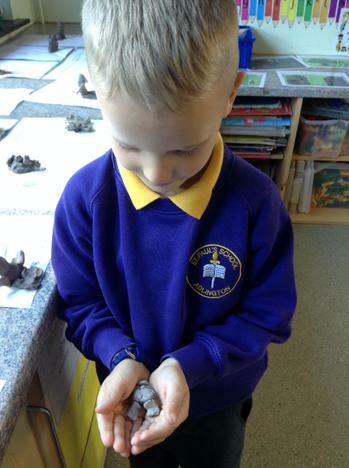 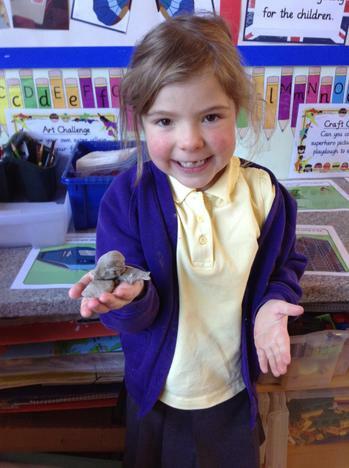 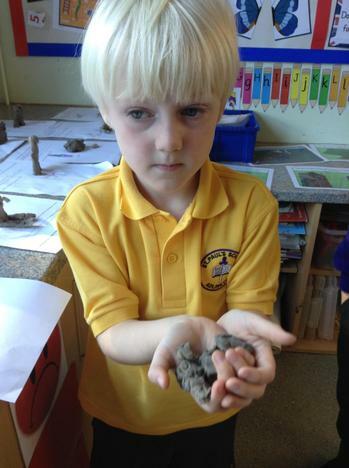 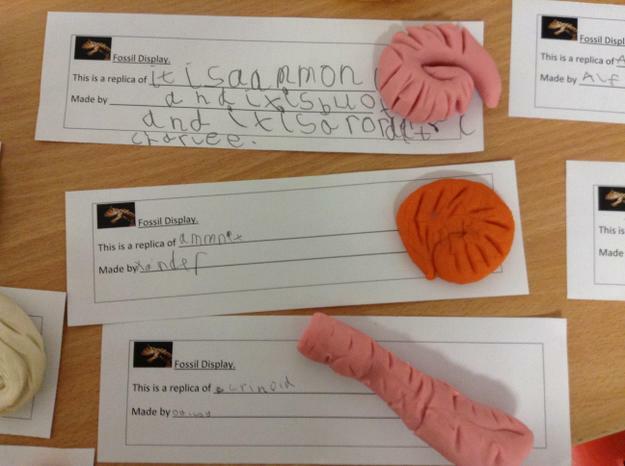 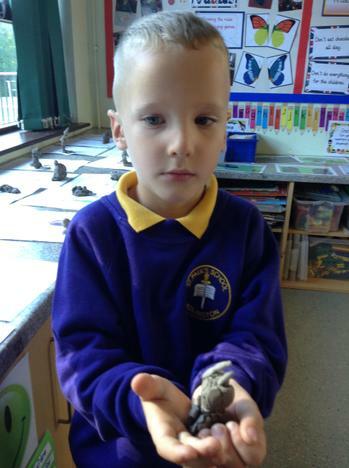 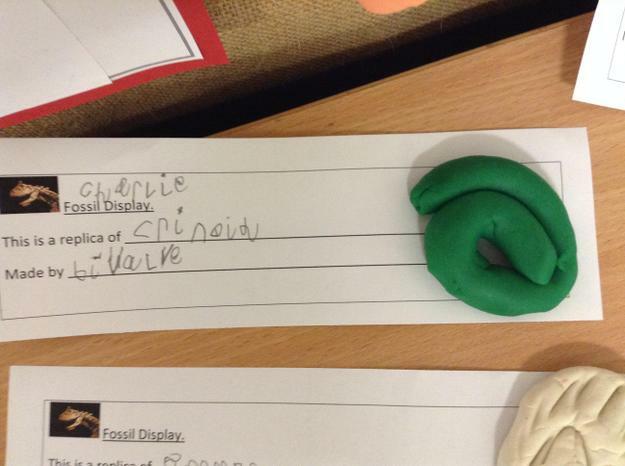 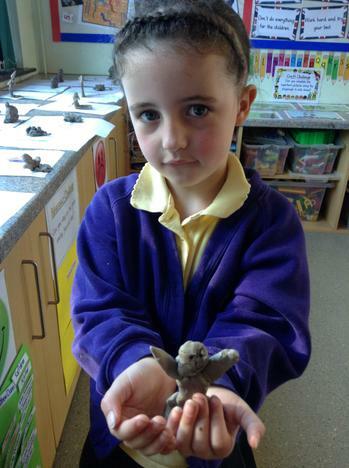 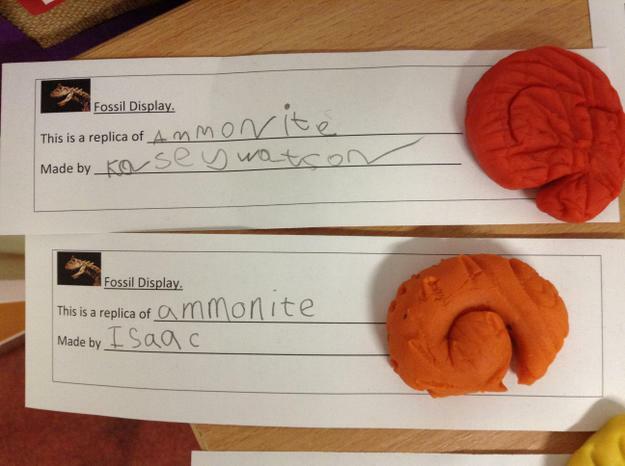 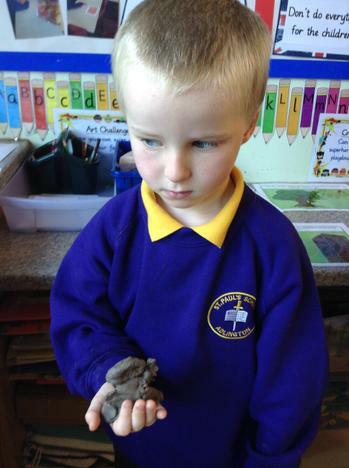 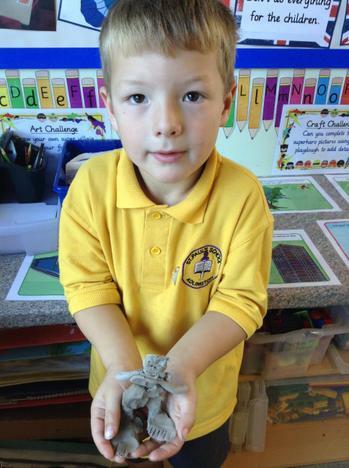 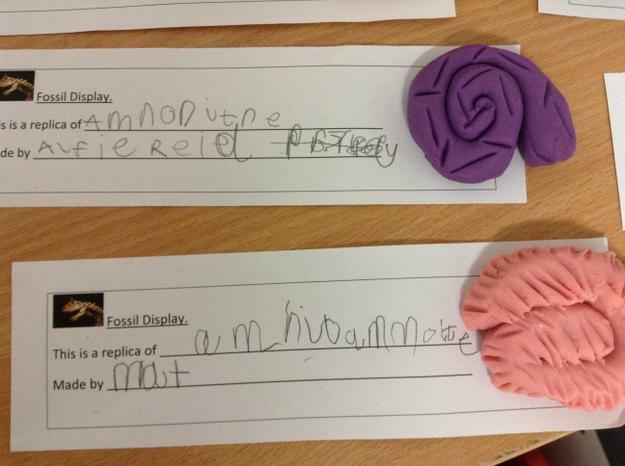 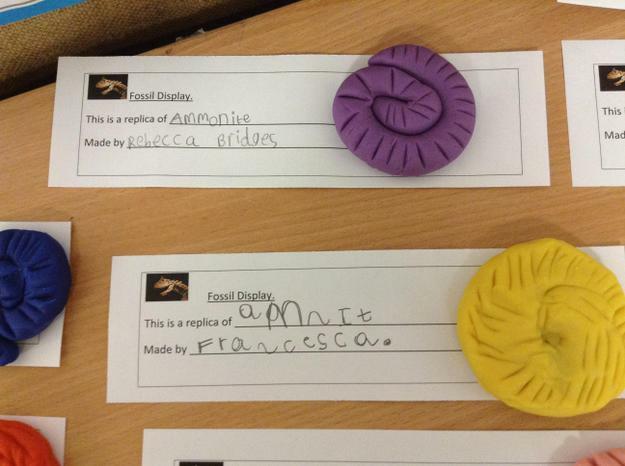 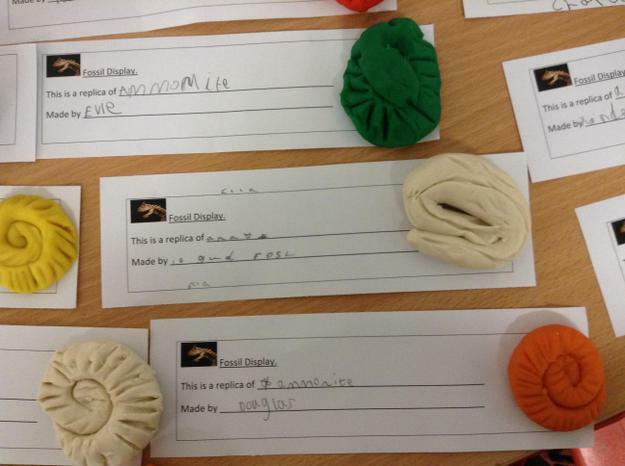 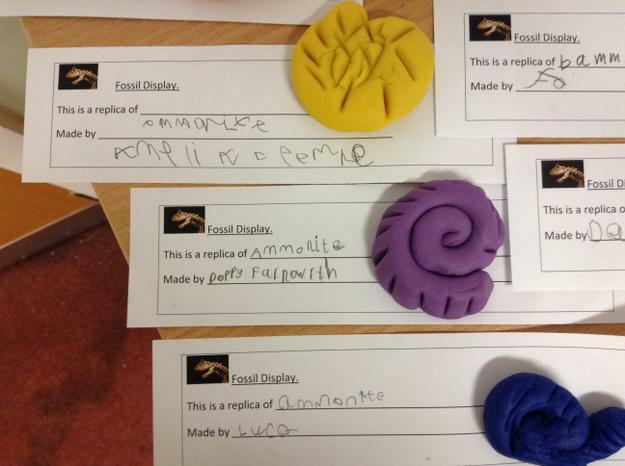 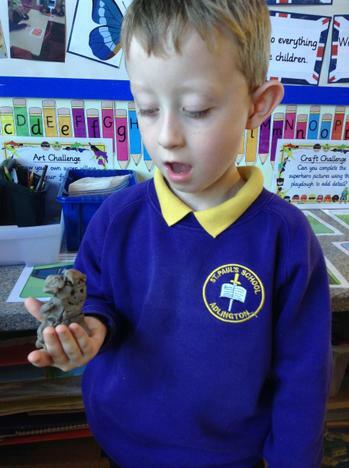 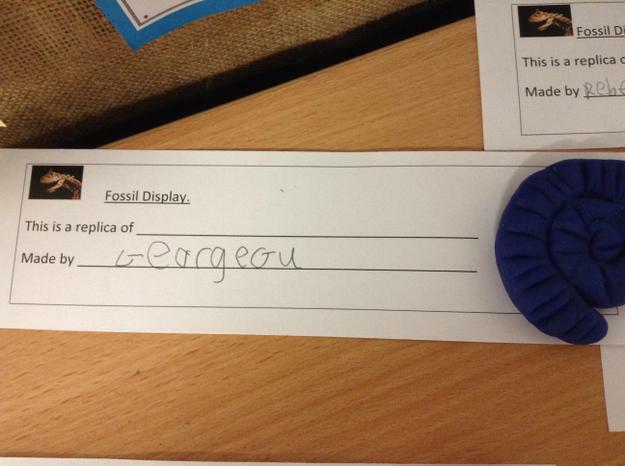 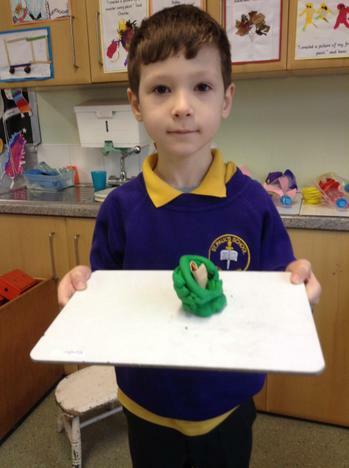 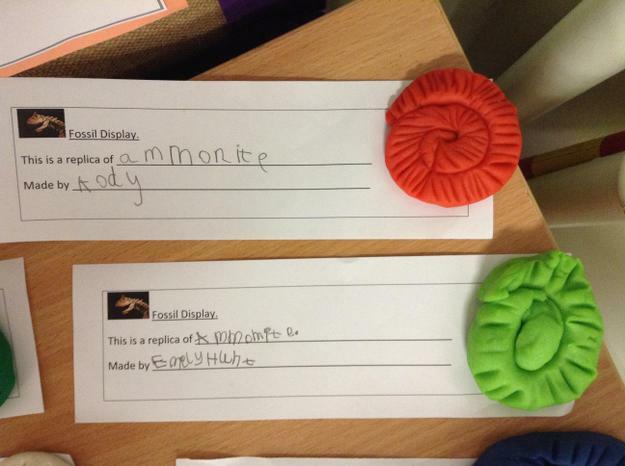 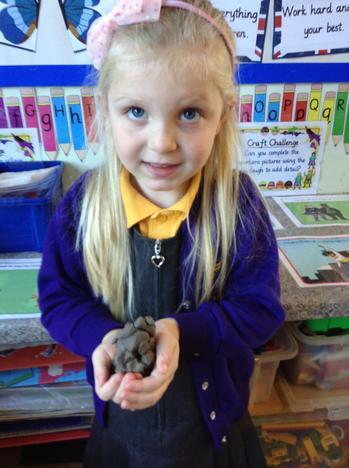 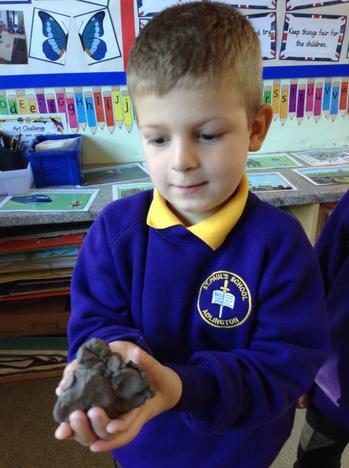 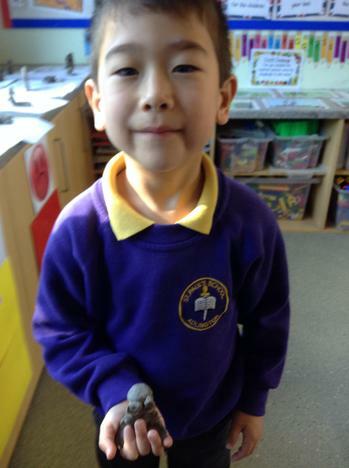 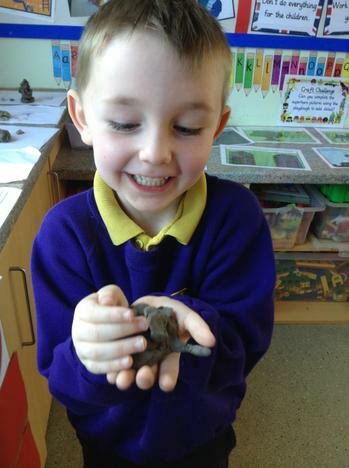 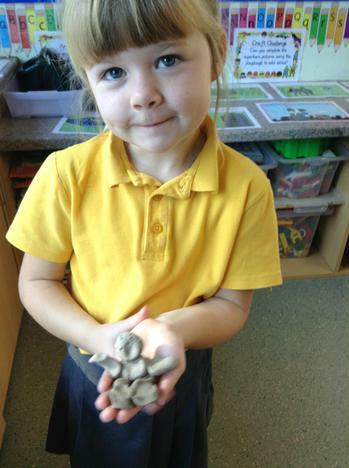 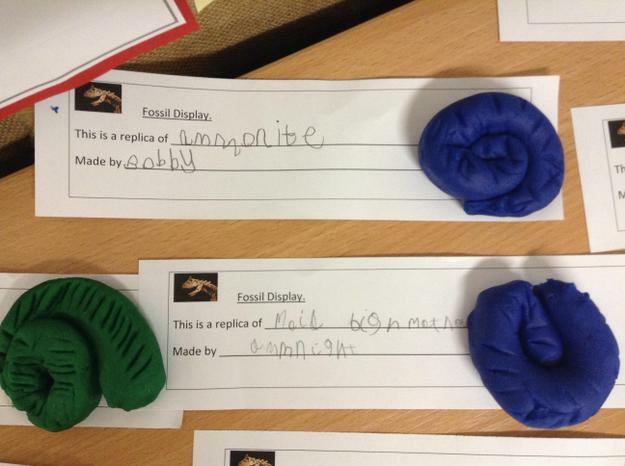 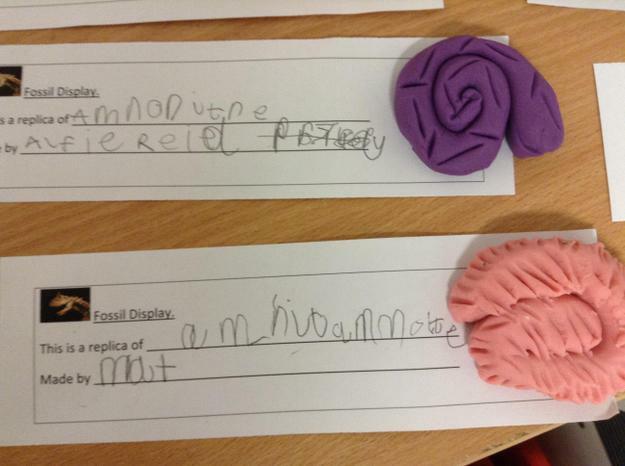 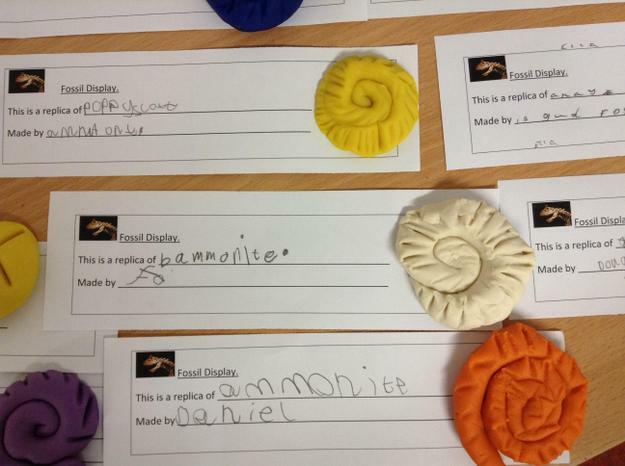 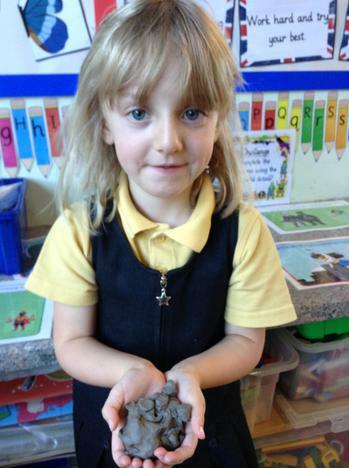 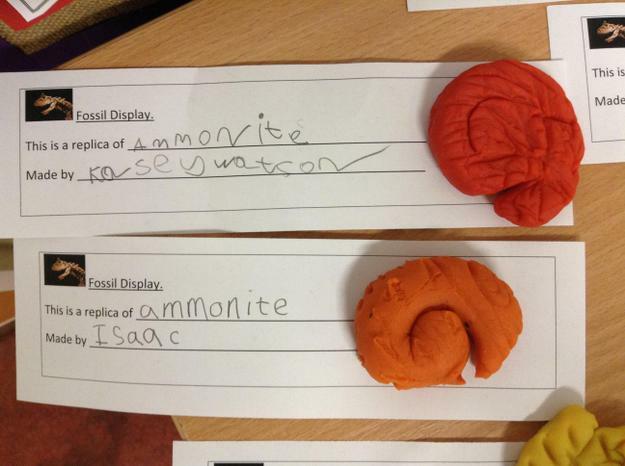 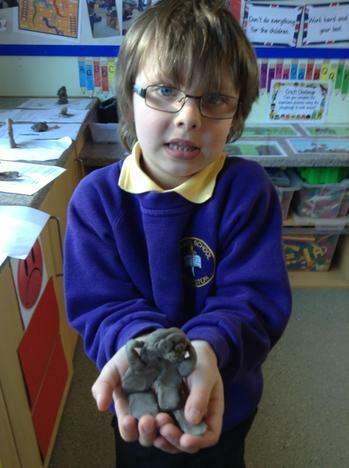 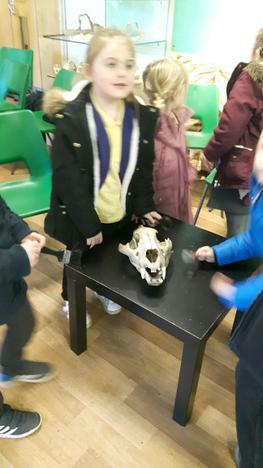 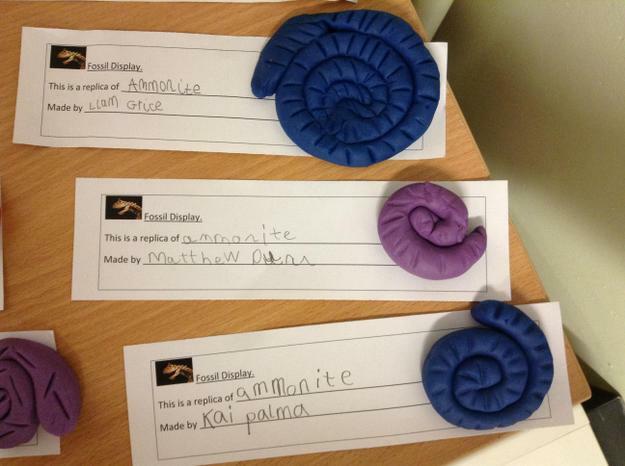 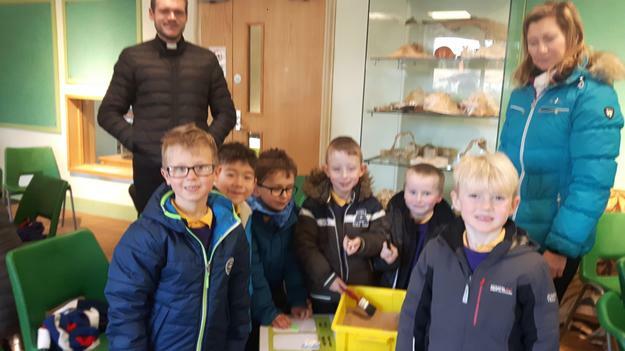 The children made their own fossils to be exhibits in our dinosaur museum. 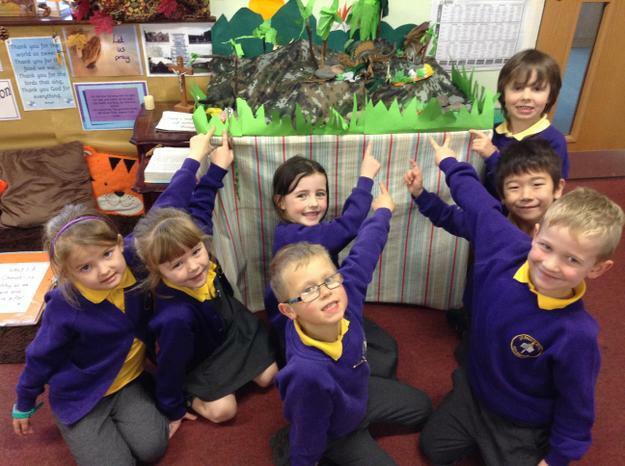 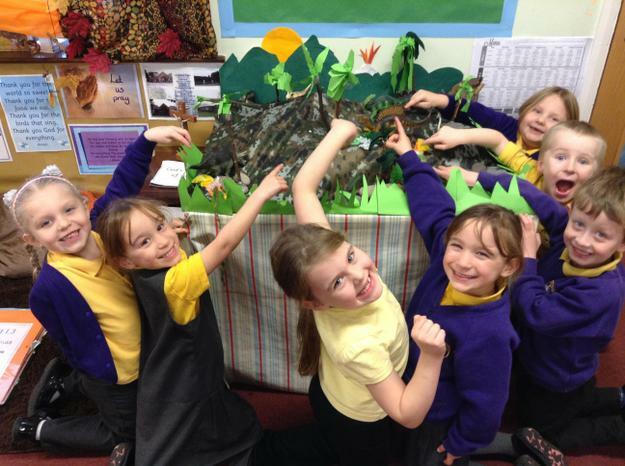 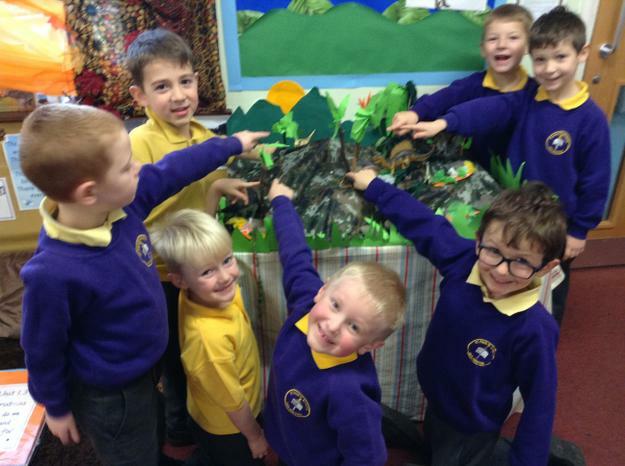 The children worked together to create a dinosaur landscape display. 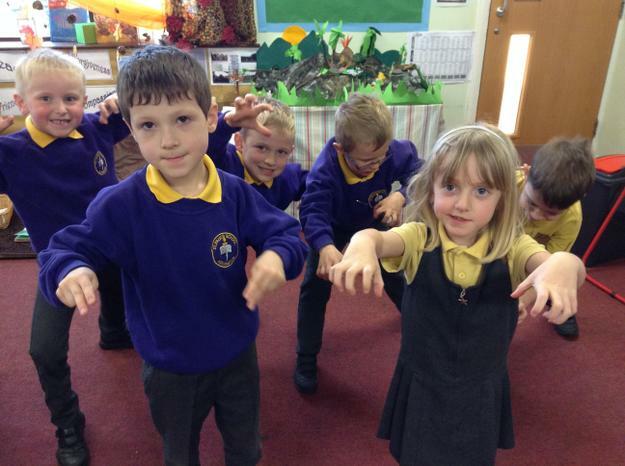 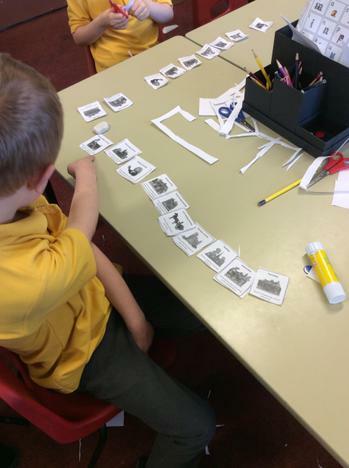 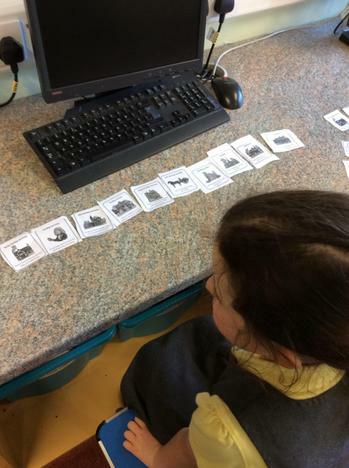 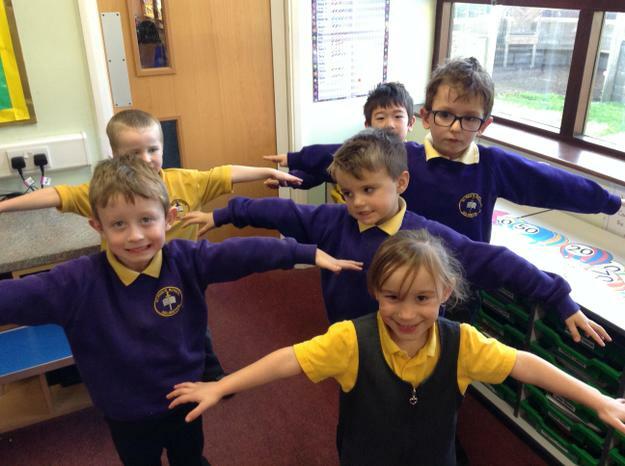 We recreated the movements of different types of dinosaurs. 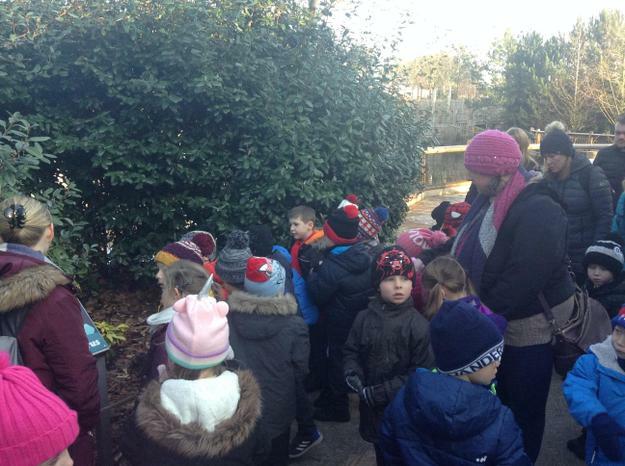 Welcome back after a well earned half term holiday. 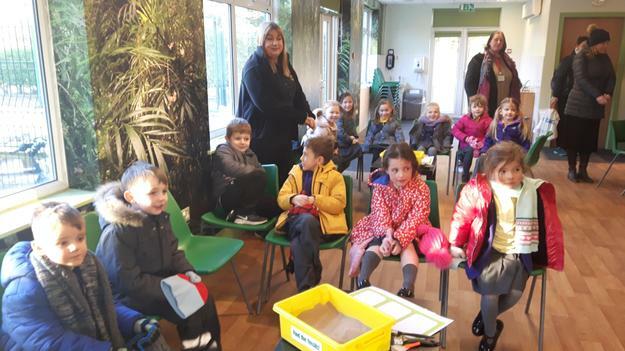 We hope the children have all managed to have a little rest during their week off and the have come back to school with renewed energy and ready for an exciting half term. 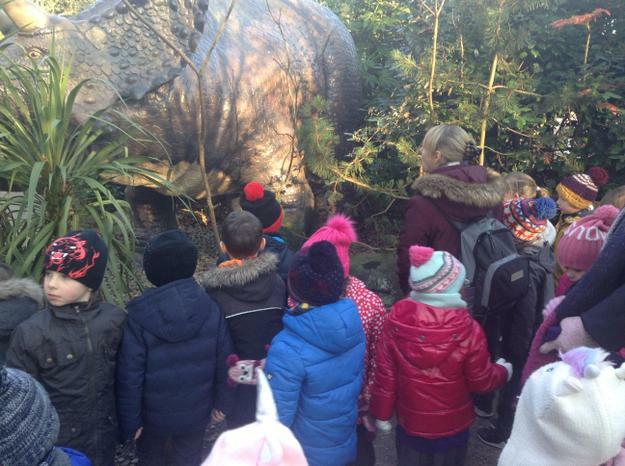 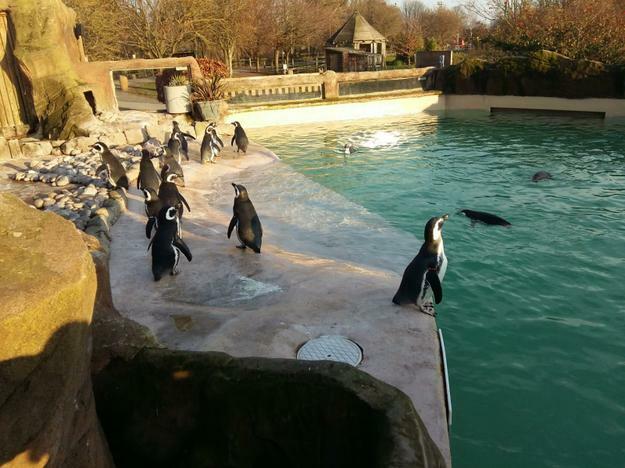 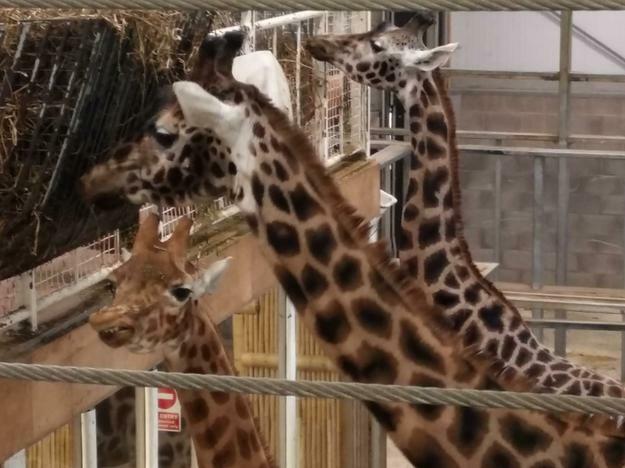 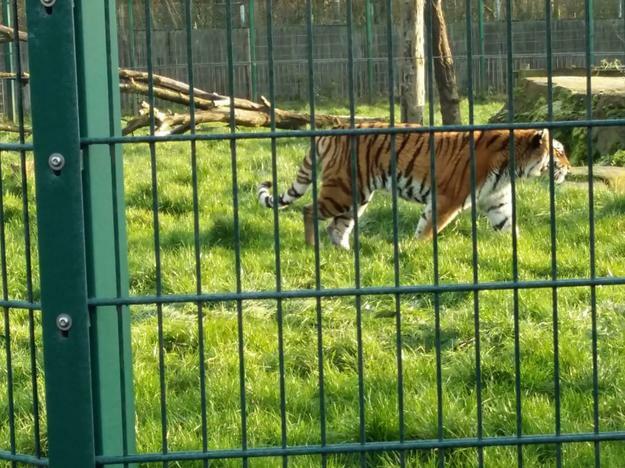 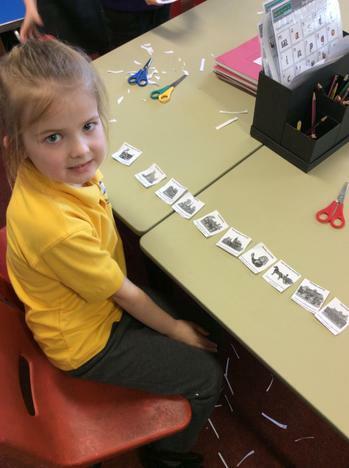 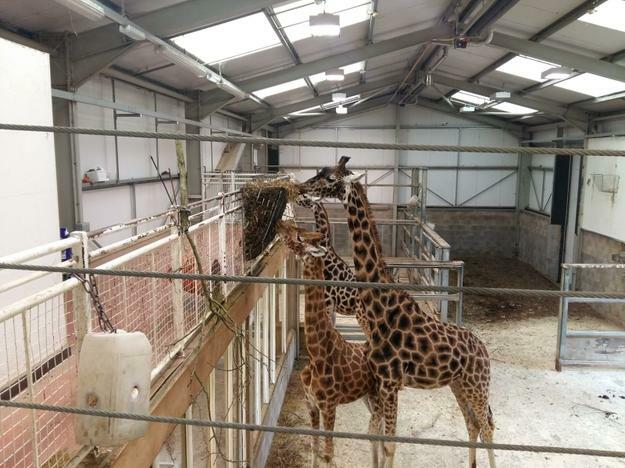 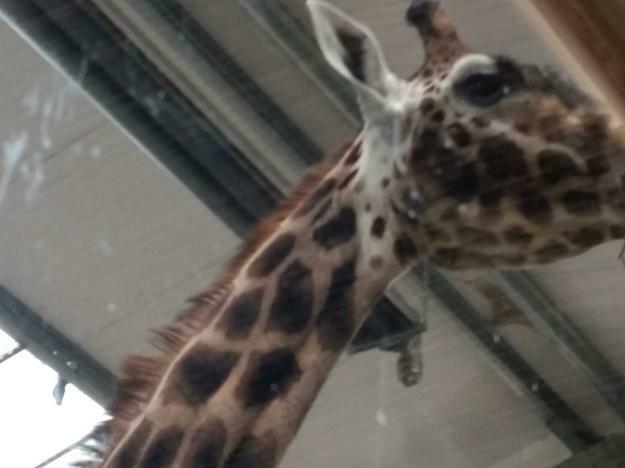 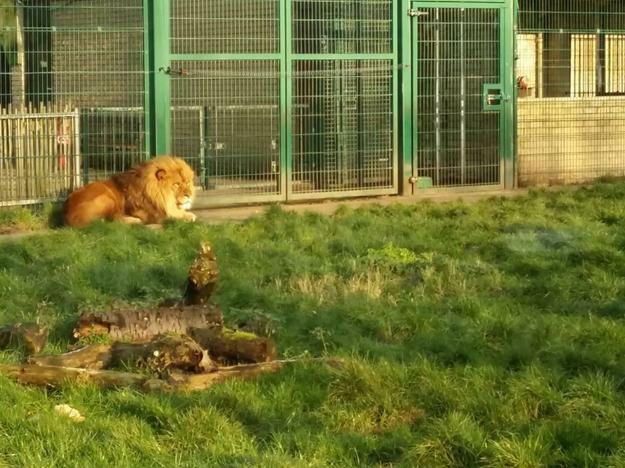 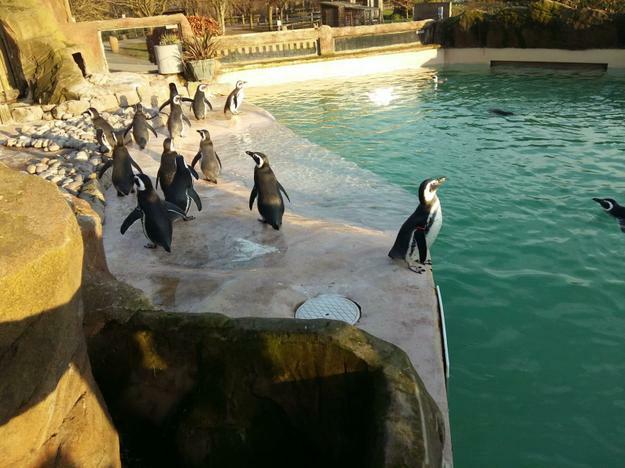 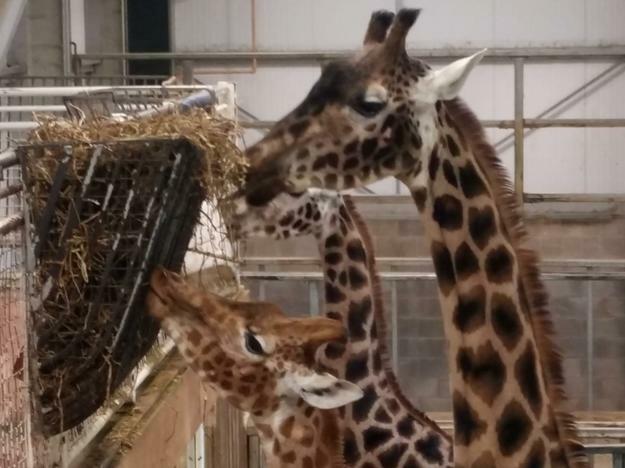 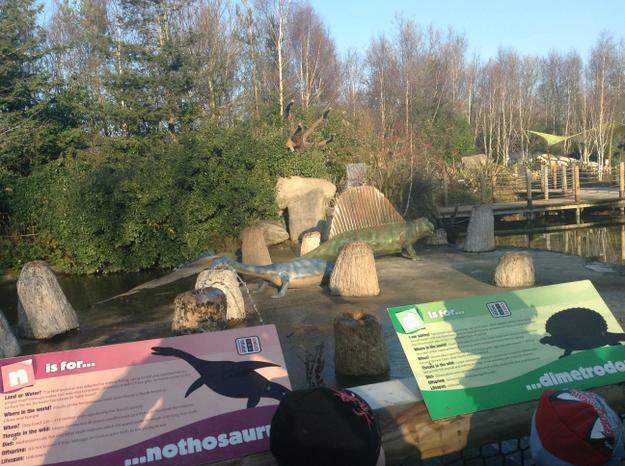 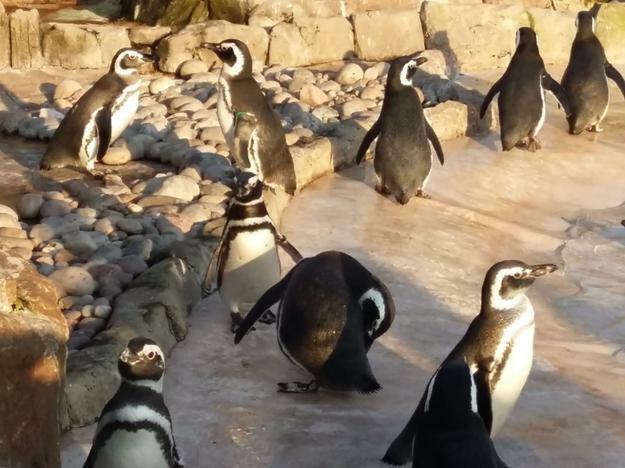 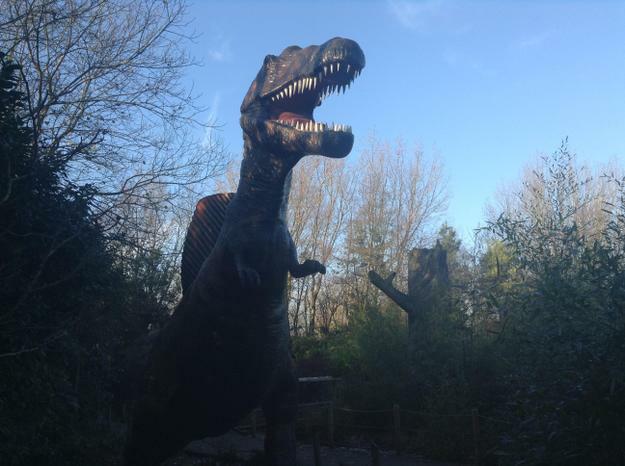 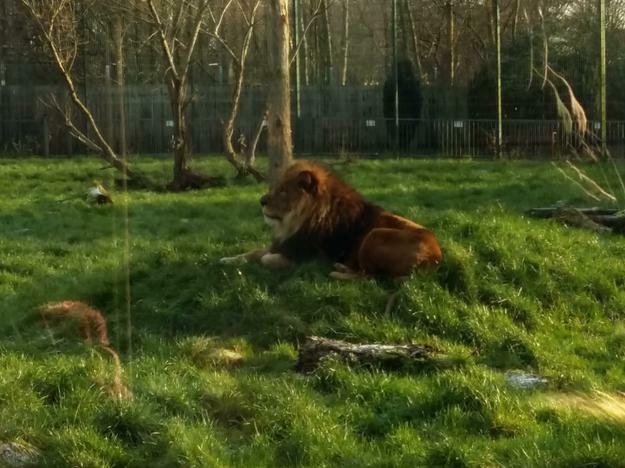 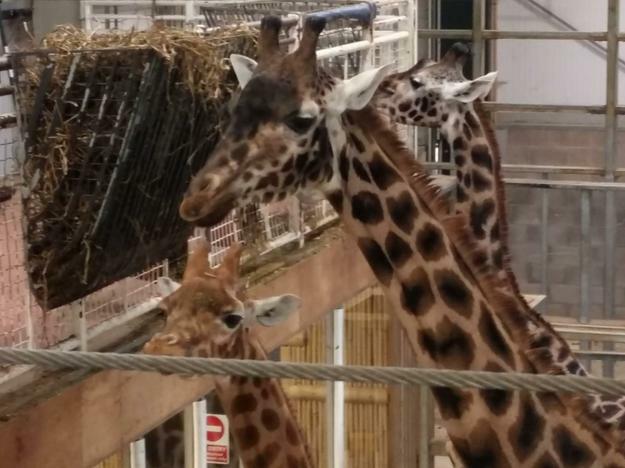 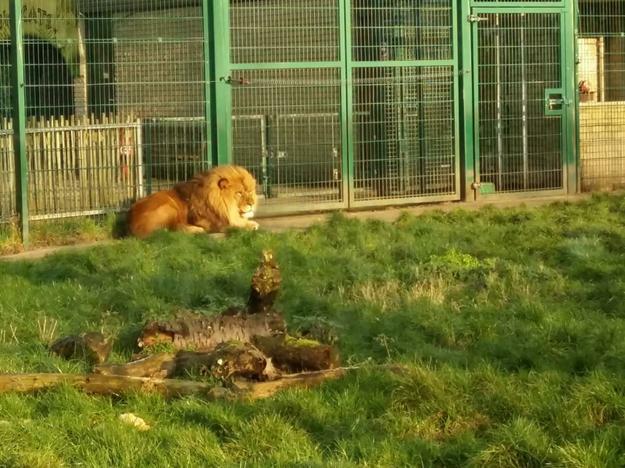 Our topic for our Cornerstones work this half term is Dinosaurs and the wow moment we have planned will be a trip to look round the dinosaur safari at Blackpool Zoo. 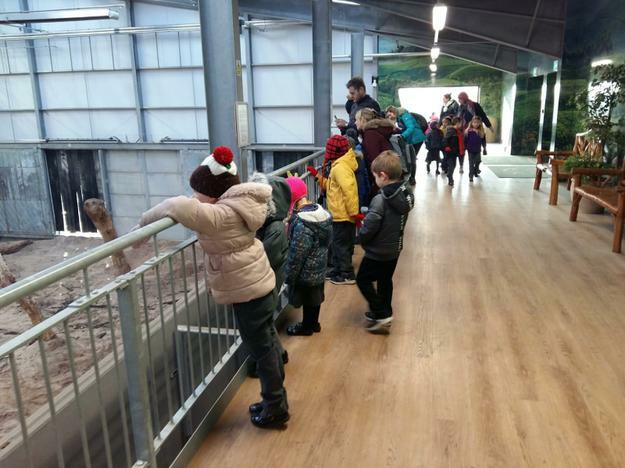 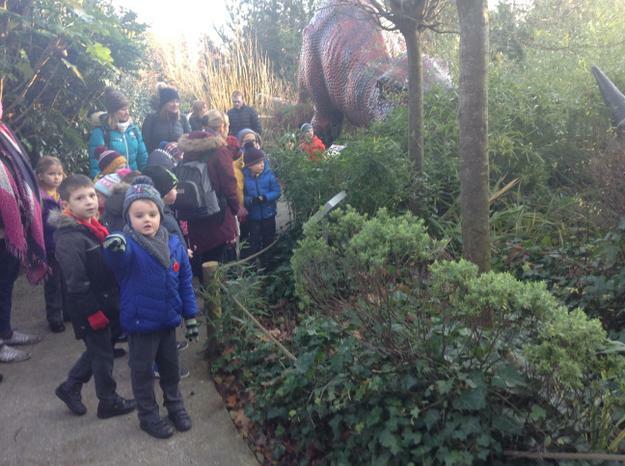 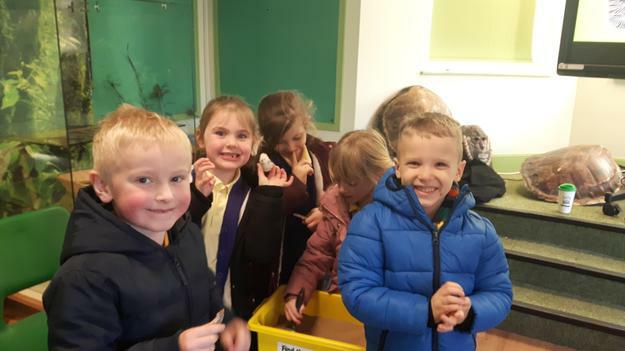 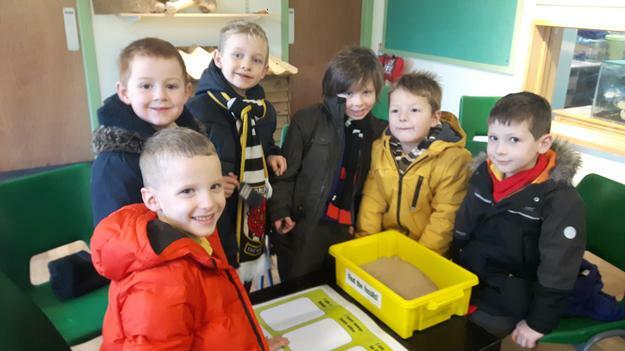 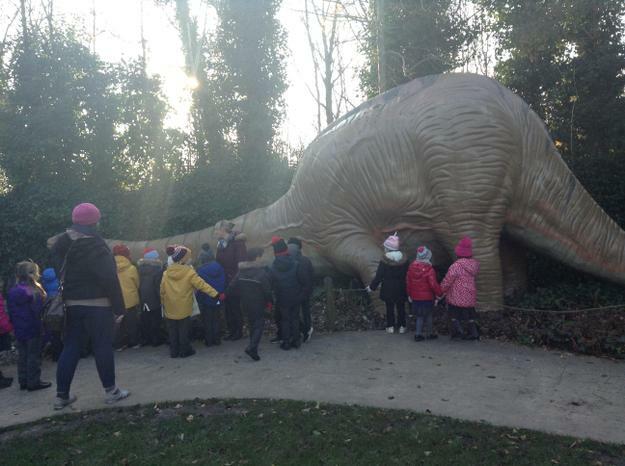 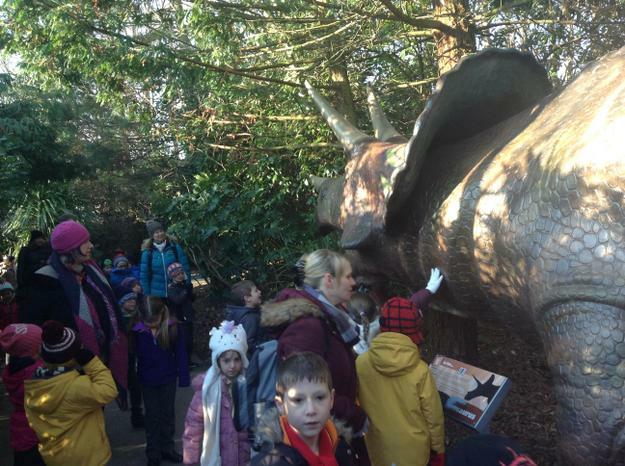 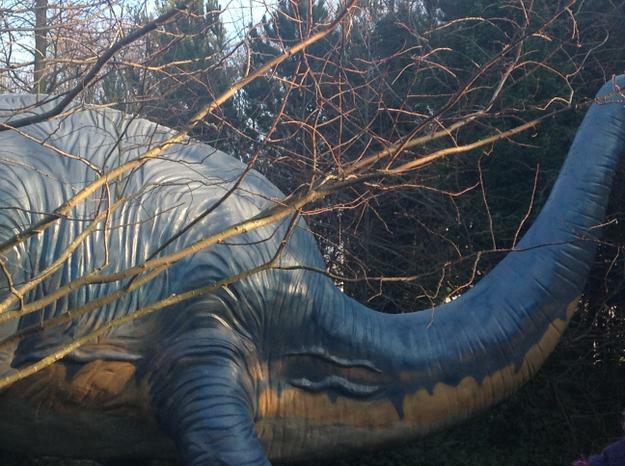 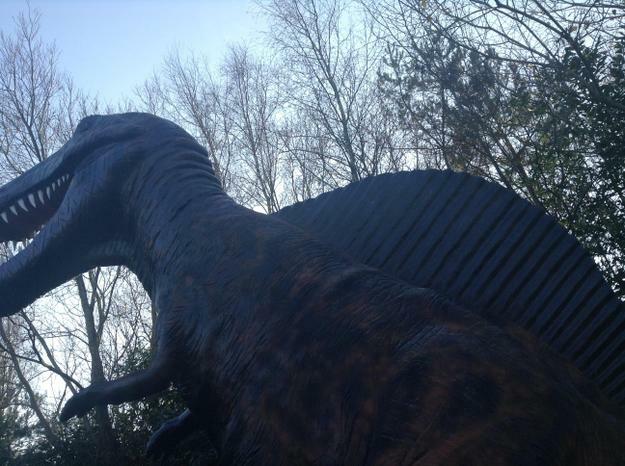 The children will be able to find out lots of interesting facts about dinosaurs as well as using their creative skills to make dinosaur puppets, a dinosaur landscape and dinosaur fossils. 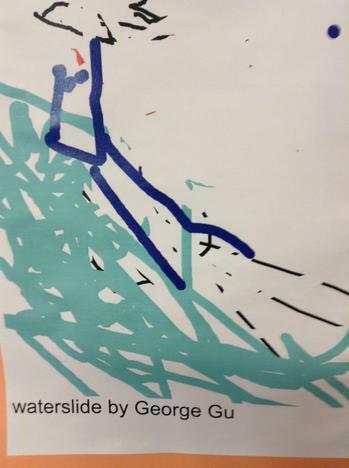 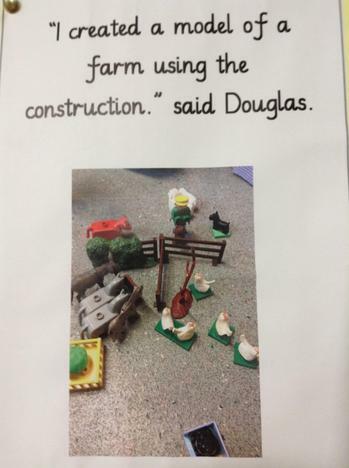 More information is available on the Cornerstones parent information document above. 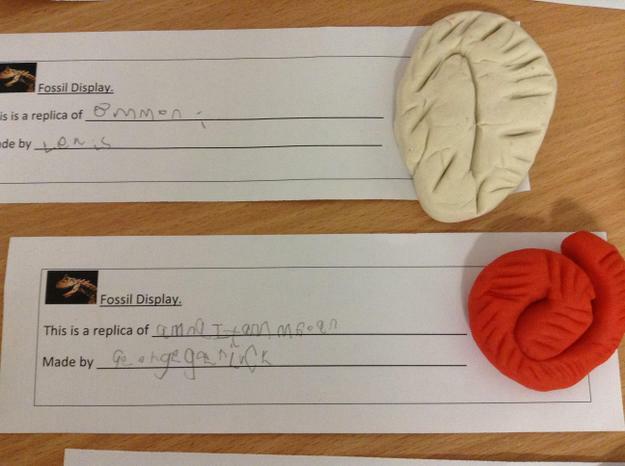 Any pieces of 'Pick and Mix' homework about dinosaurs that the children manage to complete will be celebrated and put on display in our dinosaur themed homework gallery. 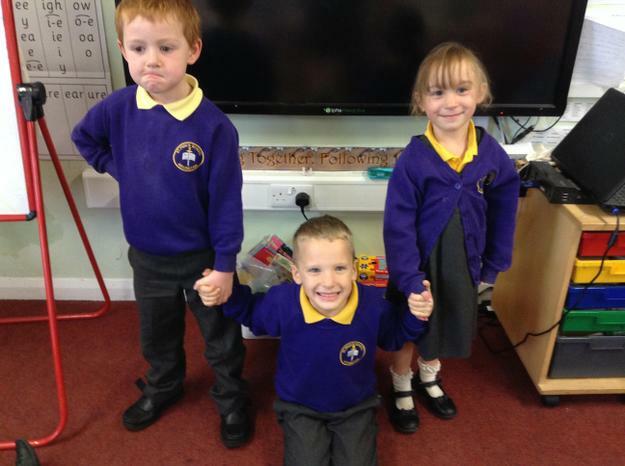 If you have any worries or queries at any time please don't hesitate to speak to a member of our Year 1 team. 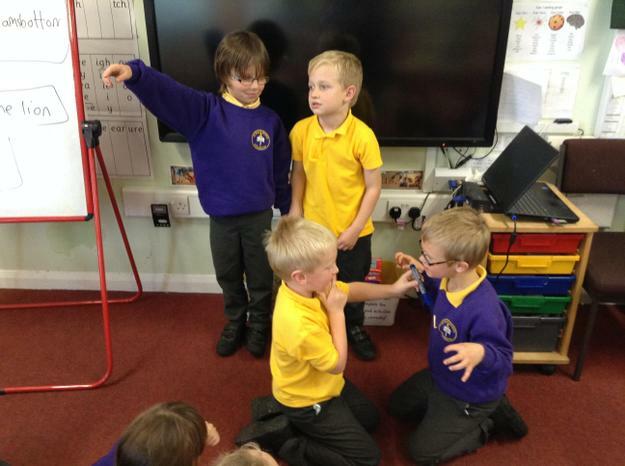 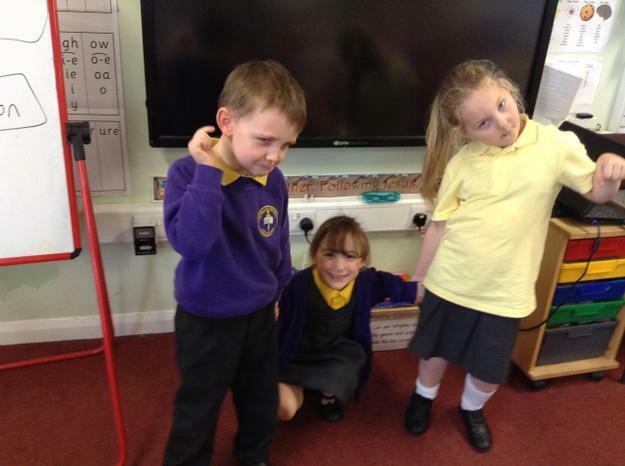 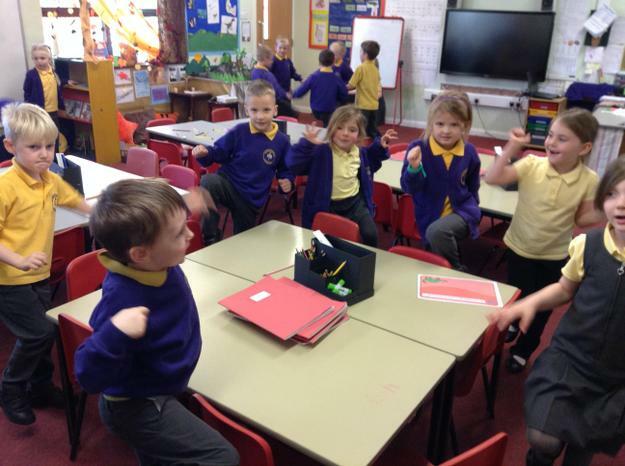 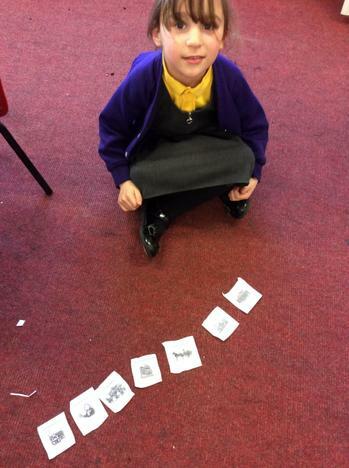 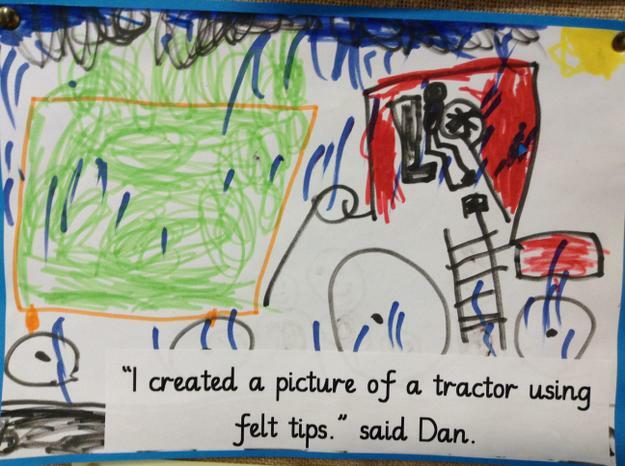 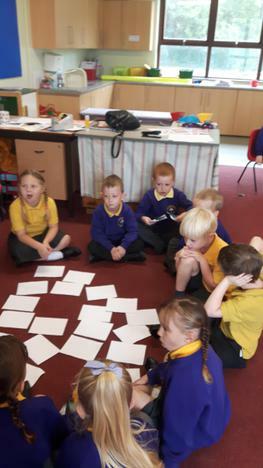 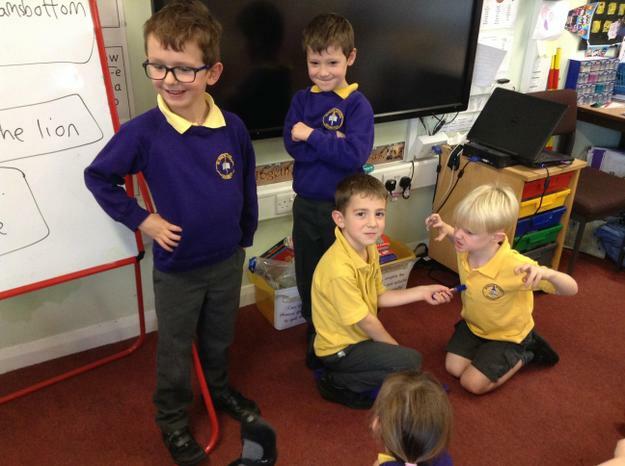 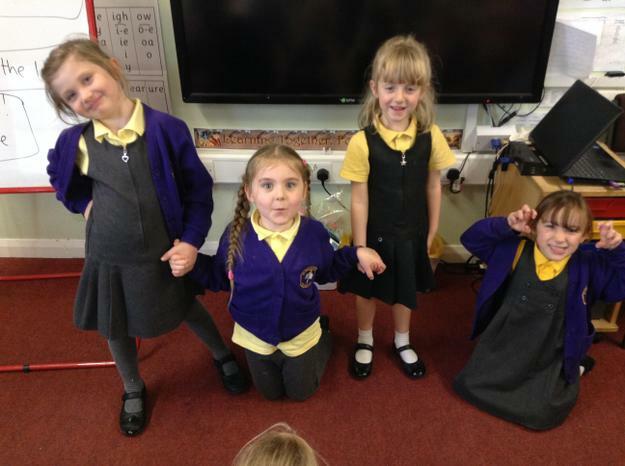 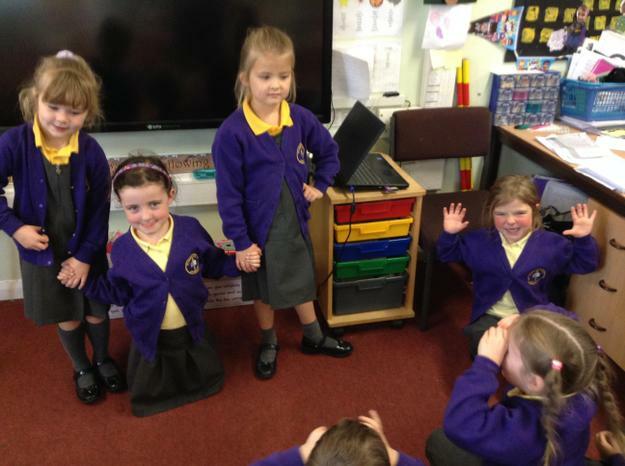 The children created freeze frames to retell the poem they had been learning about heroes. 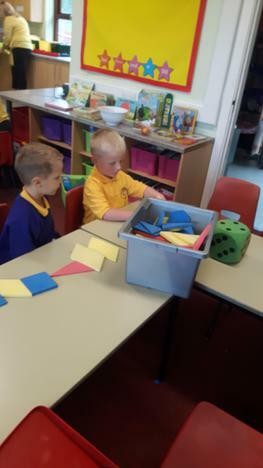 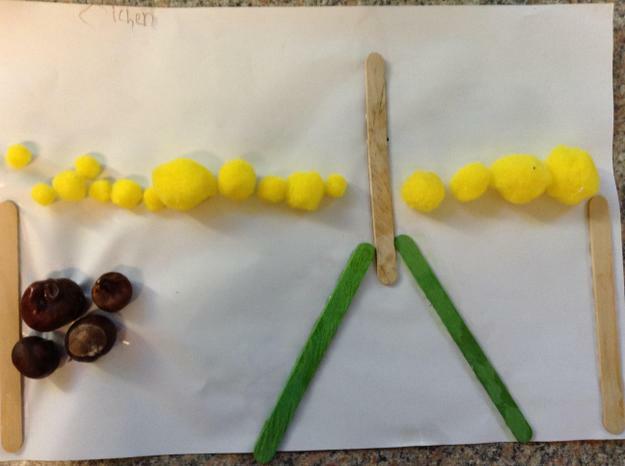 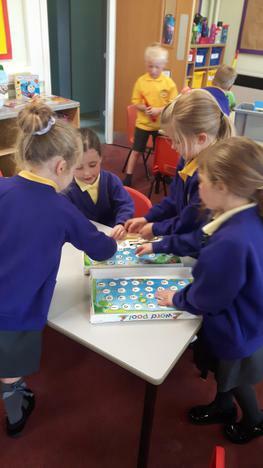 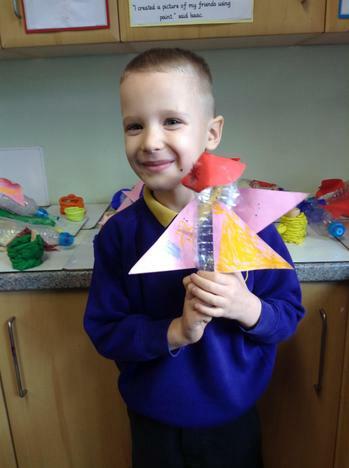 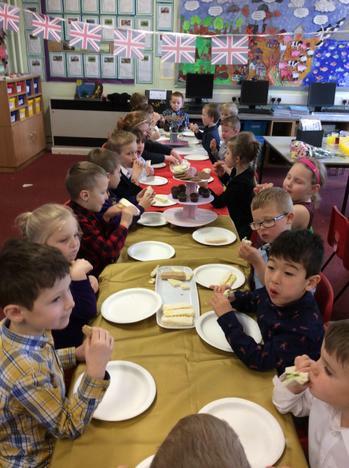 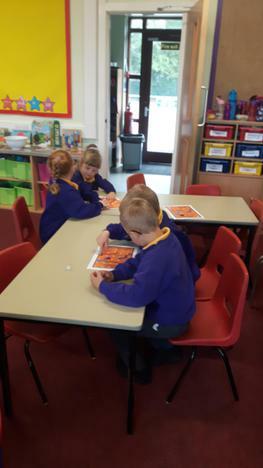 The children enjoyed having the freedom to create something with the range of equipment and resources available to show that God created us all to be creative as an introduction to our RE unit on Creation. 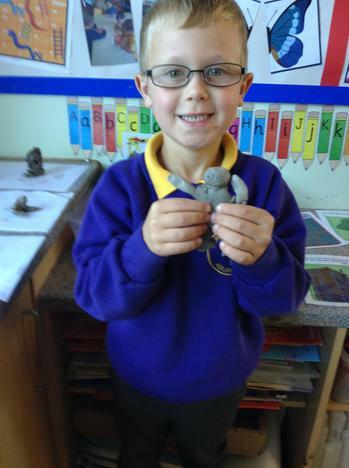 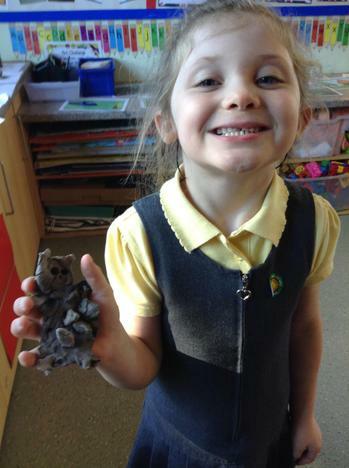 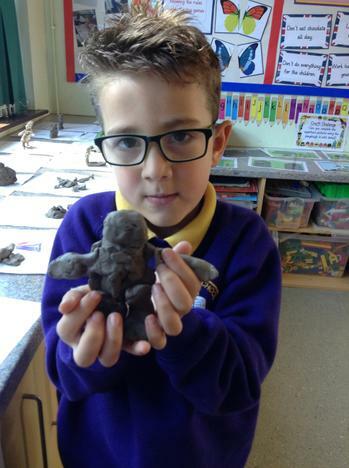 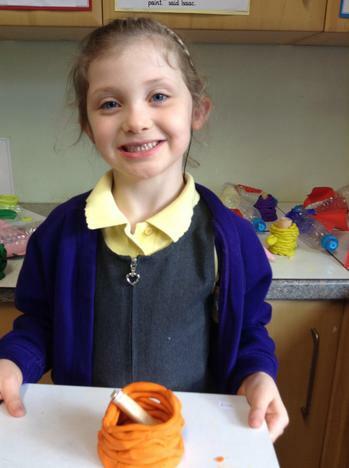 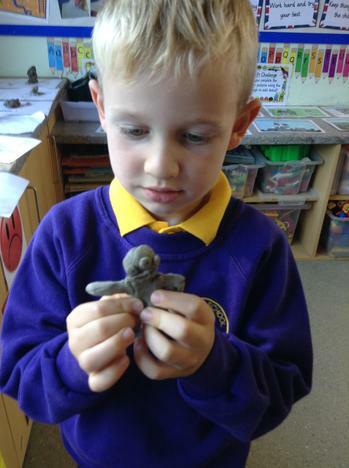 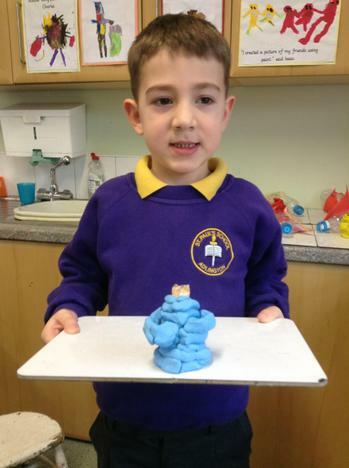 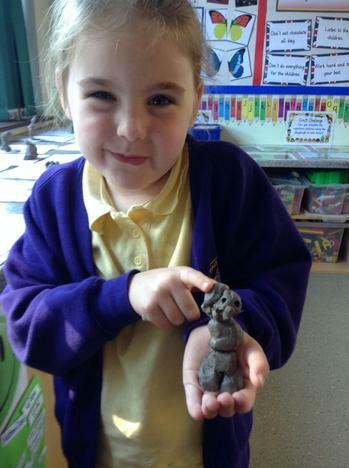 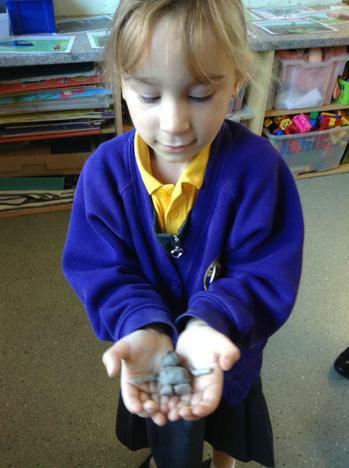 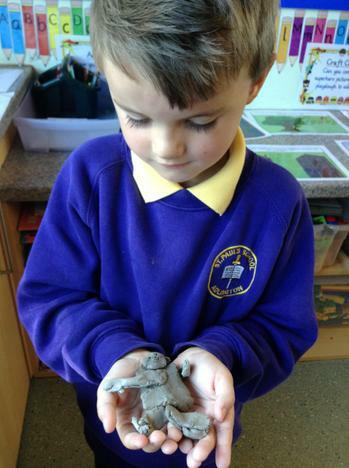 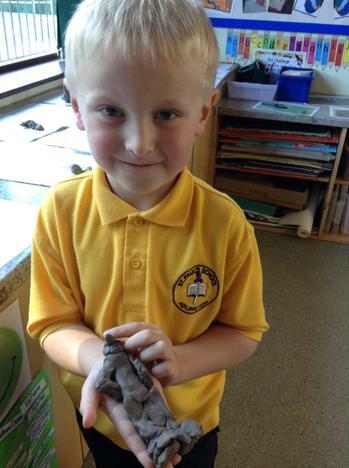 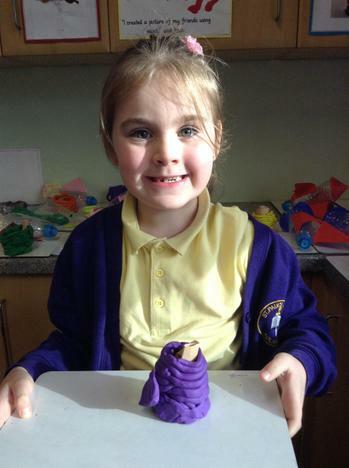 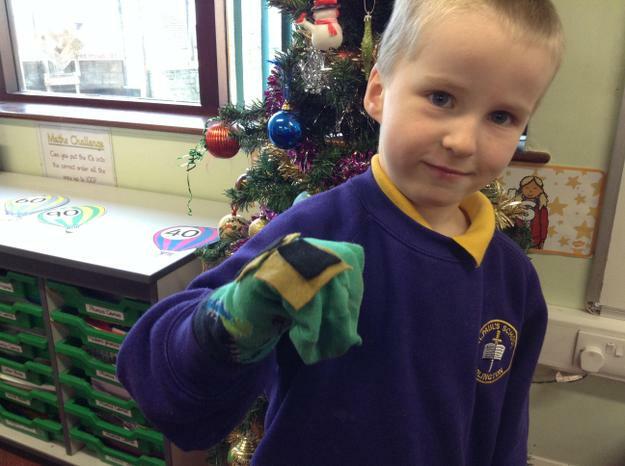 The children have had fun creating their own superhero models using air hardening clay. 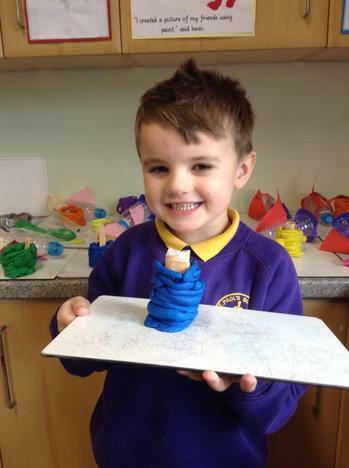 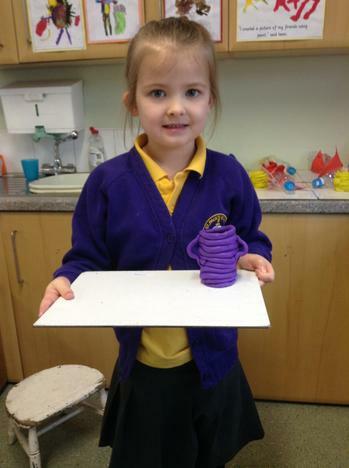 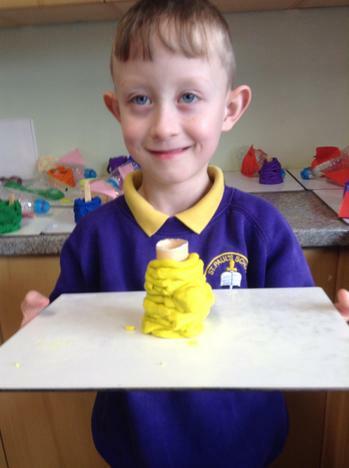 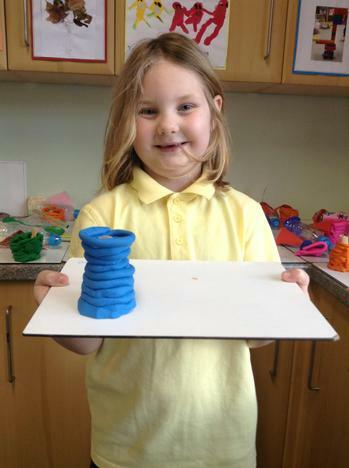 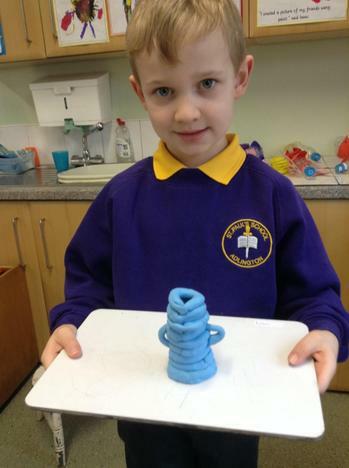 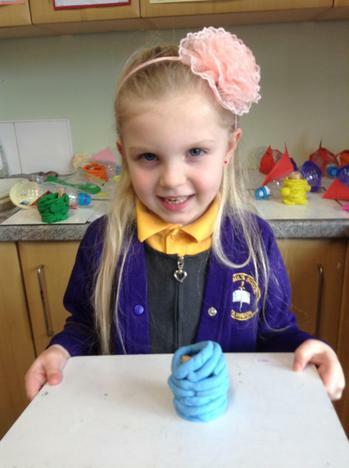 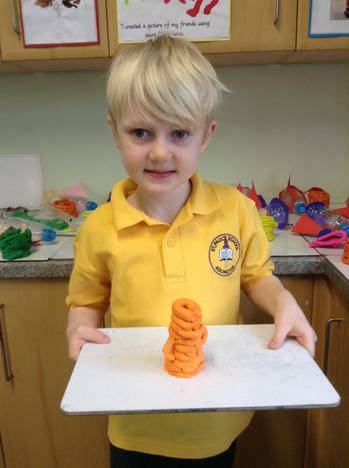 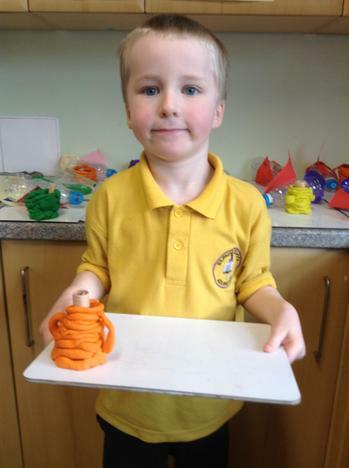 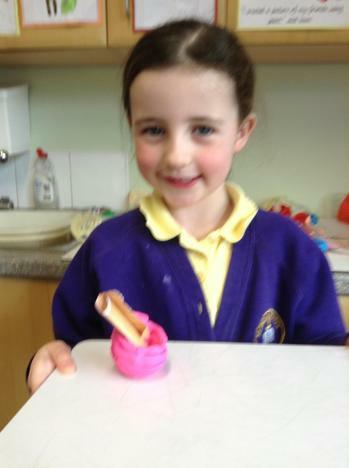 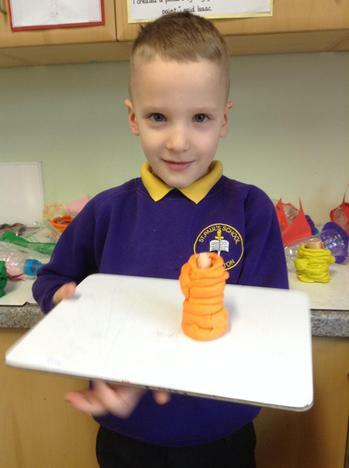 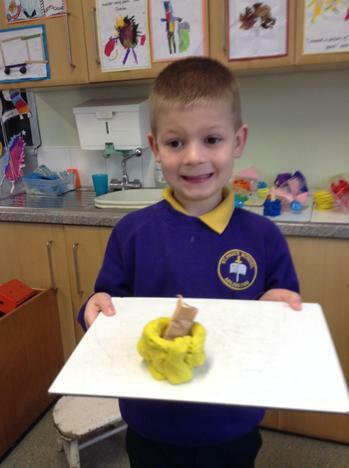 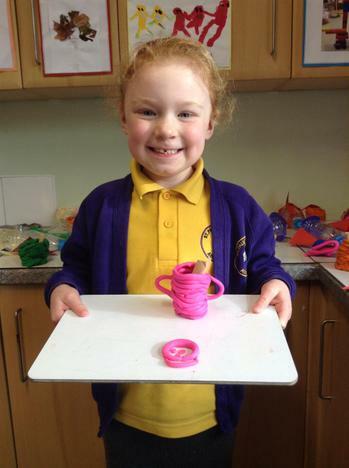 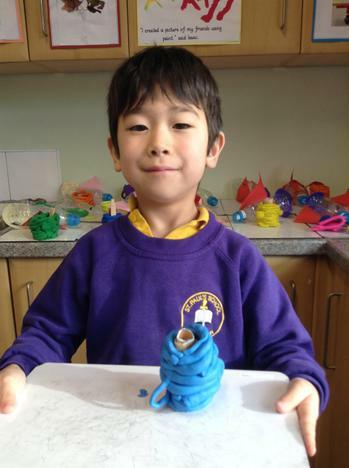 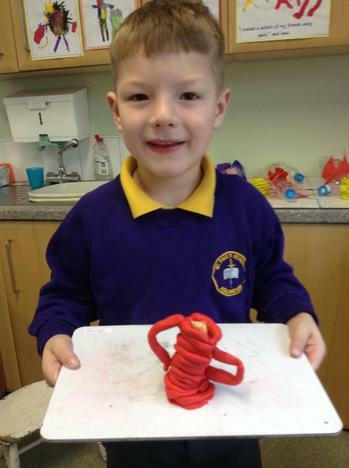 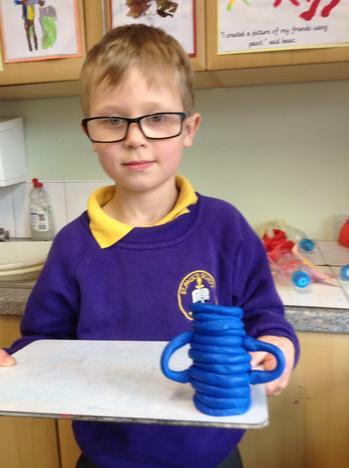 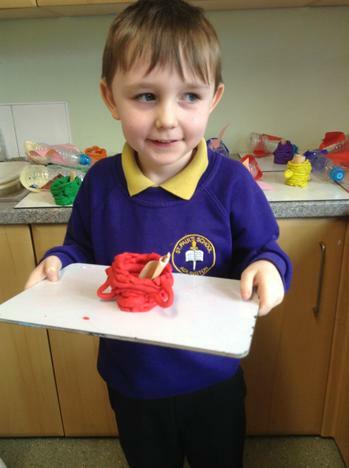 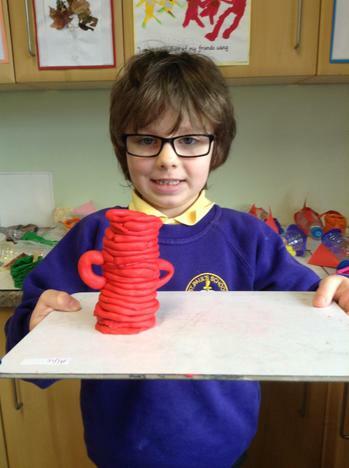 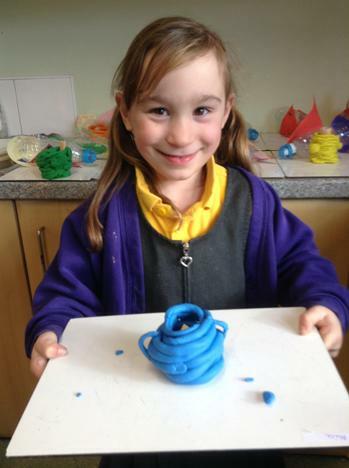 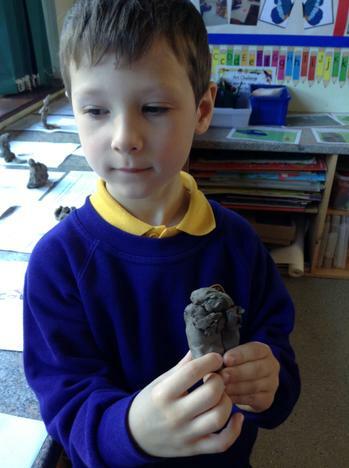 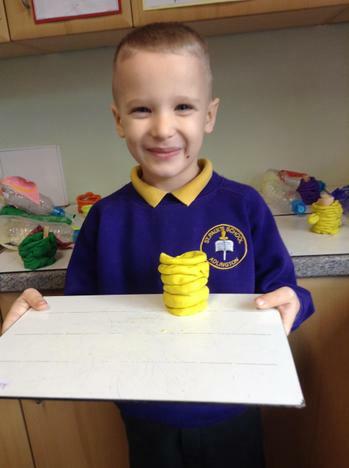 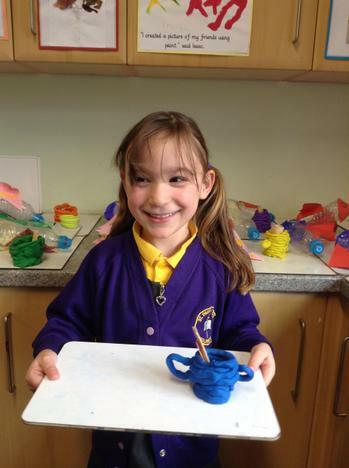 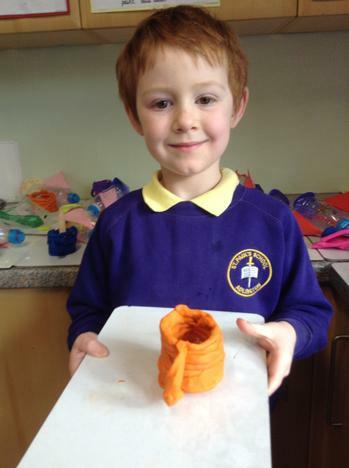 First they drew their superhero on a design sheet, then they used the clay to create a 3D model of their design. 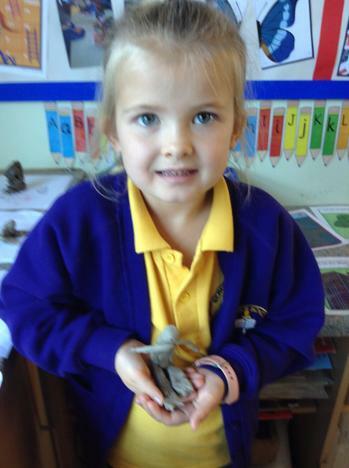 They used the clay tools effectively to add some detail to their models. 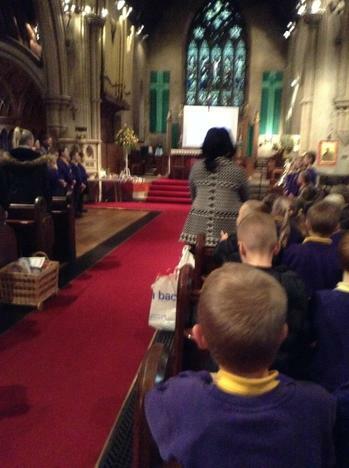 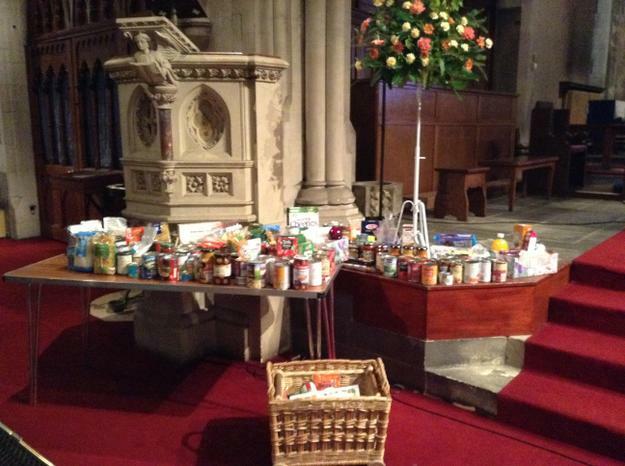 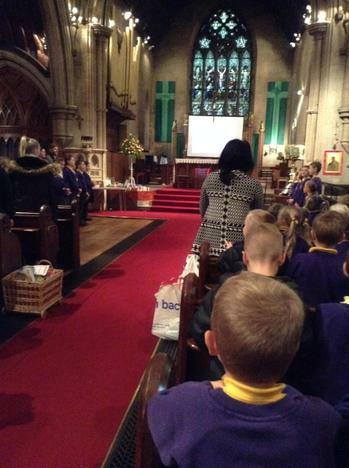 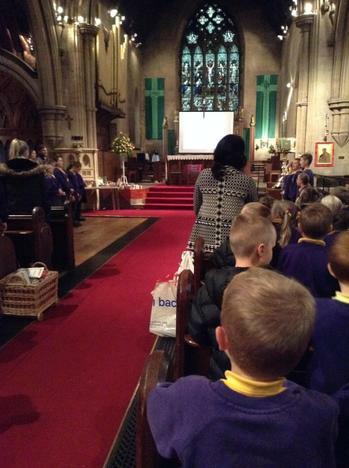 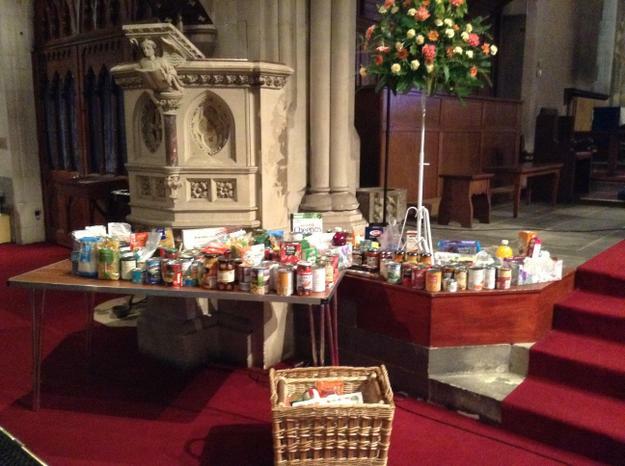 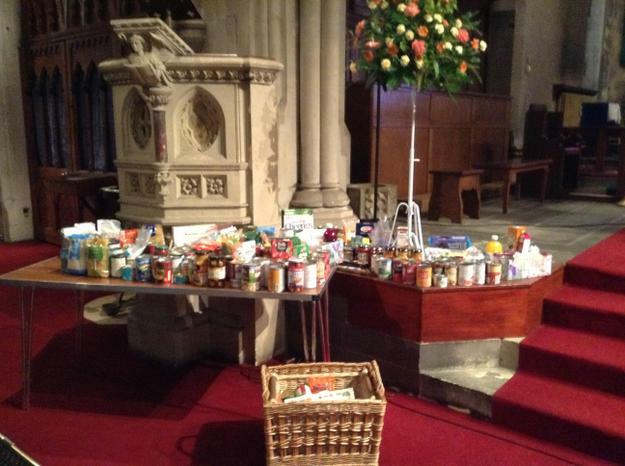 We attended the Harvest Festival Service in Church which finished off our unit in our Religious Education lessons. 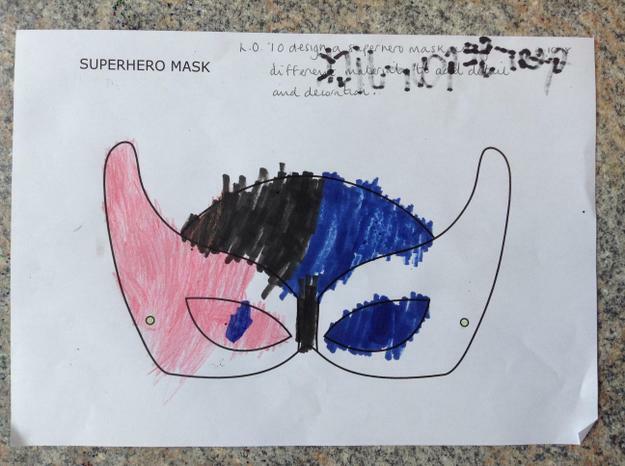 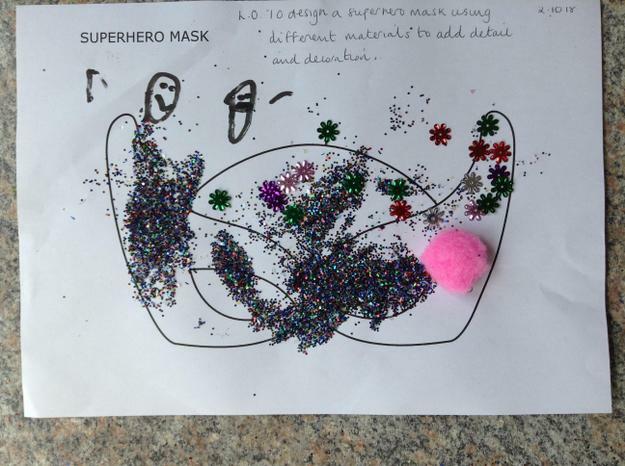 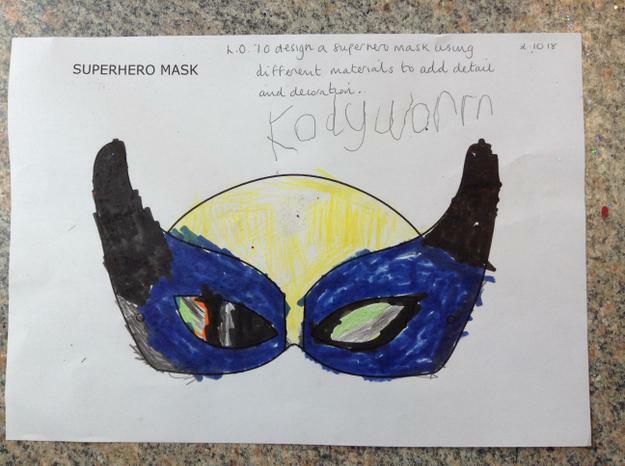 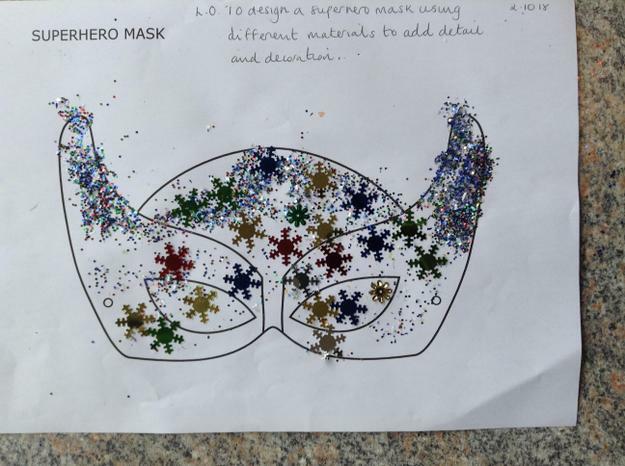 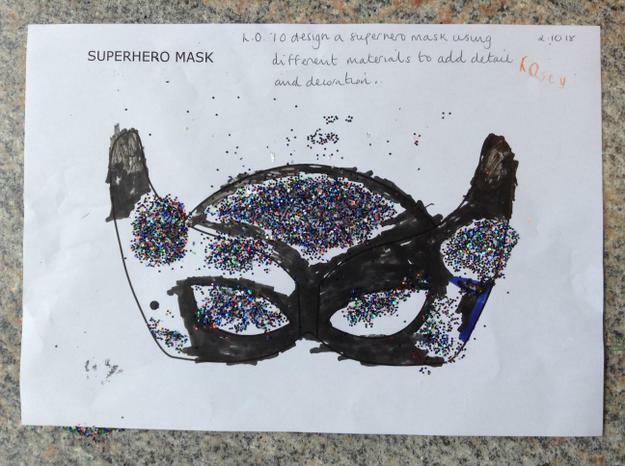 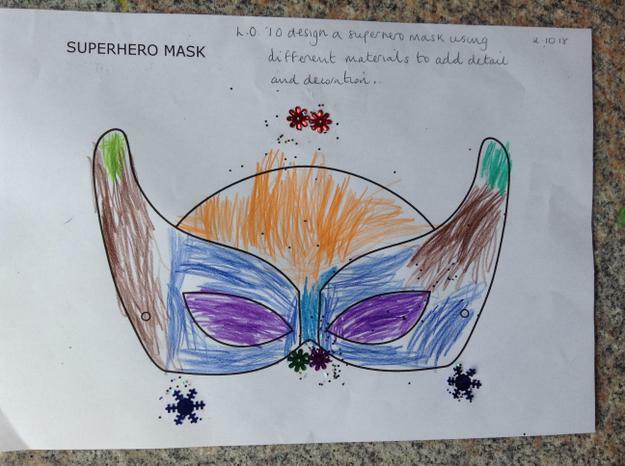 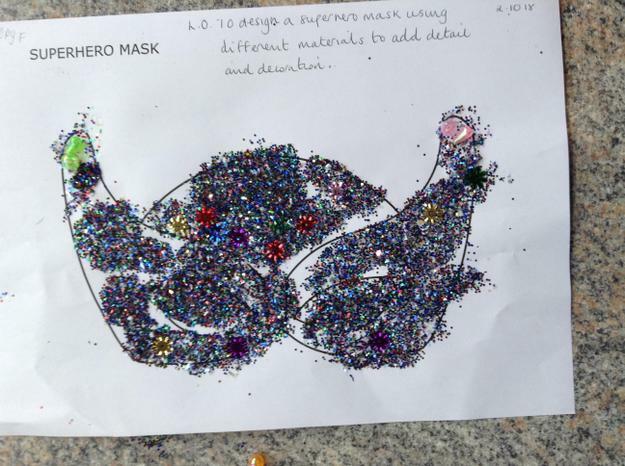 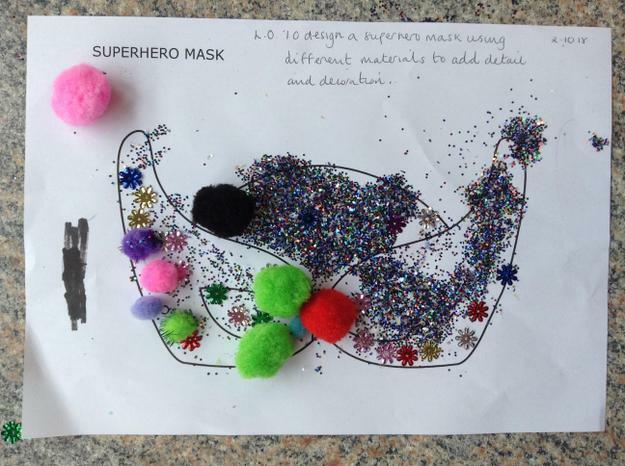 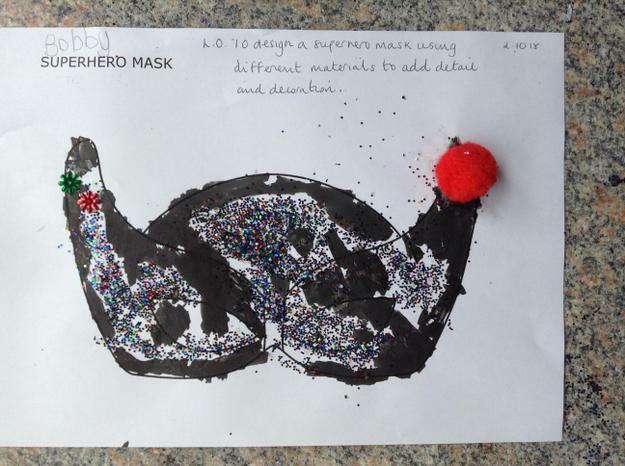 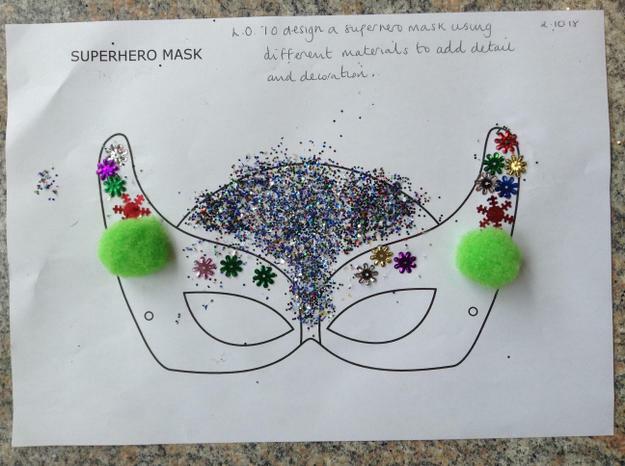 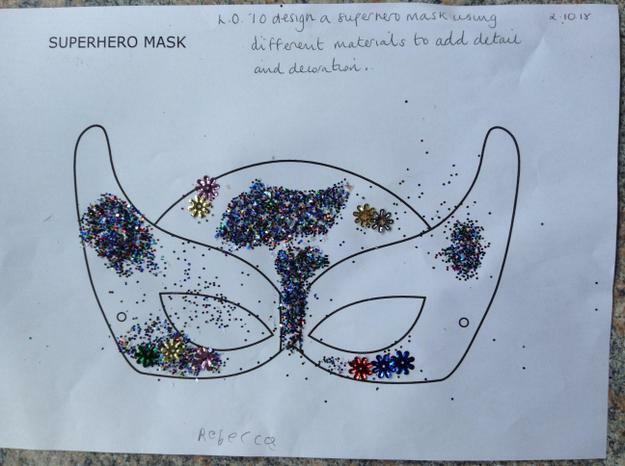 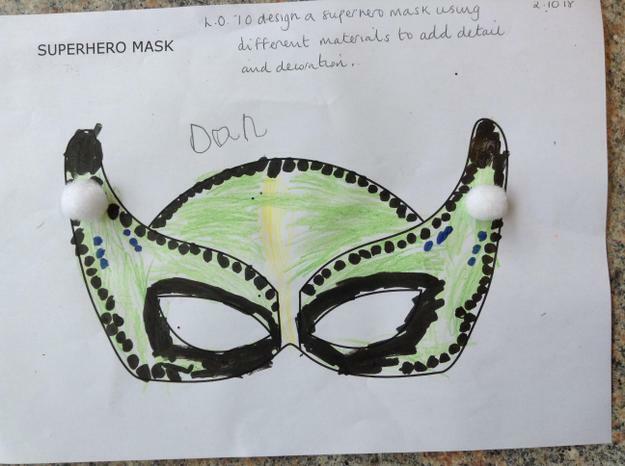 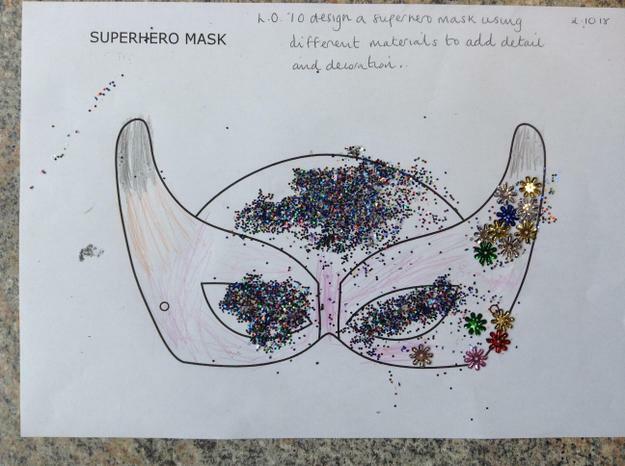 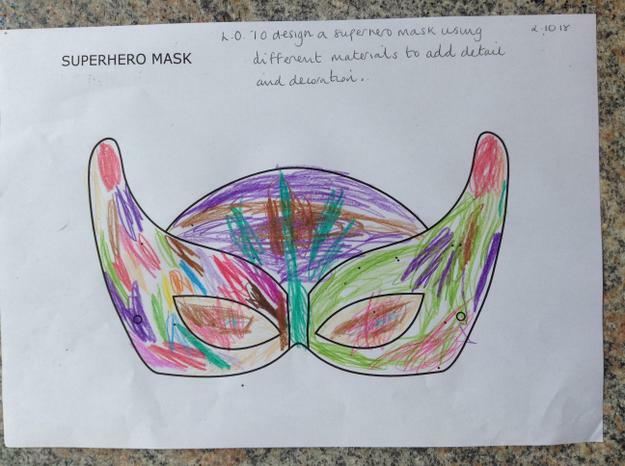 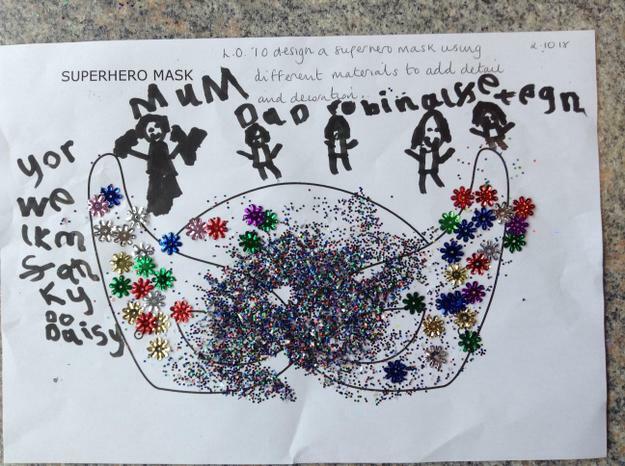 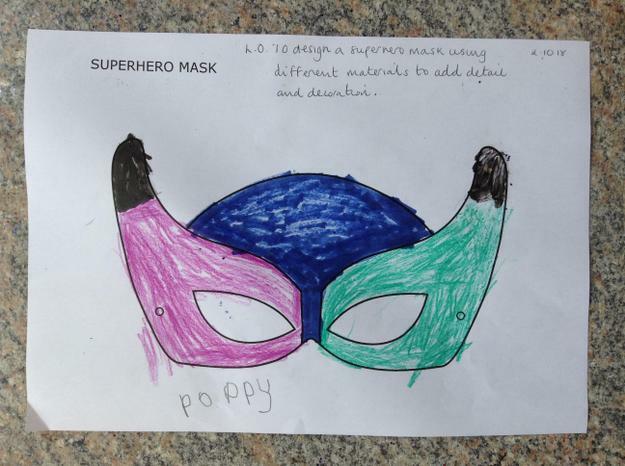 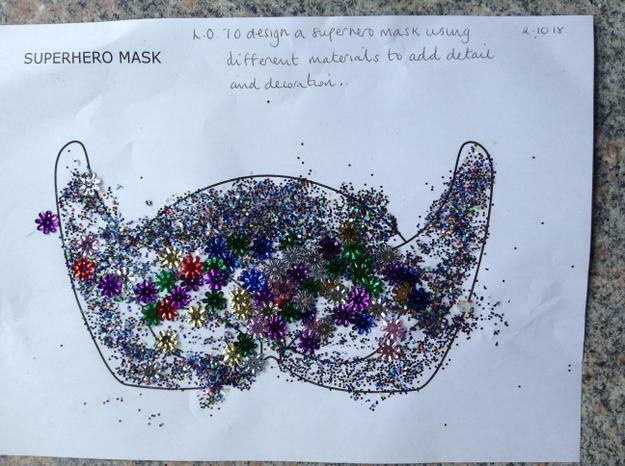 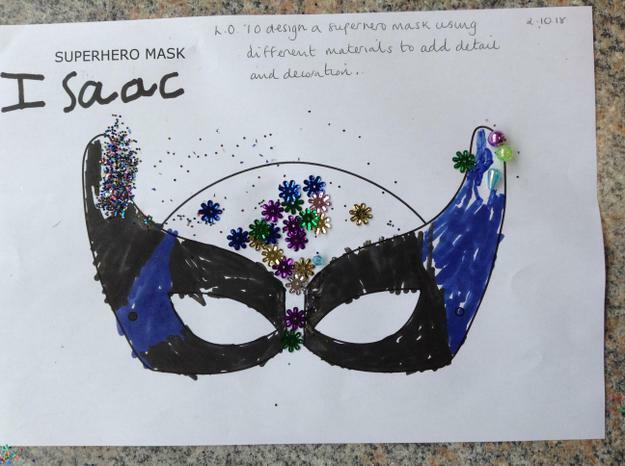 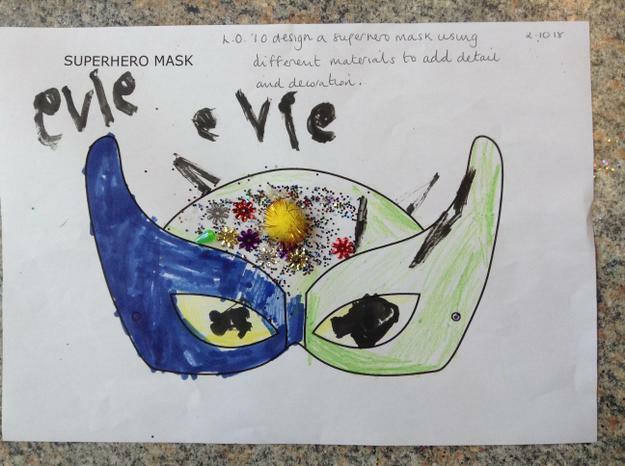 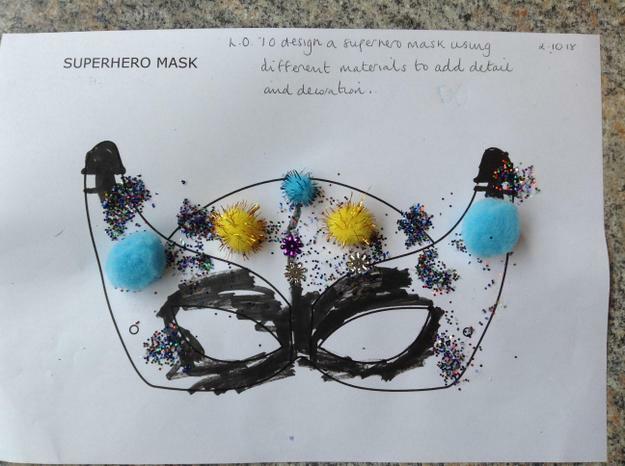 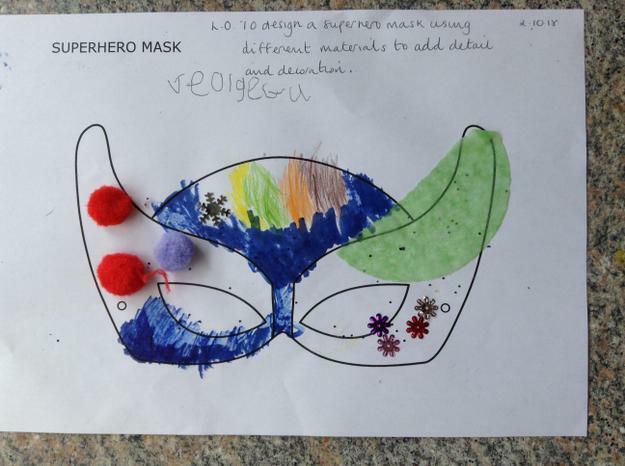 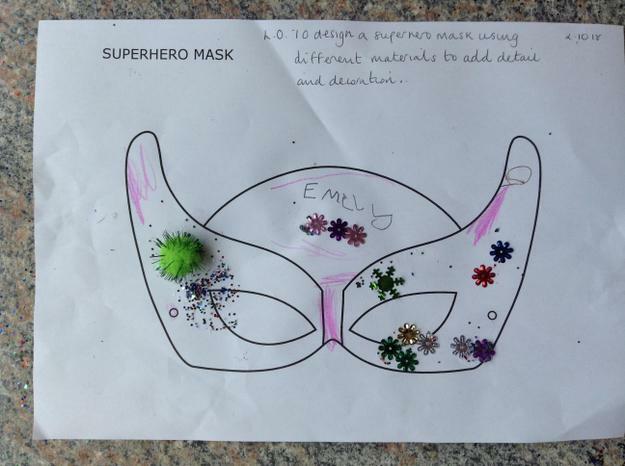 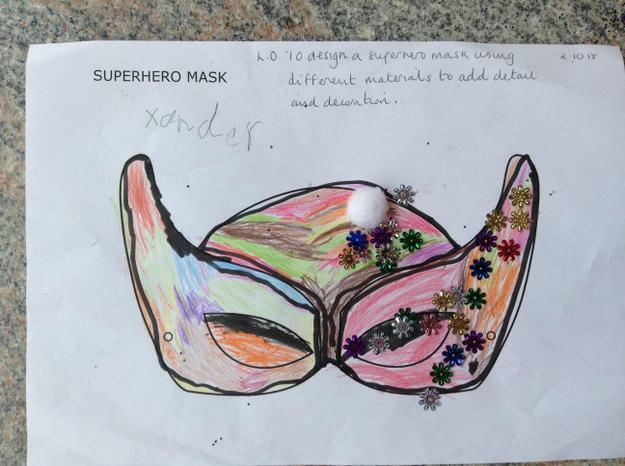 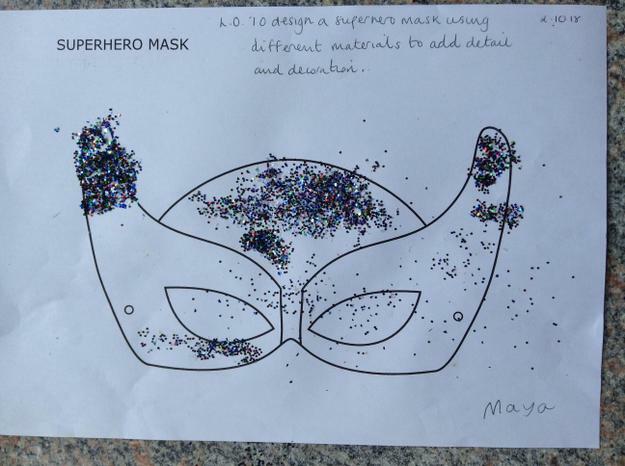 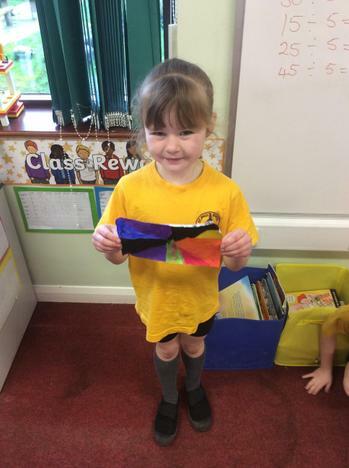 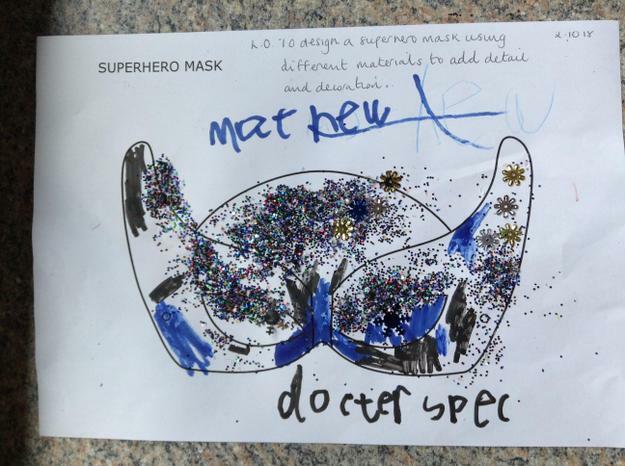 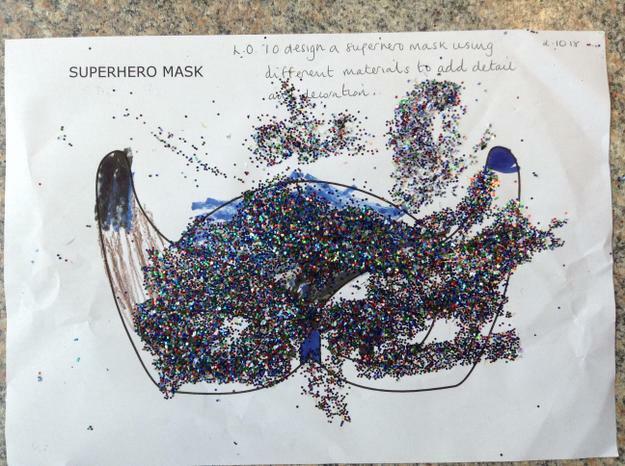 The children worked independently to design their own superhero mask using a range of resources. 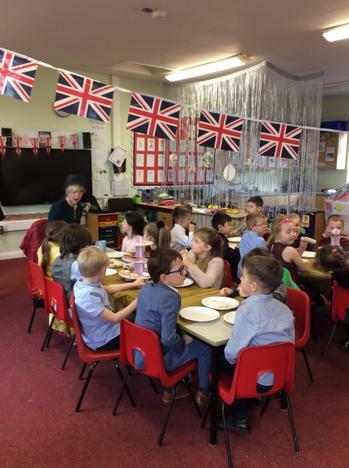 Year 1. 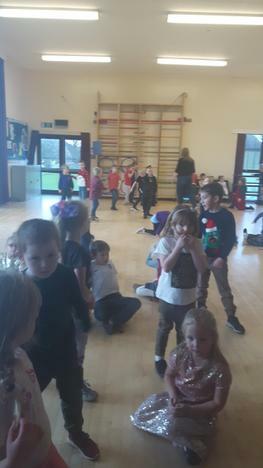 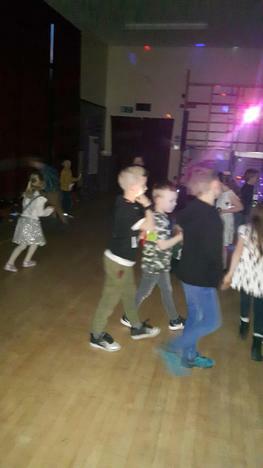 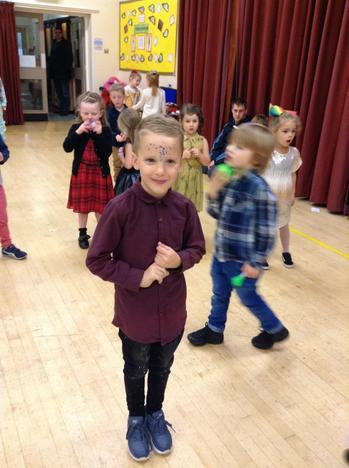 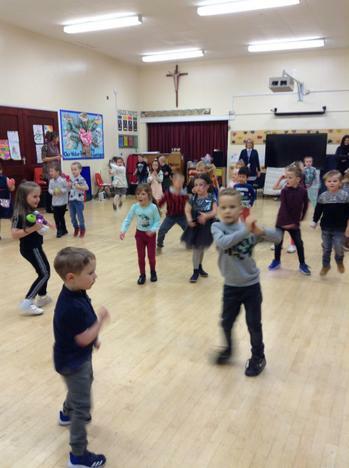 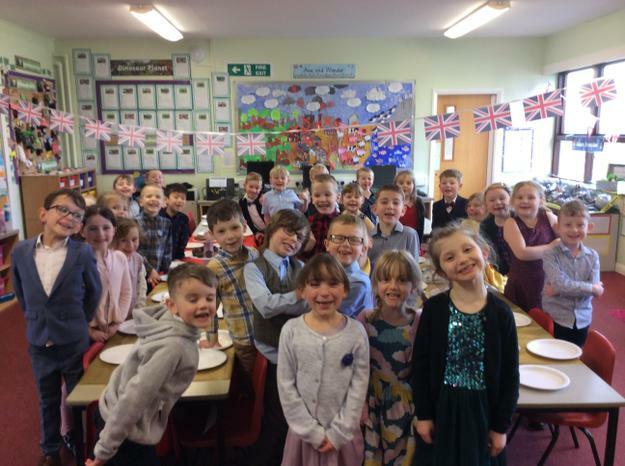 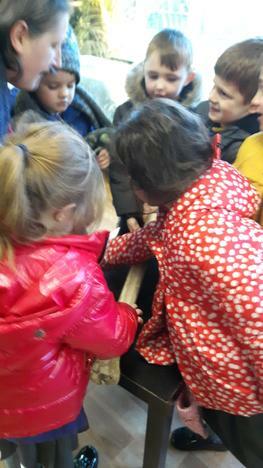 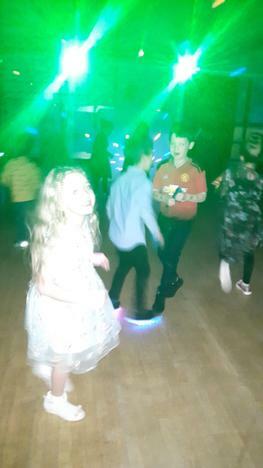 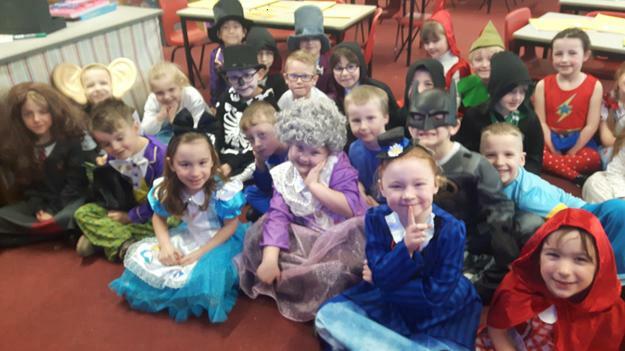 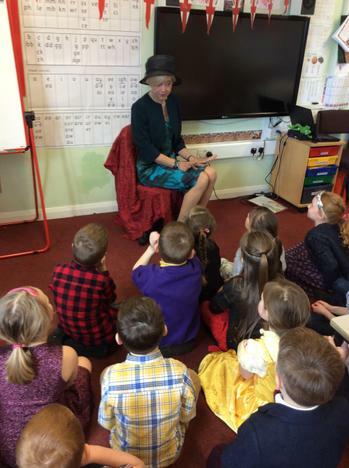 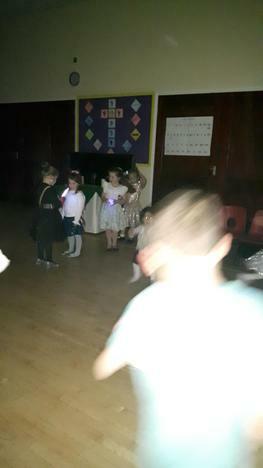 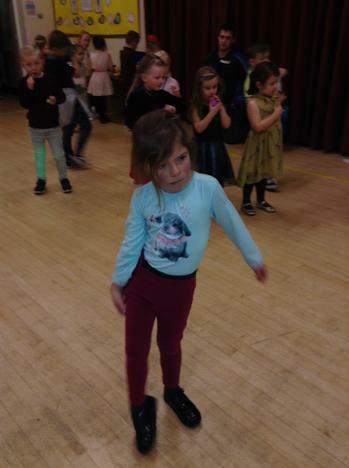 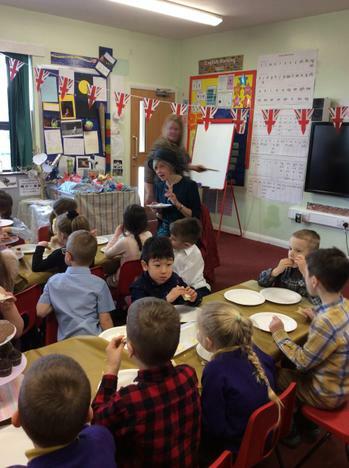 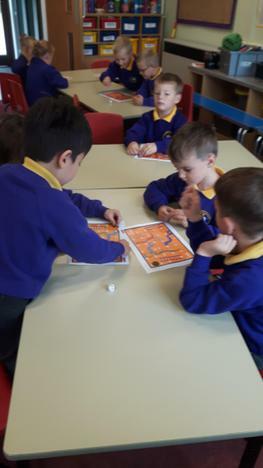 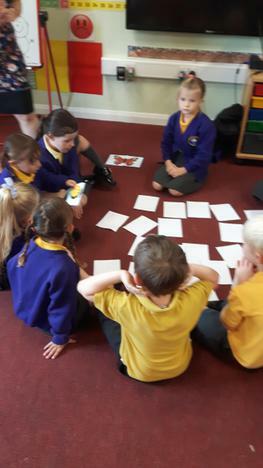 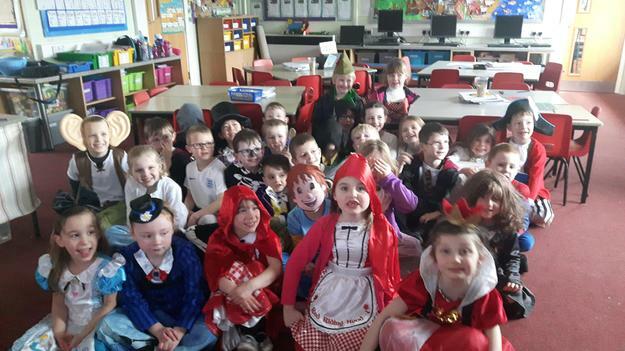 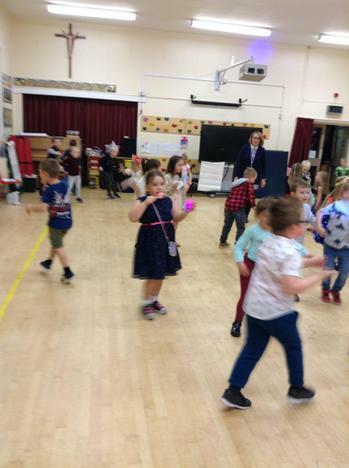 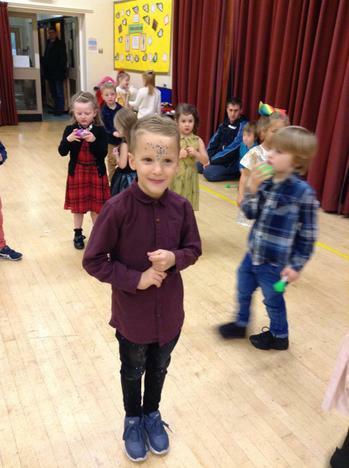 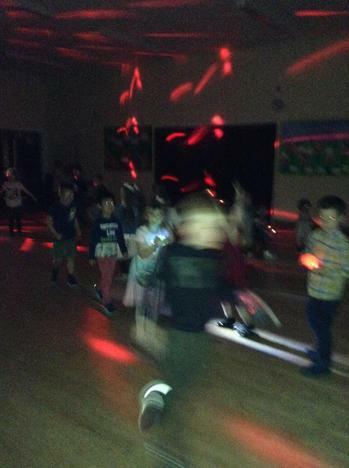 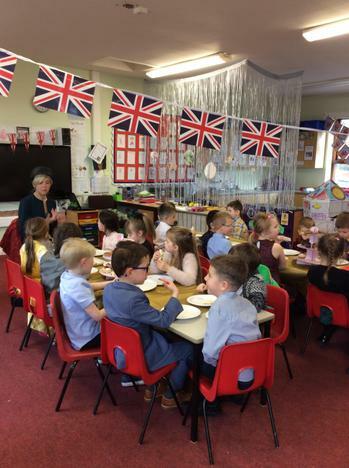 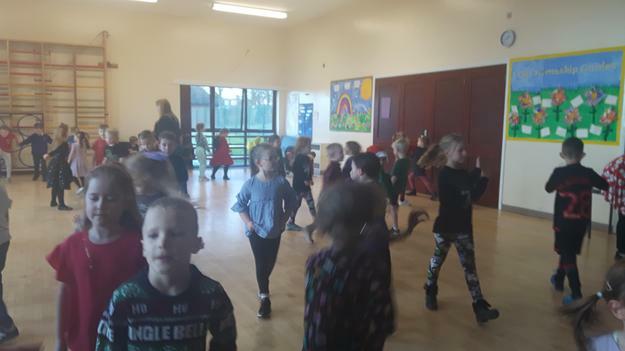 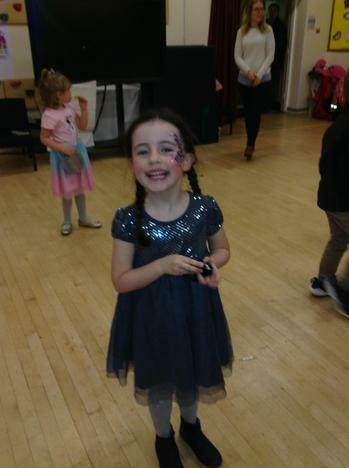 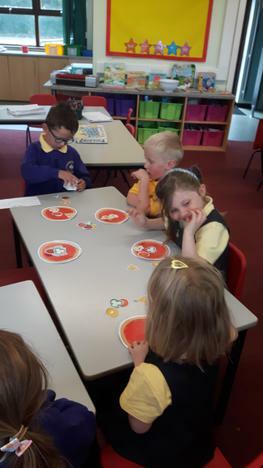 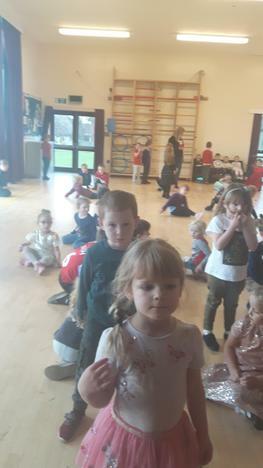 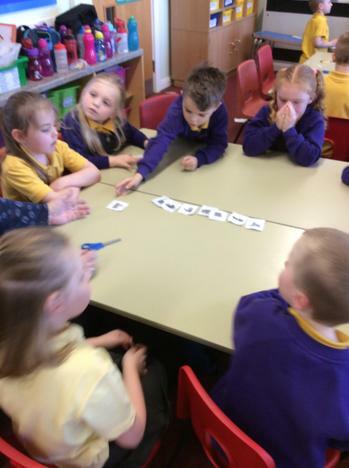 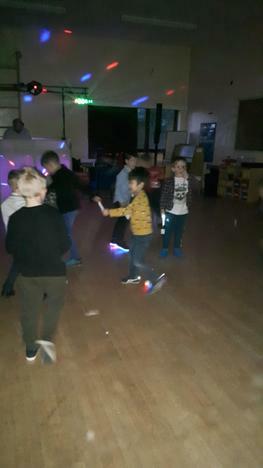 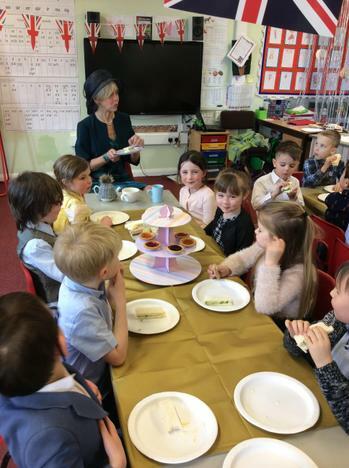 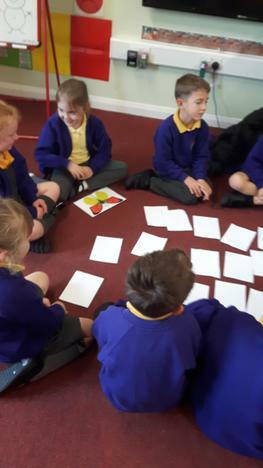 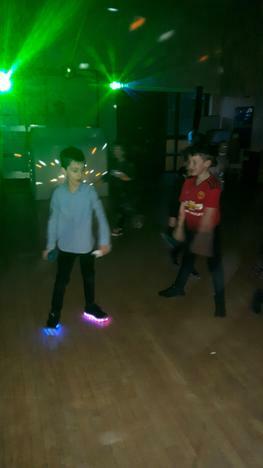 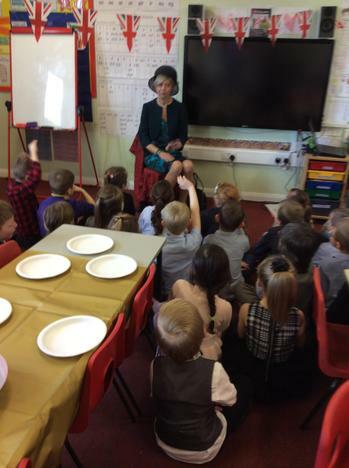 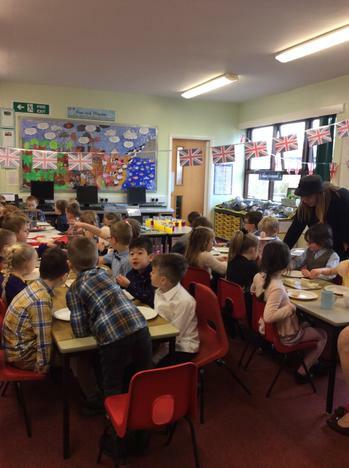 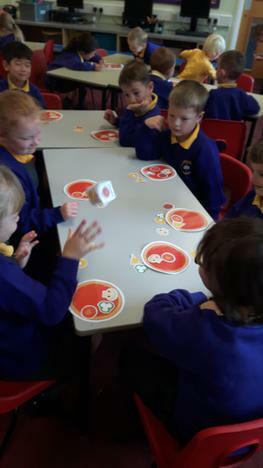 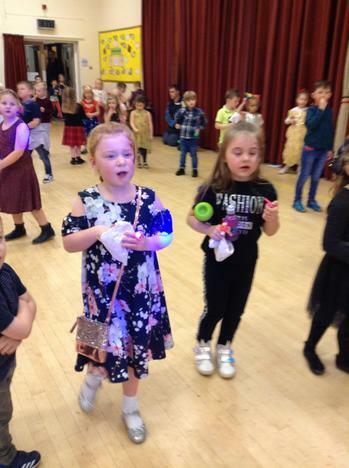 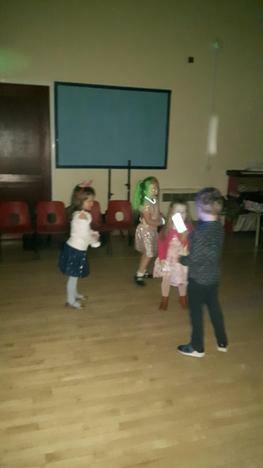 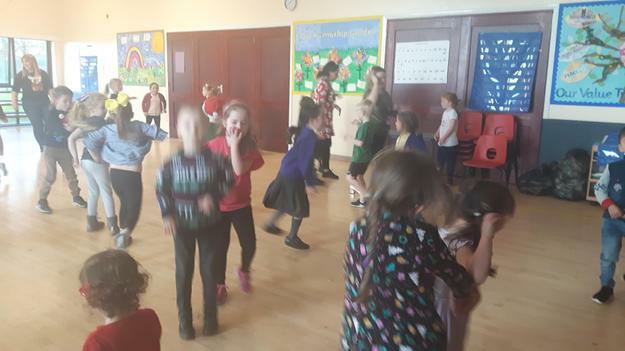 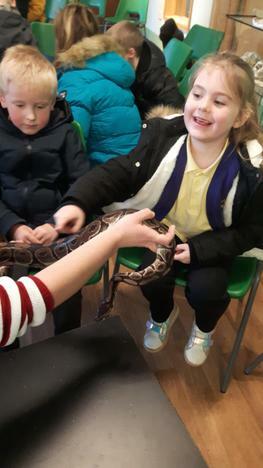 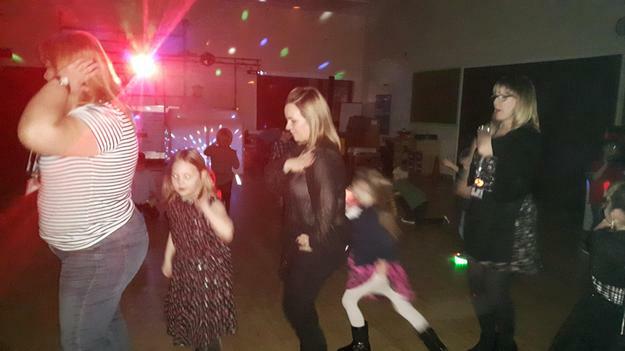 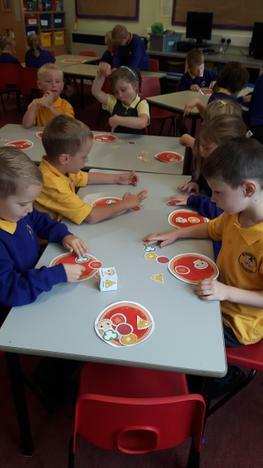 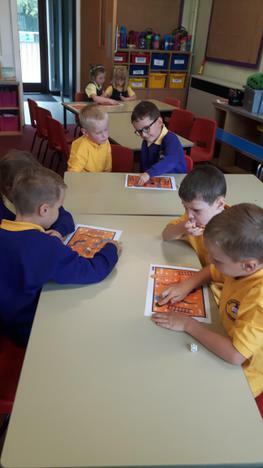 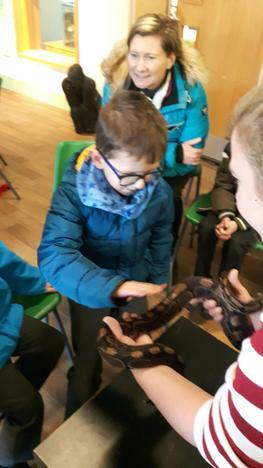 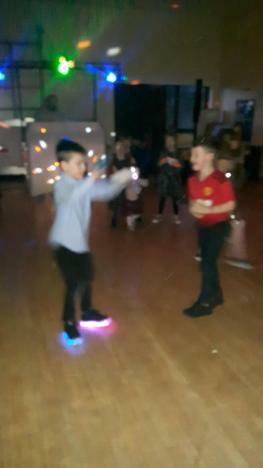 The children made sure the rules they set for the adults were centred around helping thechildren to learn, keeping them safe and keeping things fair. 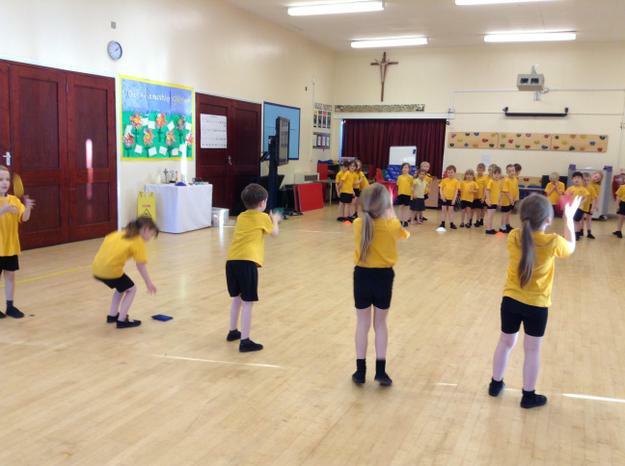 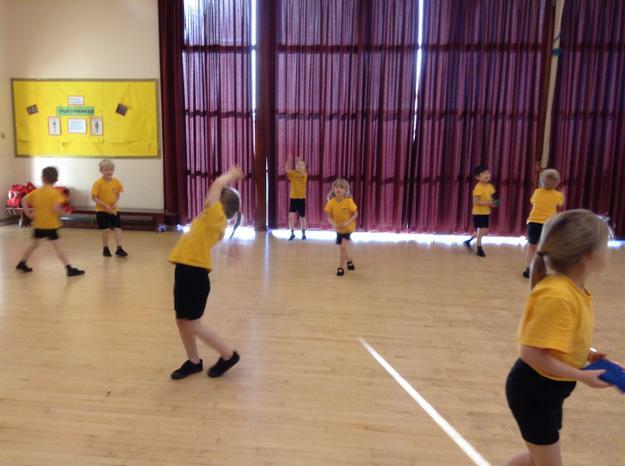 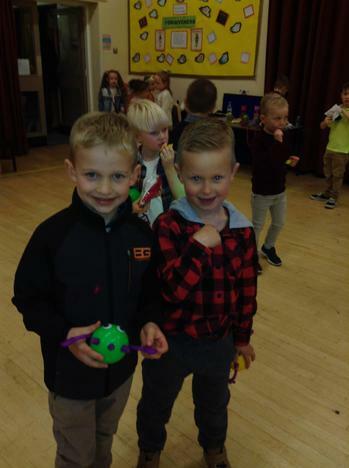 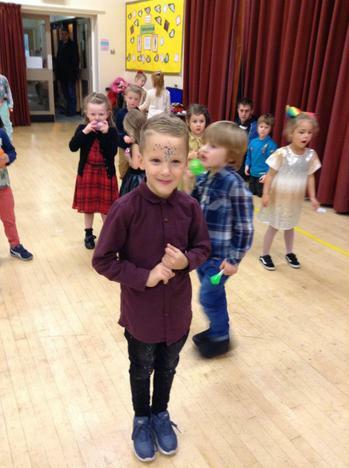 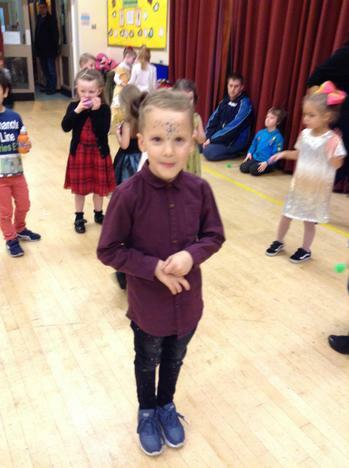 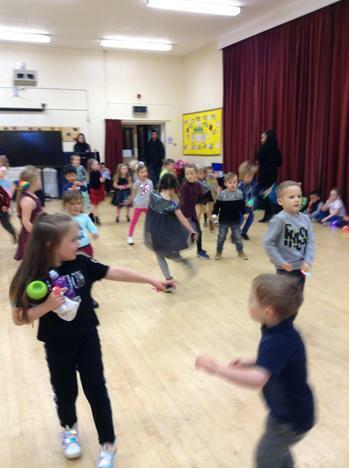 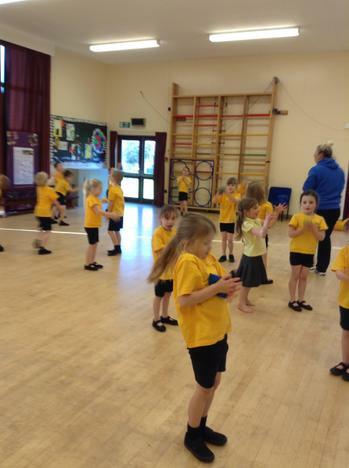 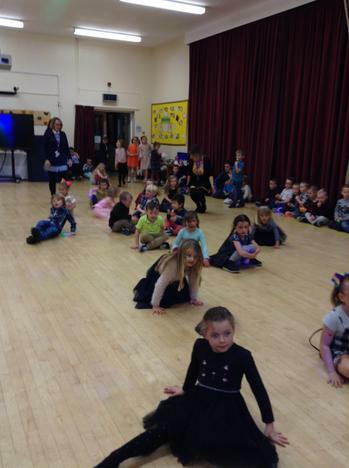 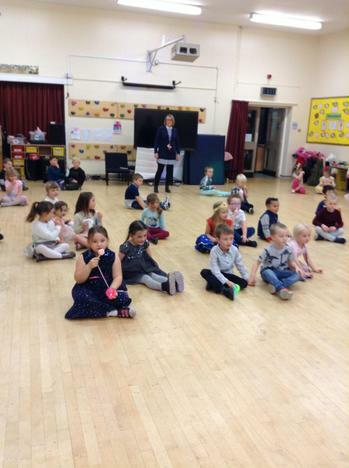 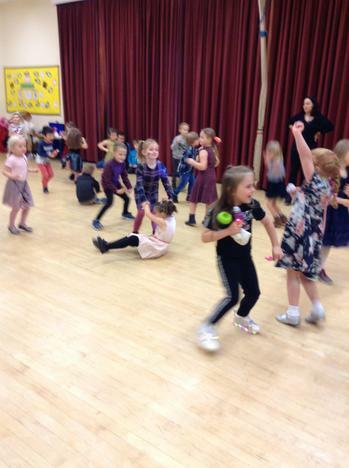 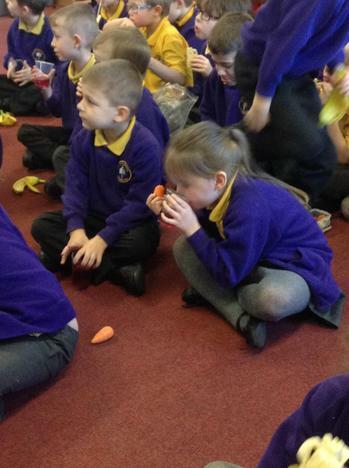 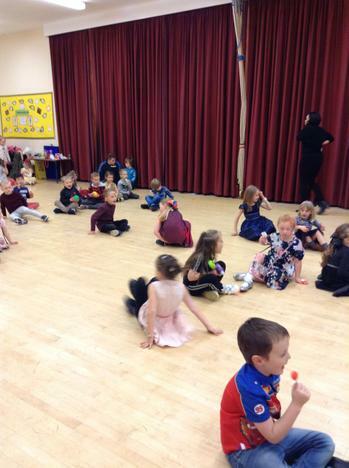 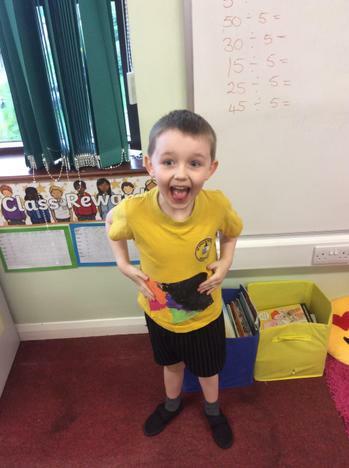 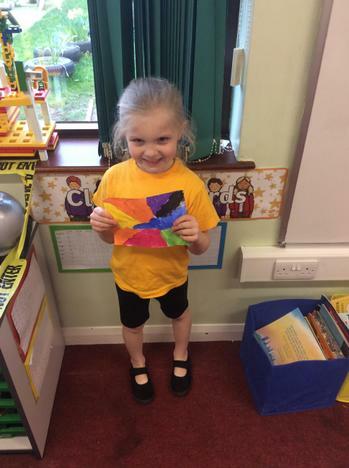 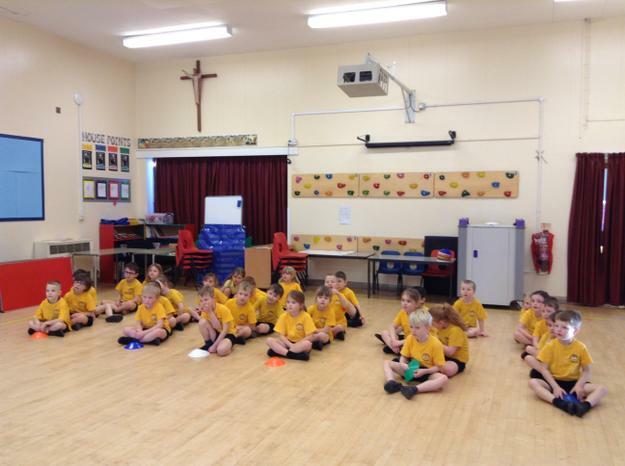 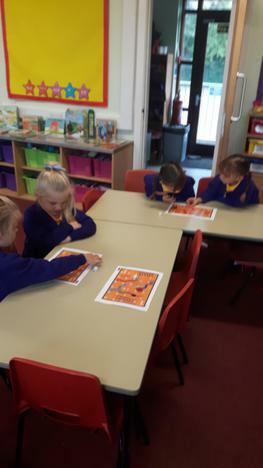 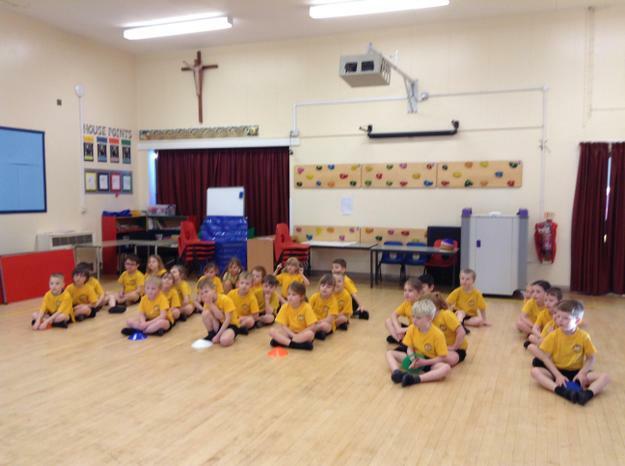 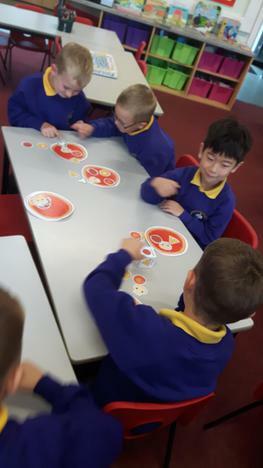 Here are some photos of the children taking part in the games on their first day in Year 1. 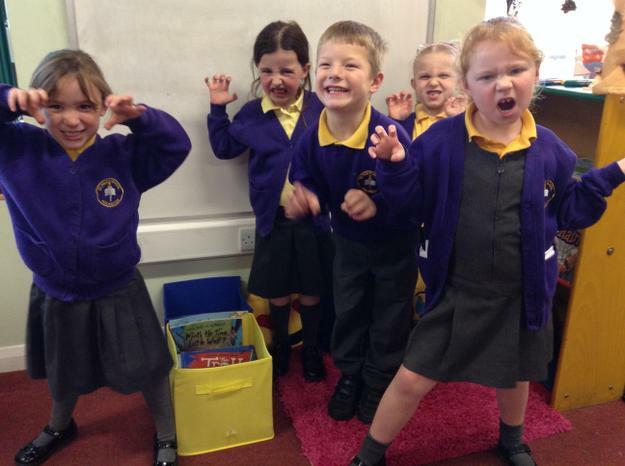 Welcome back to school after the summer holidays. 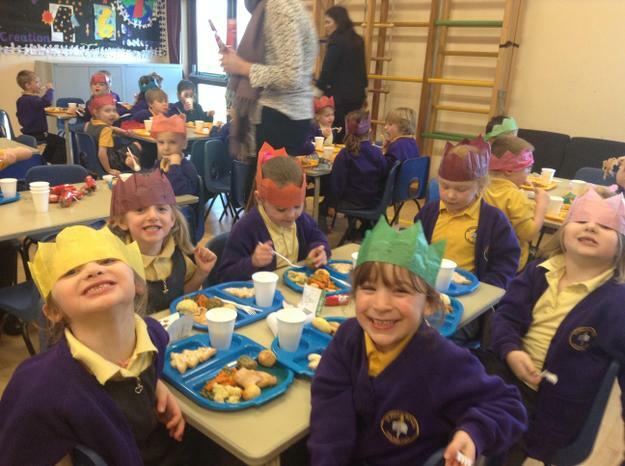 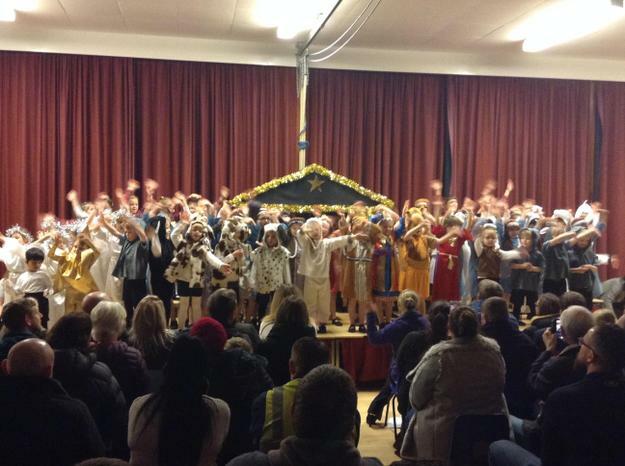 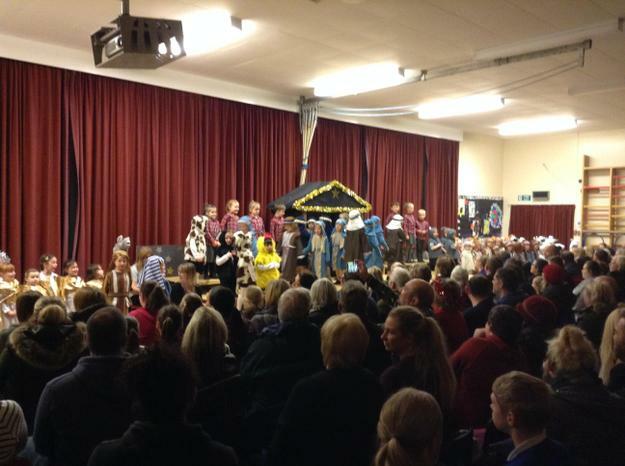 We hope you and your children enjoyed the six week break. 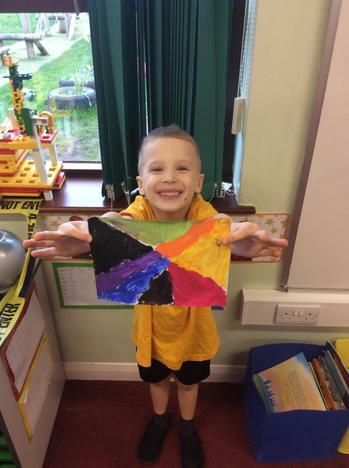 We are looking forward to all the exciting teaching and learning activities we will be providing your children with over the coming academic year and are sure your children will enjoy the different topics we will be covering in our creative curriculum. 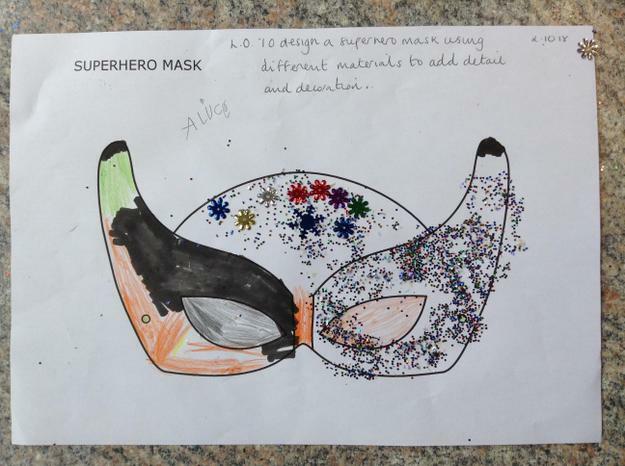 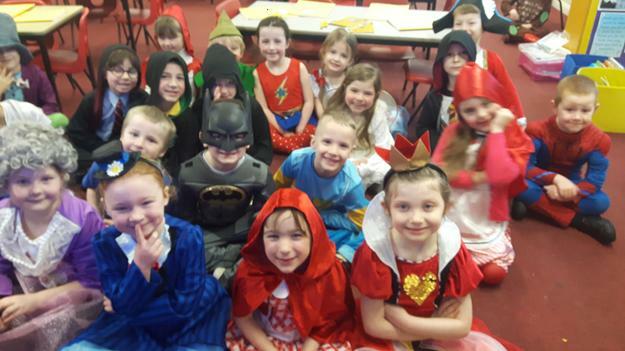 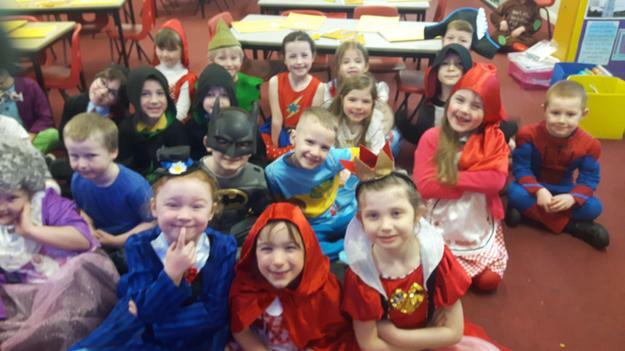 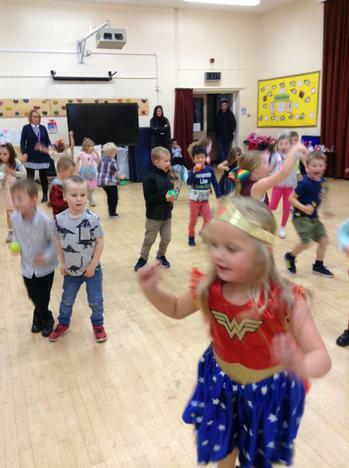 Our first topic for this half term will be Superheroes. 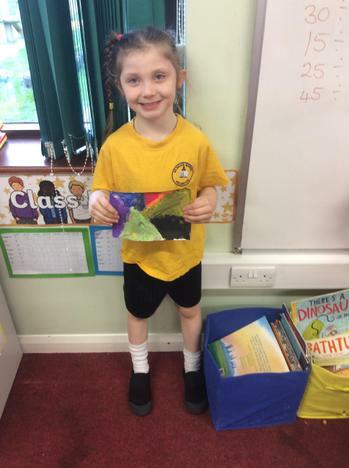 This week your child will start to bring home their home school diaries, reading books, library books, homework and spellings. 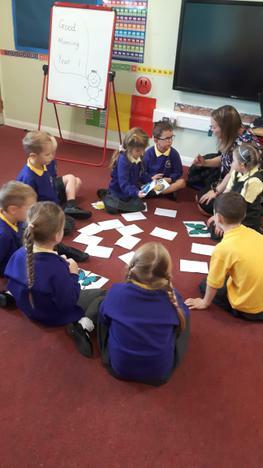 We will go through all the information you may need about these things at our 'Meet the Teacher' session on Tuesday but for anyone who can't make the meeting we will send the information sheets home on Wednesday. 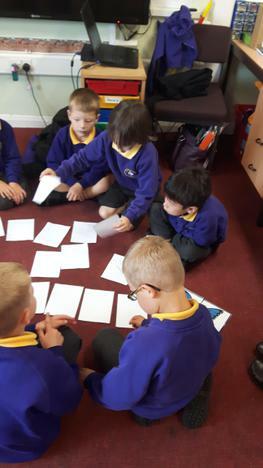 If you have any questions or queries about any of the information included, please feel free to ask anyone in the Year 1 team. 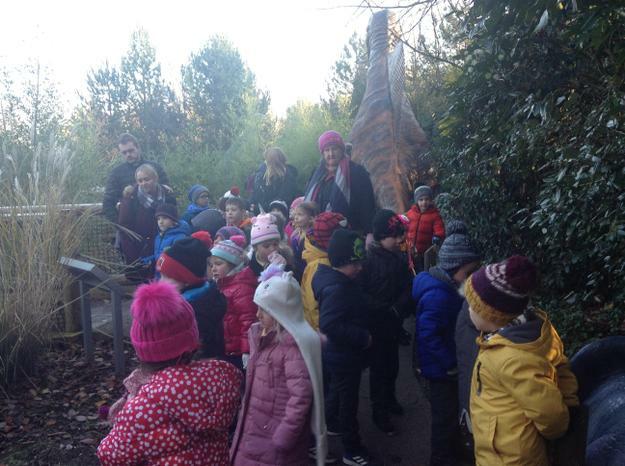 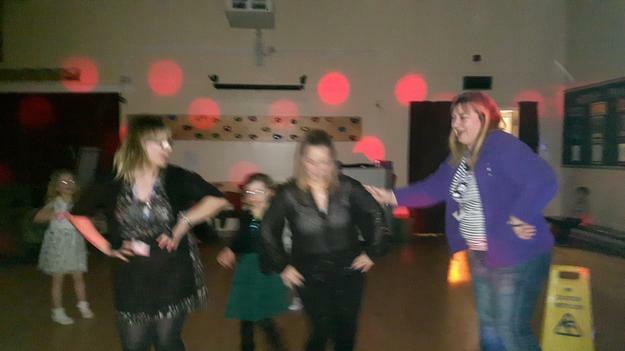 Mrs Chidgey and Mrs Dearden.